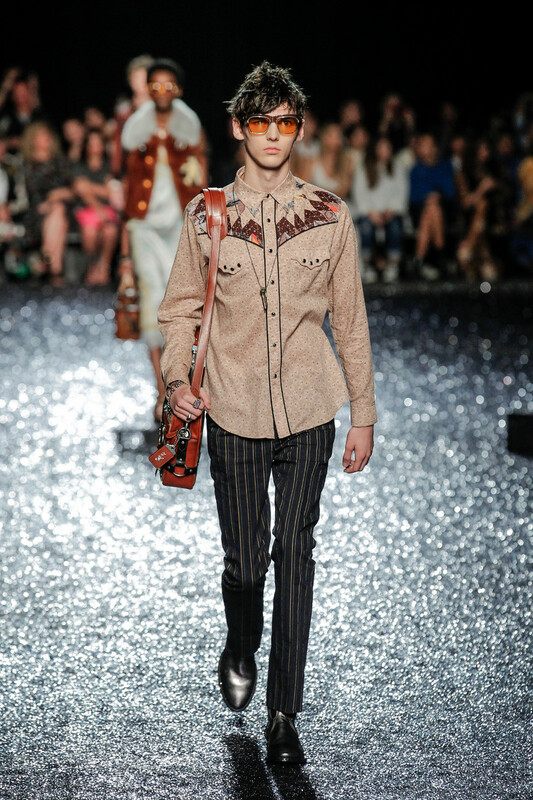 Coach-designer Stuart Vevers continued his celebration of American heritage — but this time, it came with an upgrade. 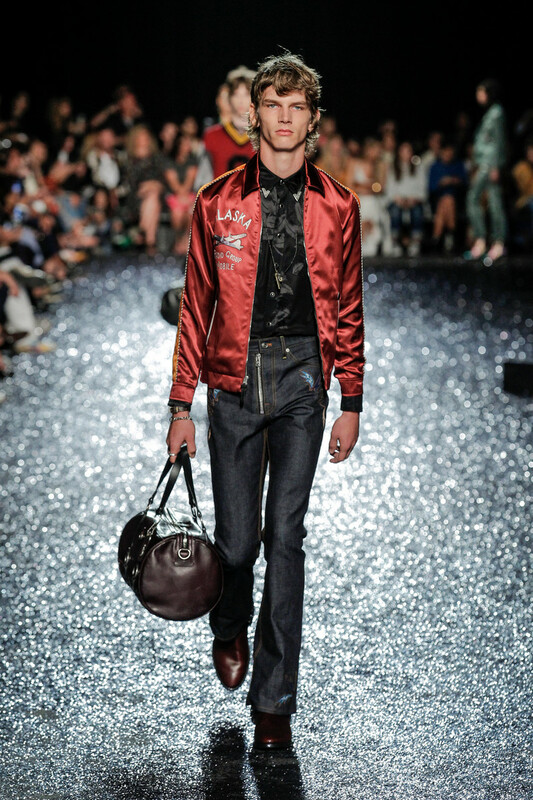 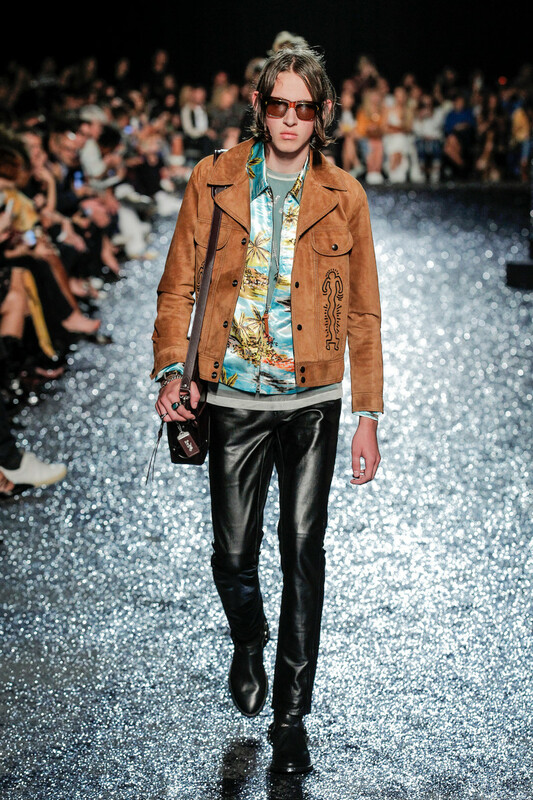 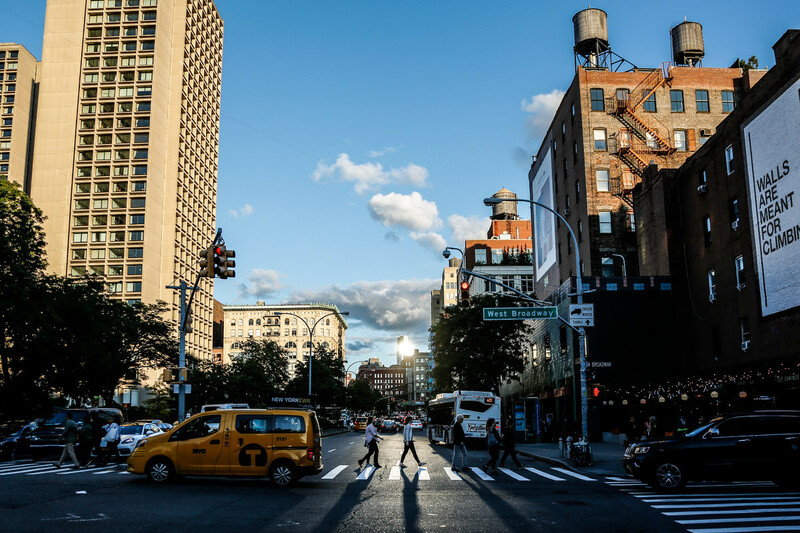 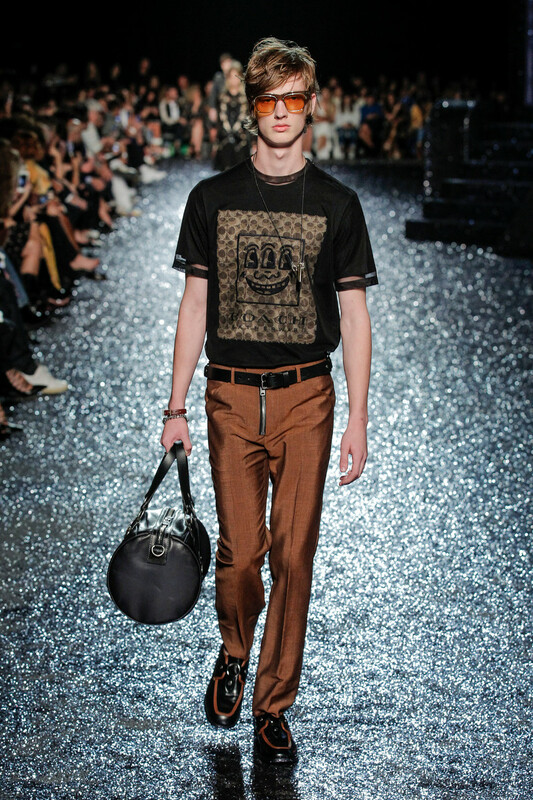 During his spring show at Basketball City, a departure from his former home on the West Side Highway, Vevers teamed with Stefan Beckman to create a glittery set filled with New York rooftops, mailboxes and an antique car that served as a fitting backdrop for a playful, vibrant collection. 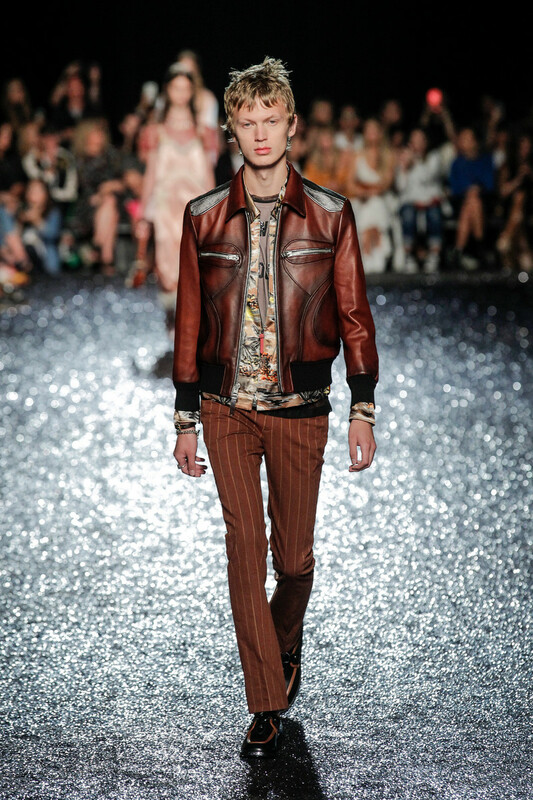 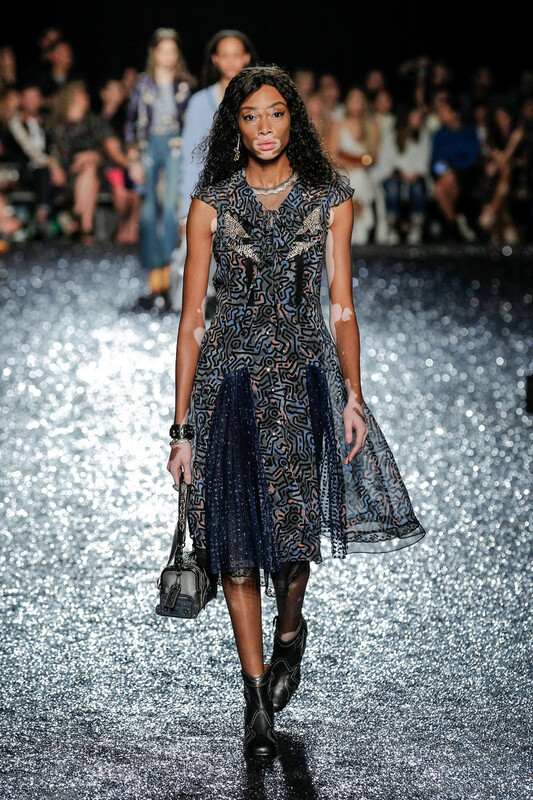 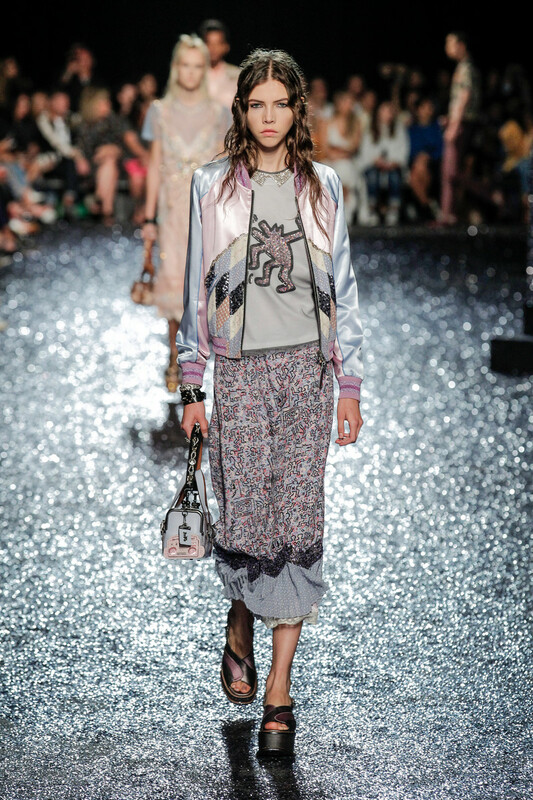 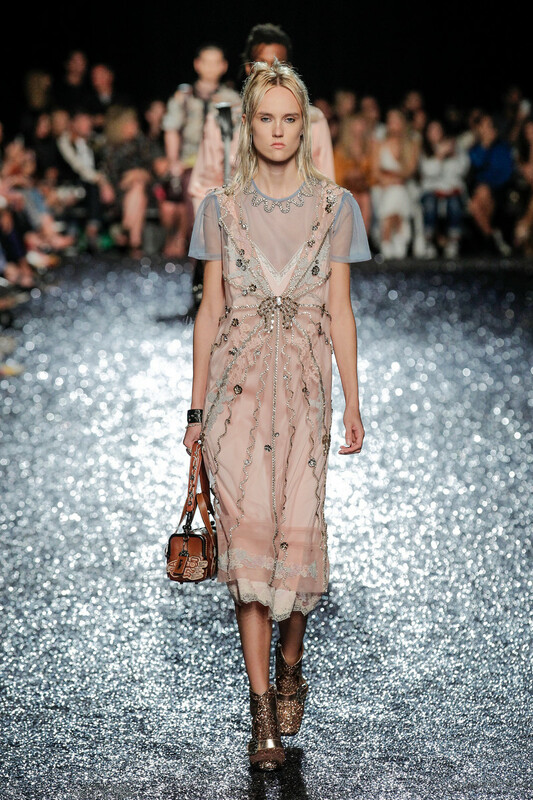 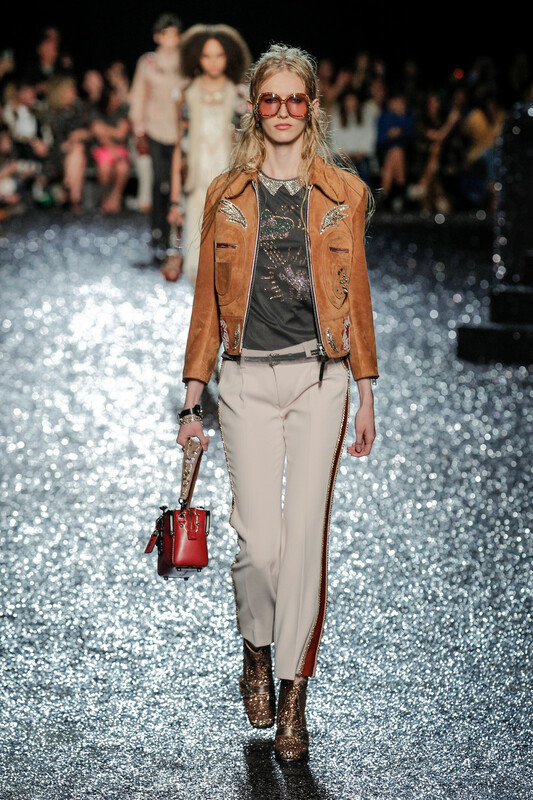 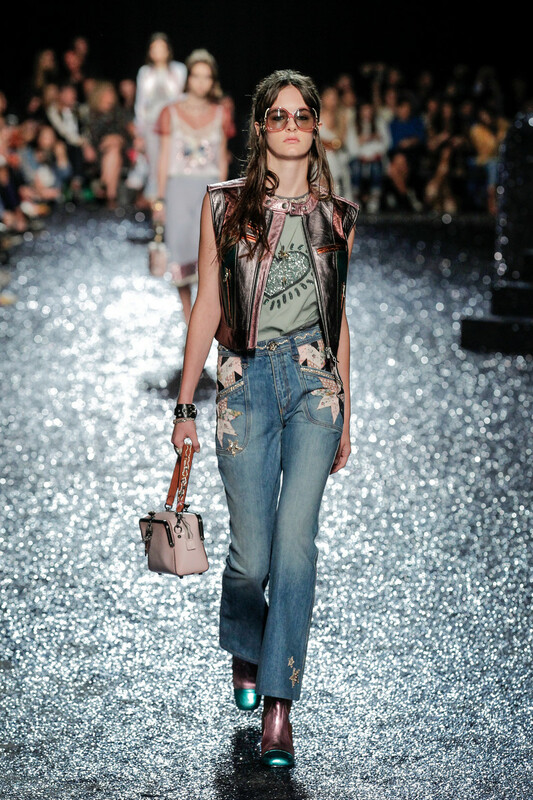 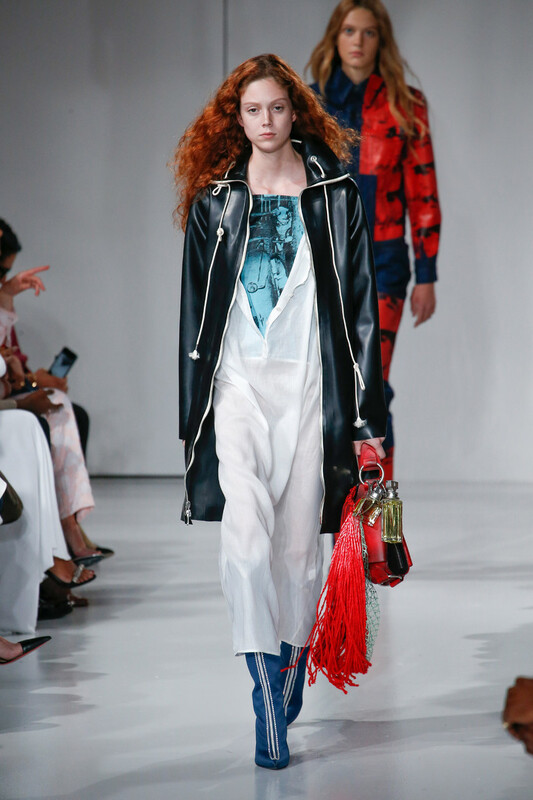 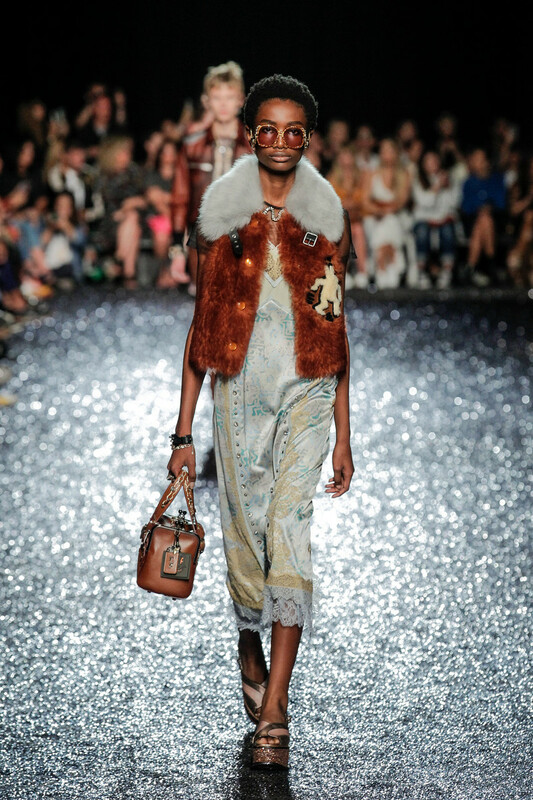 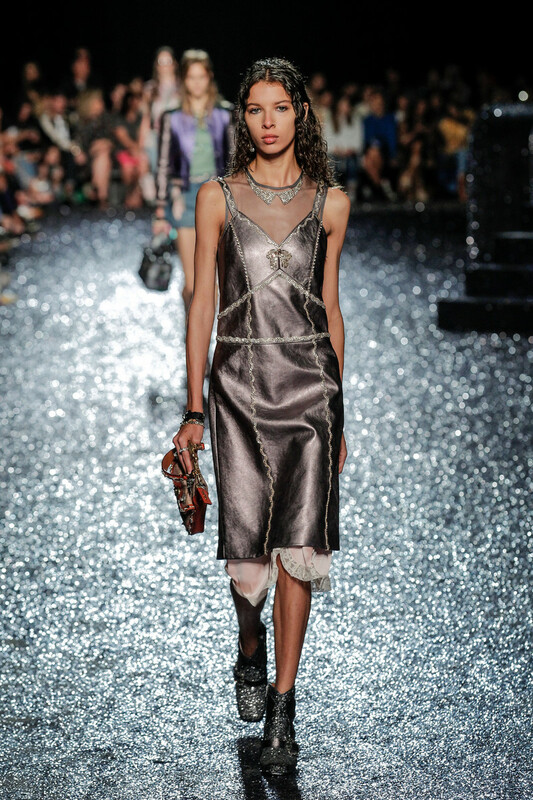 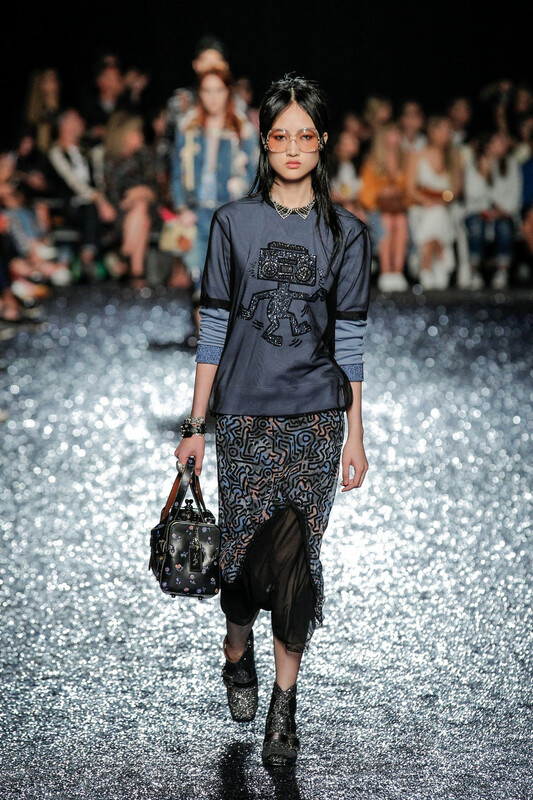 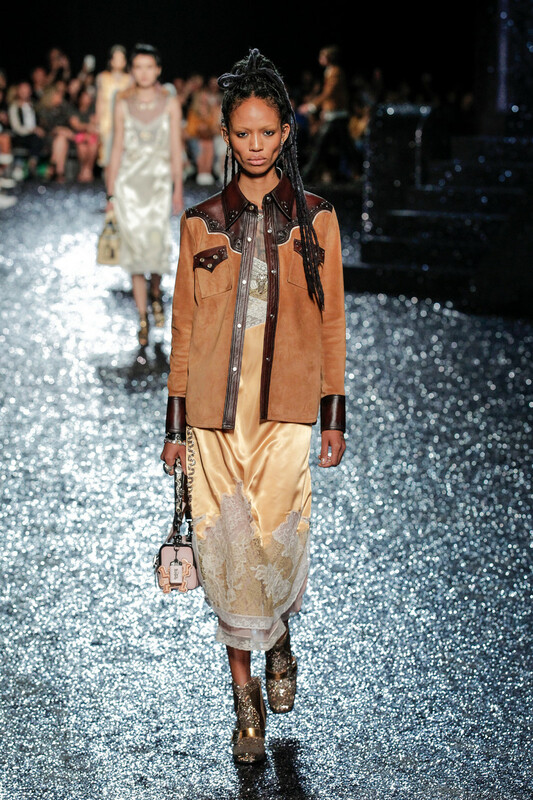 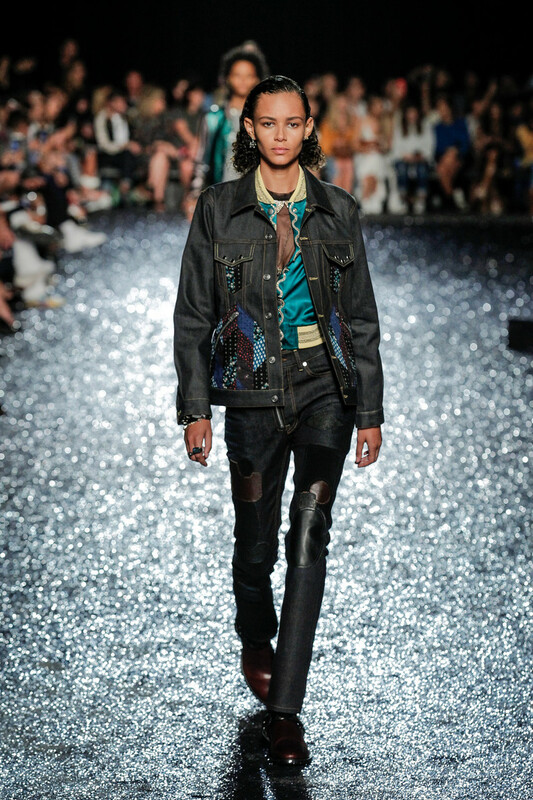 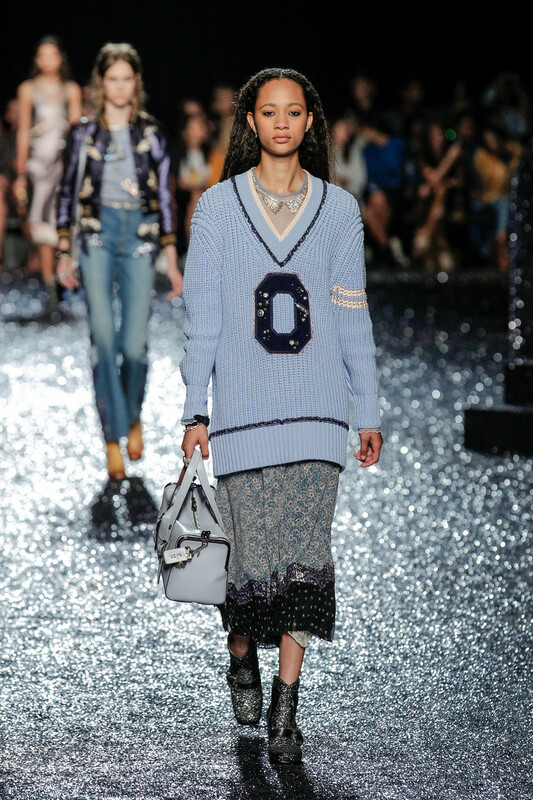 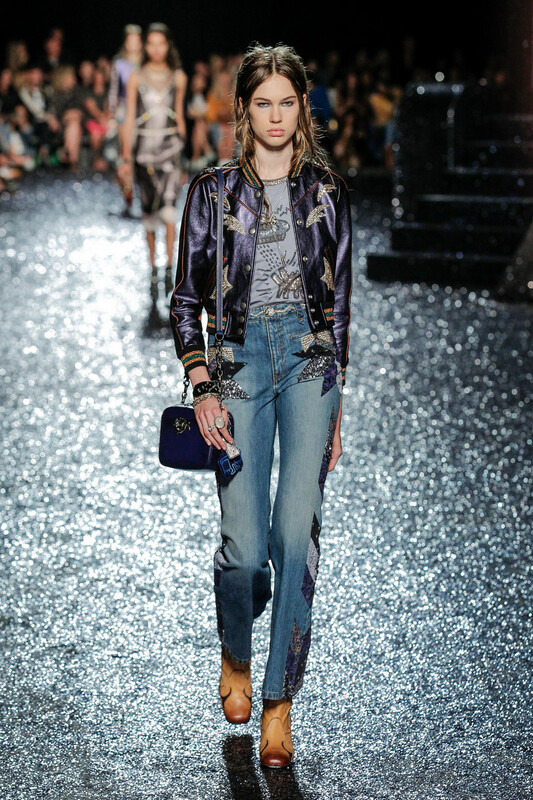 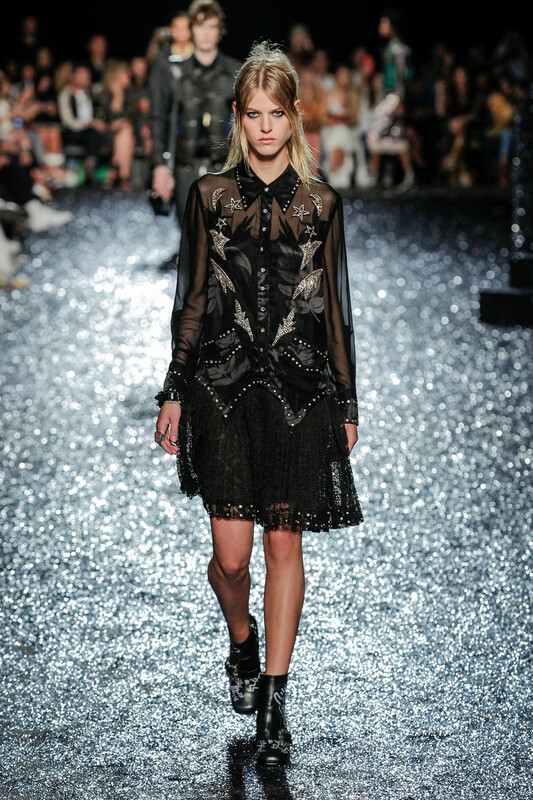 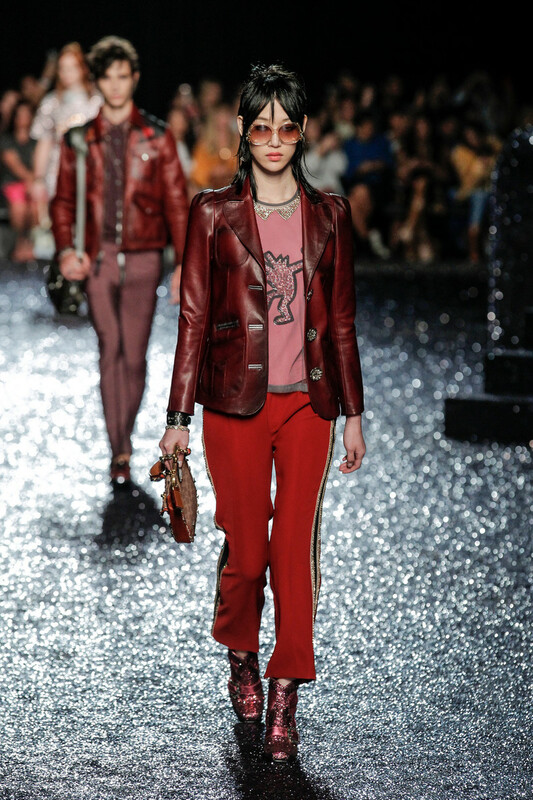 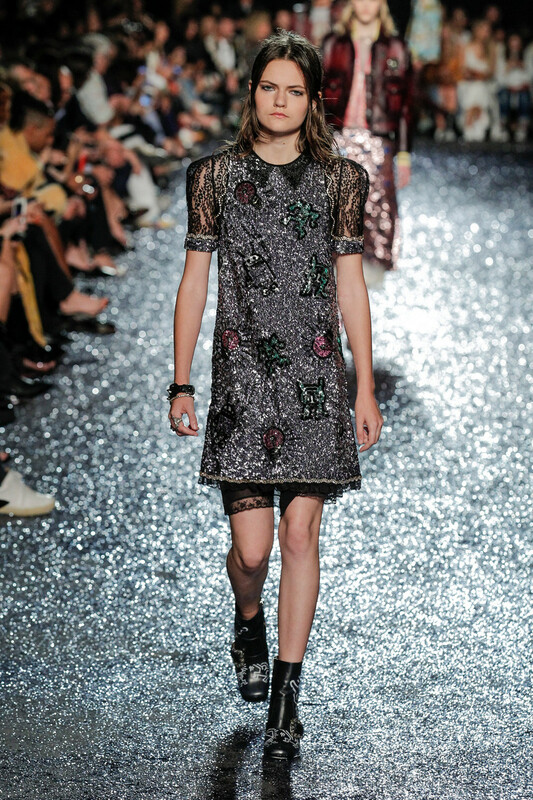 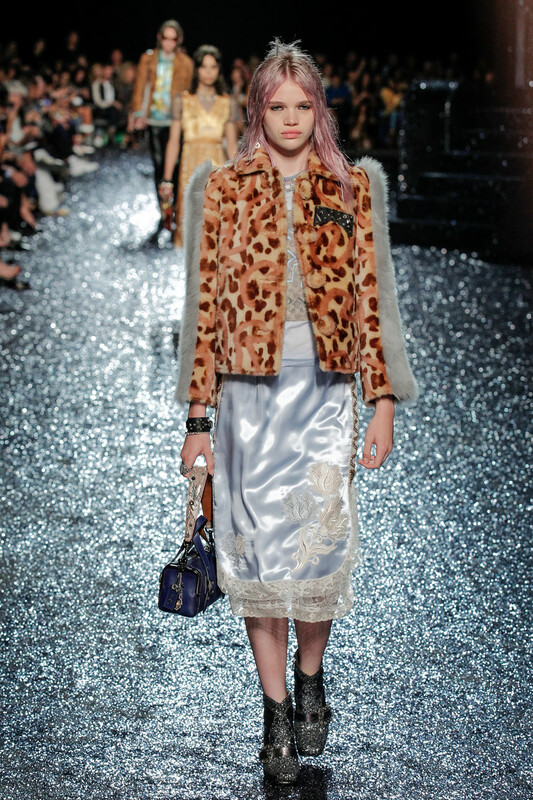 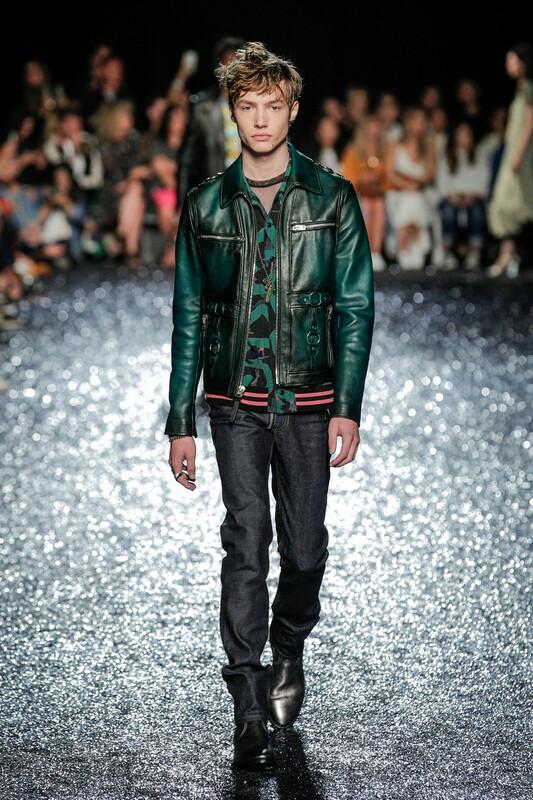 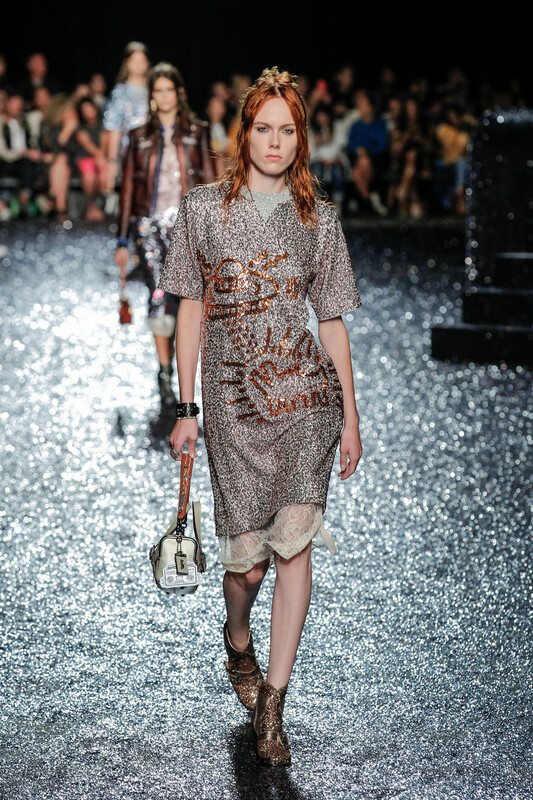 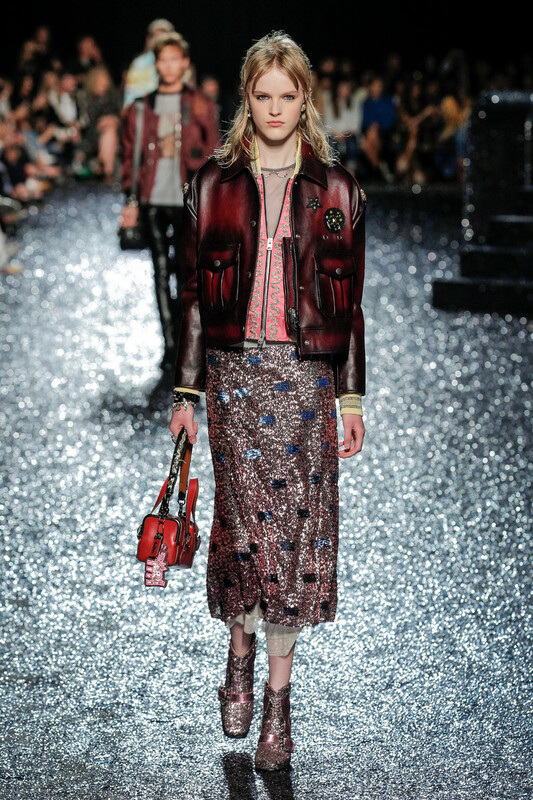 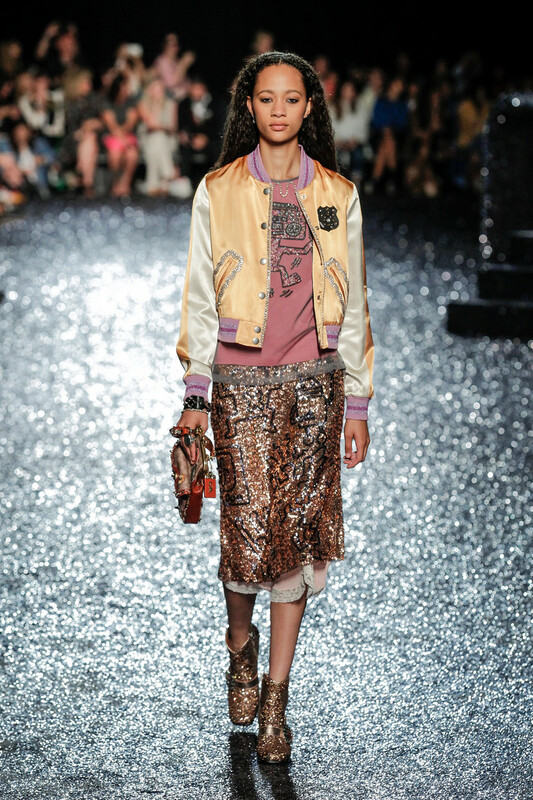 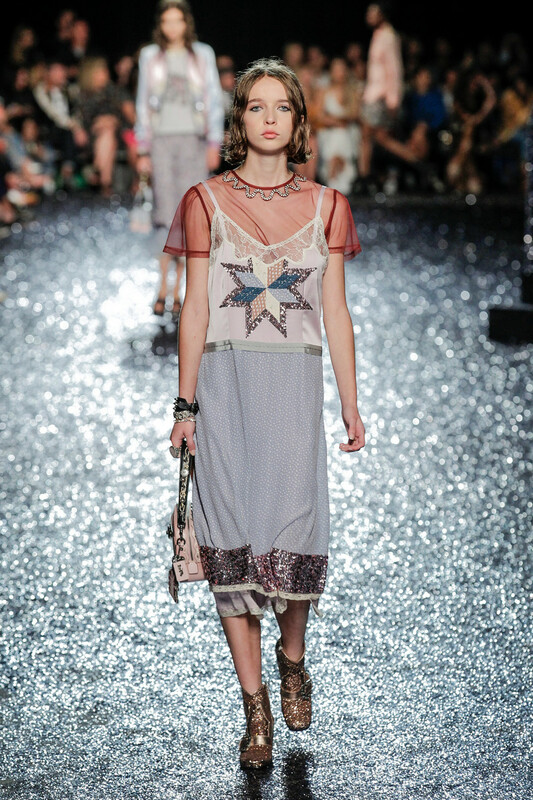 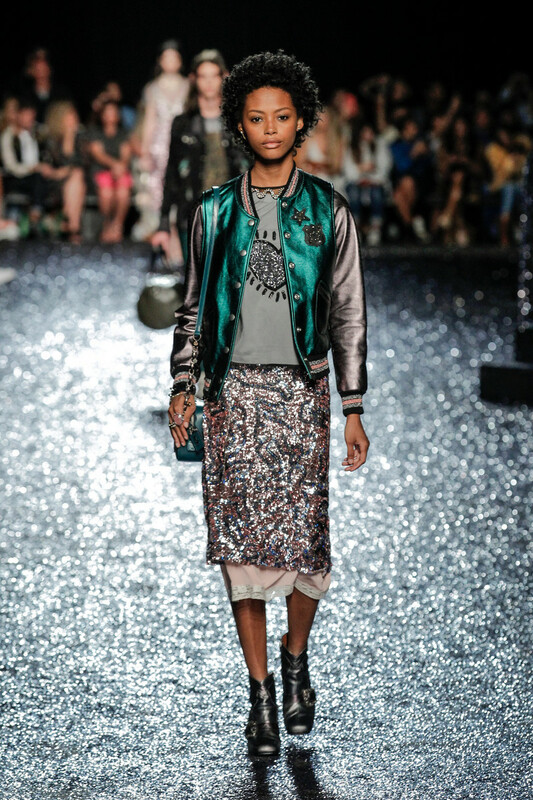 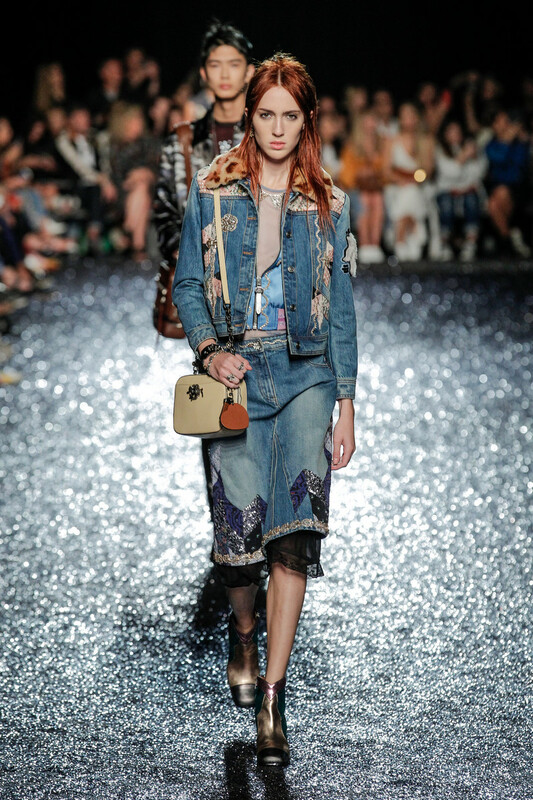 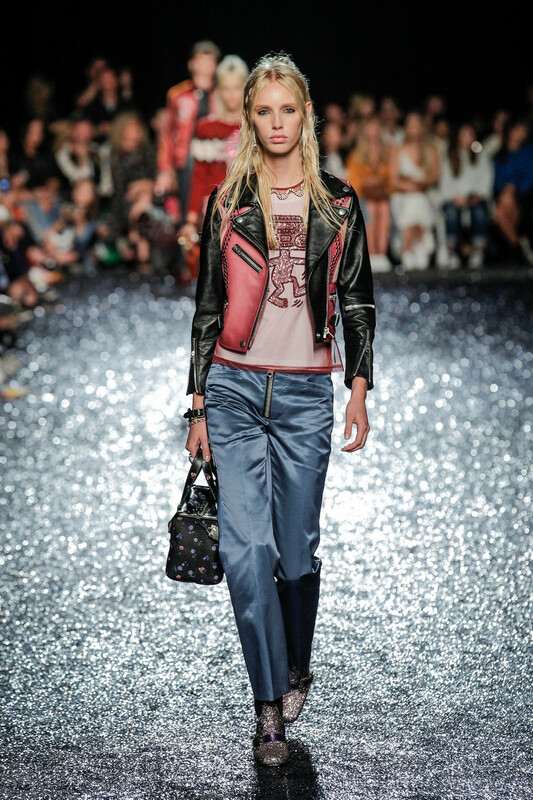 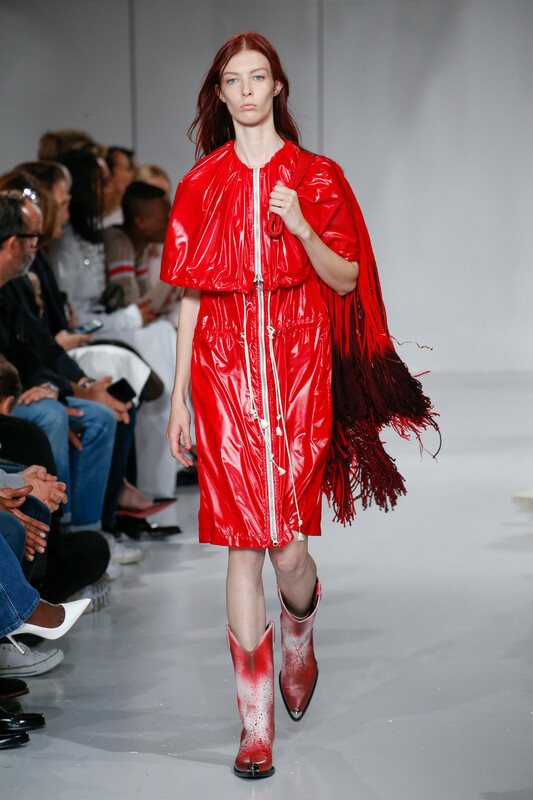 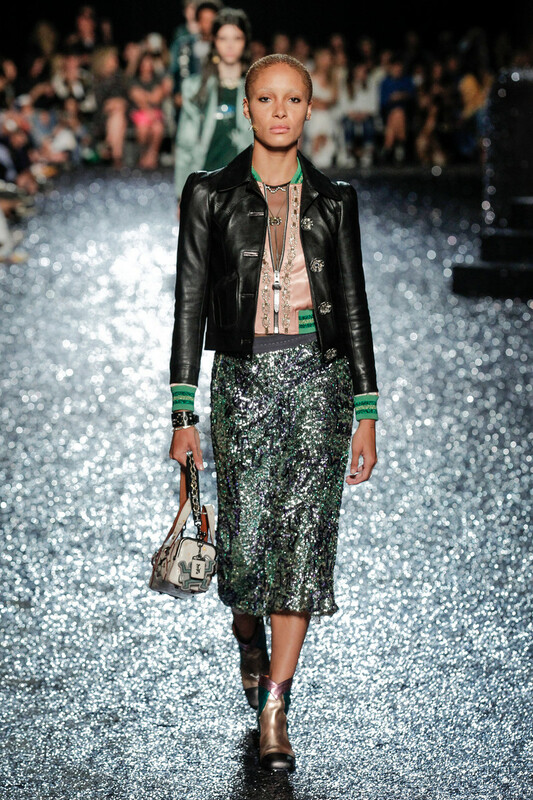 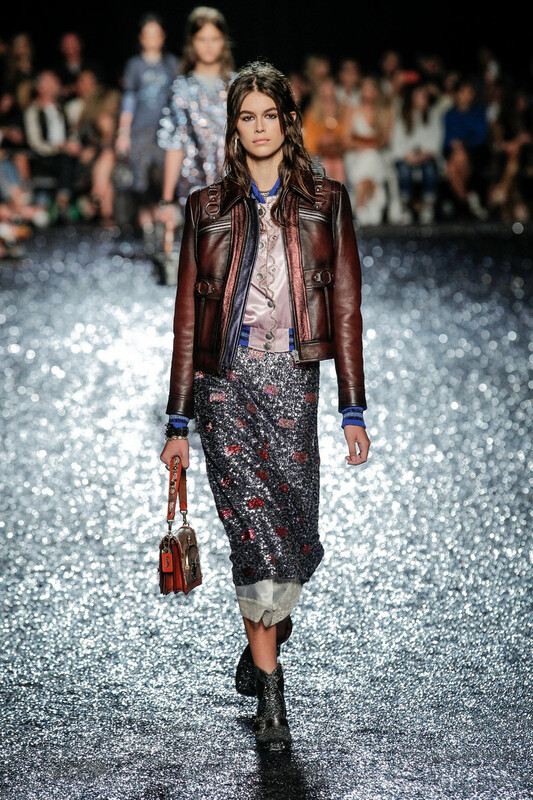 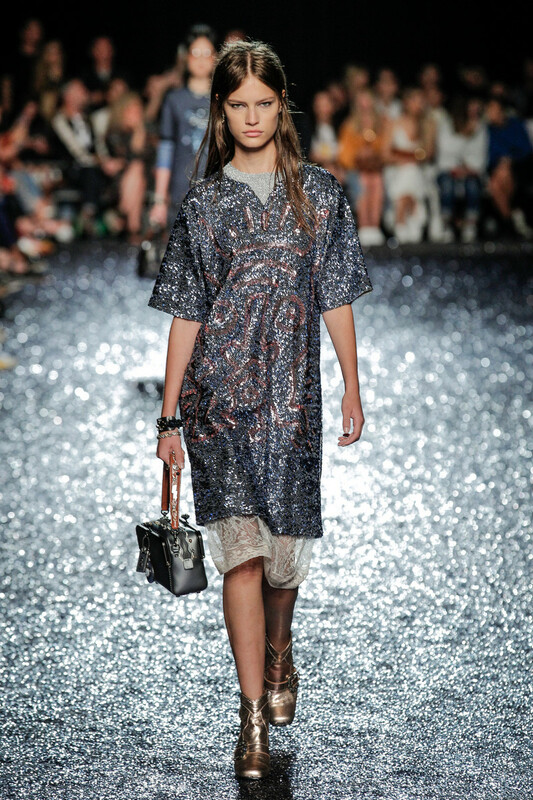 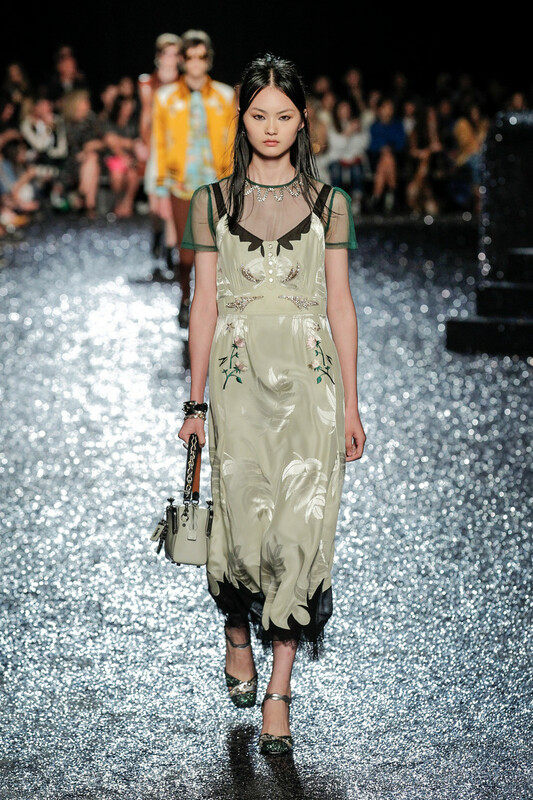 Staple pieces such as prairie dresses, varsity jackets and leather jackets got glam treatment with sequins, satin and lace, colorblocking, metallic embroideries and burnished hardware. 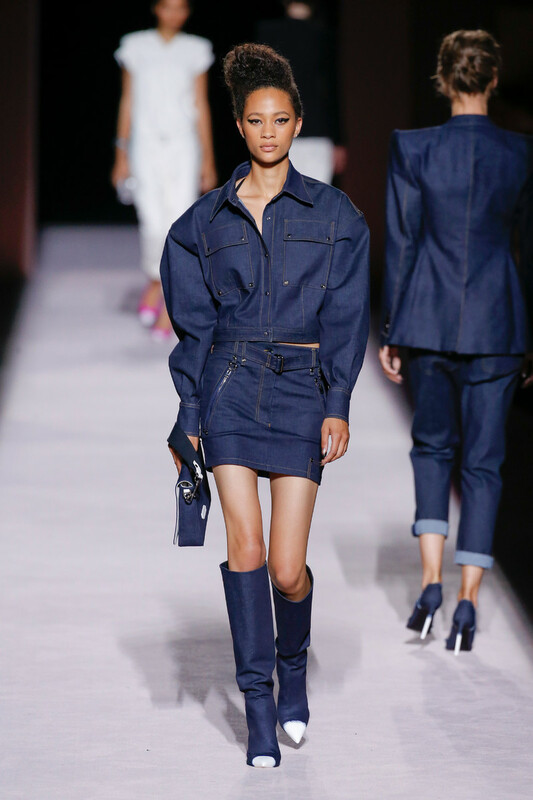 Denim marked a new step for the brand. 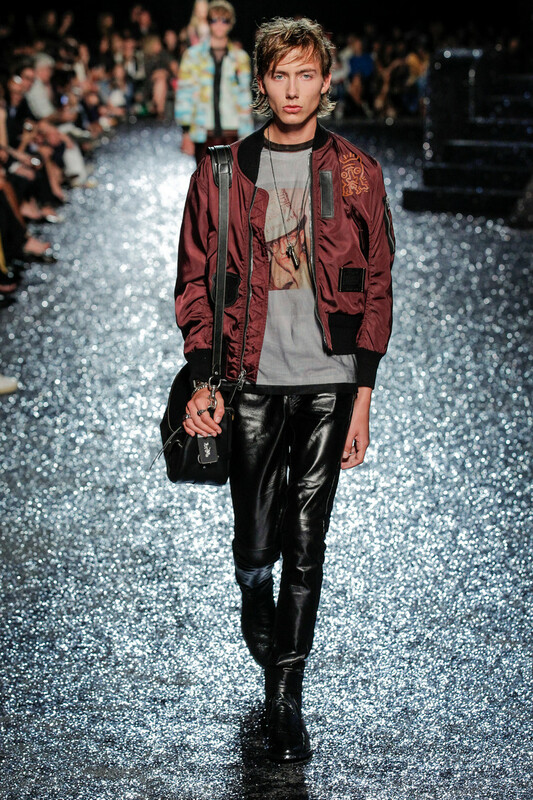 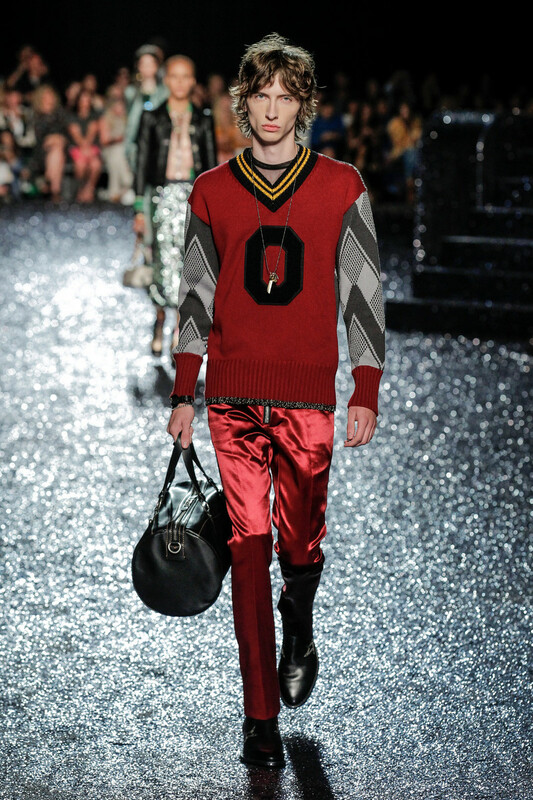 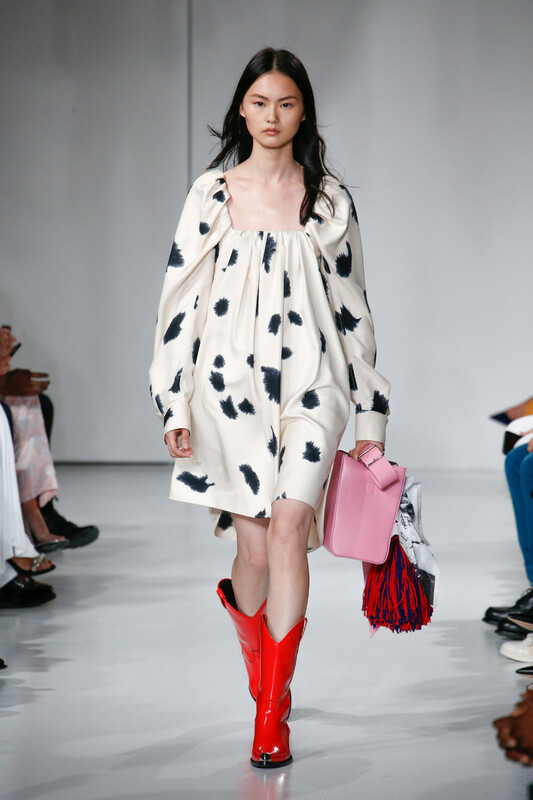 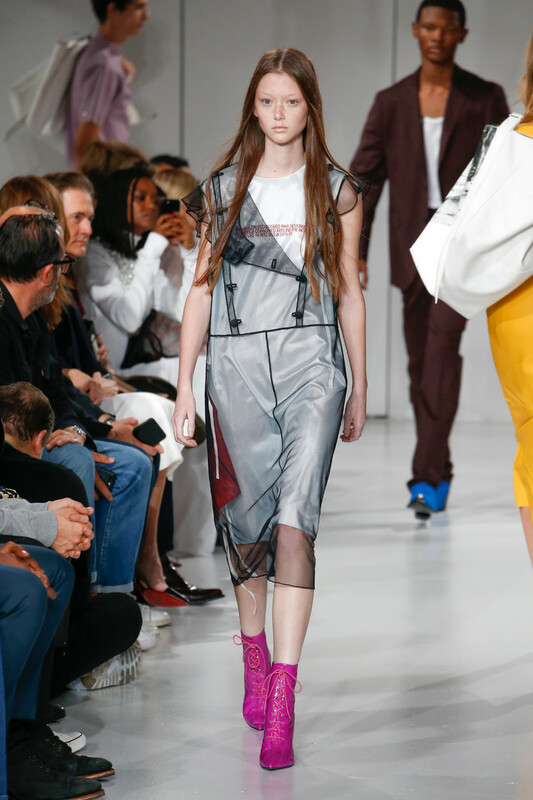 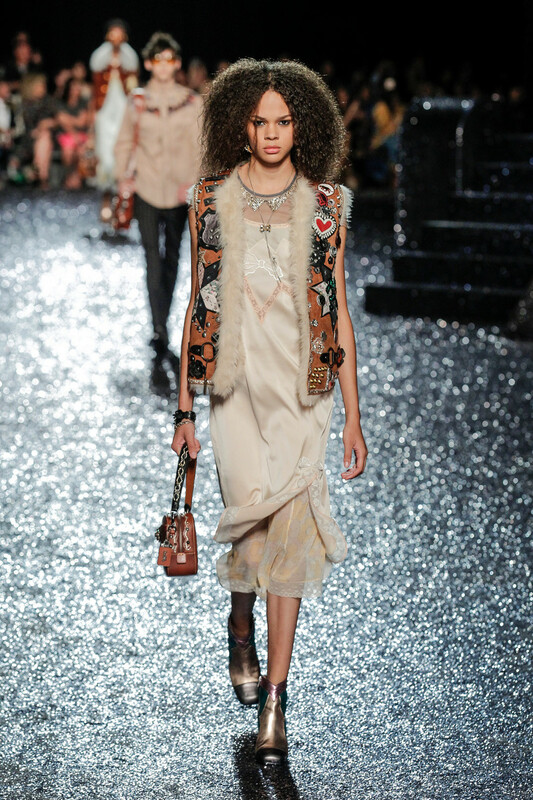 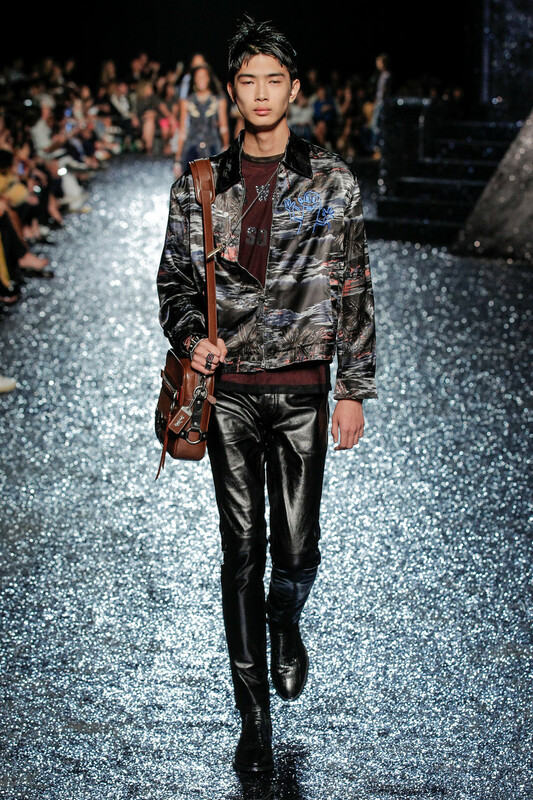 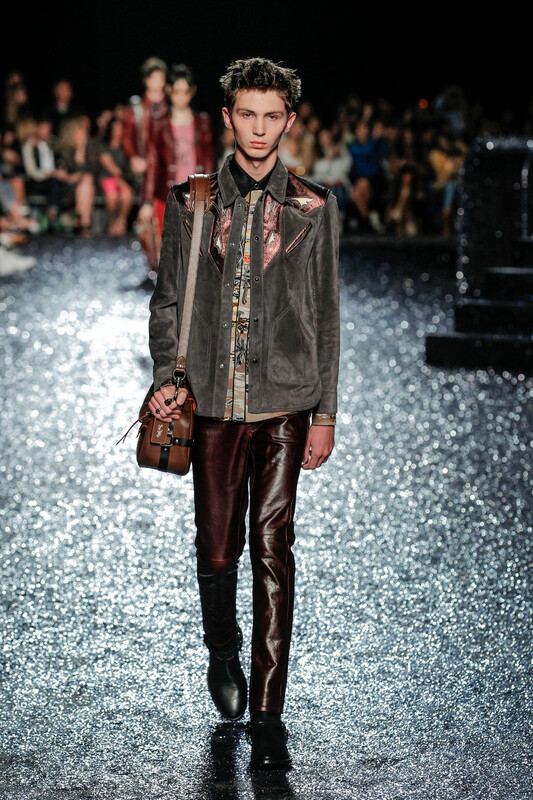 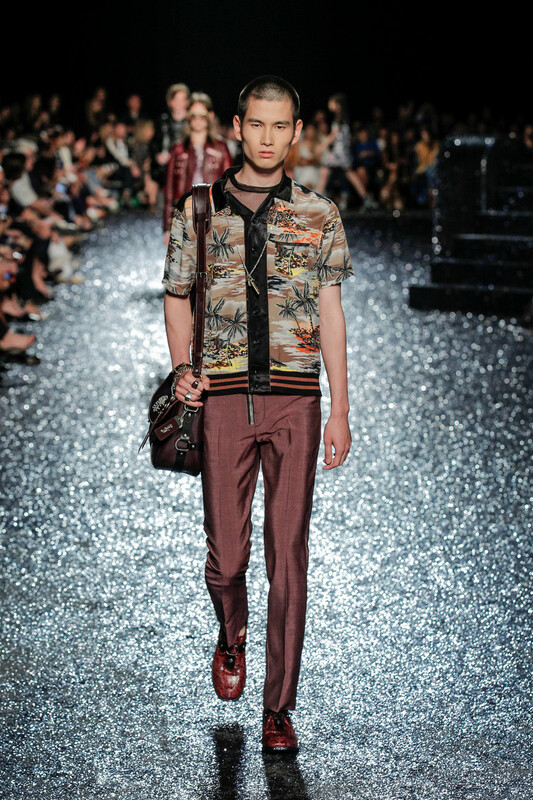 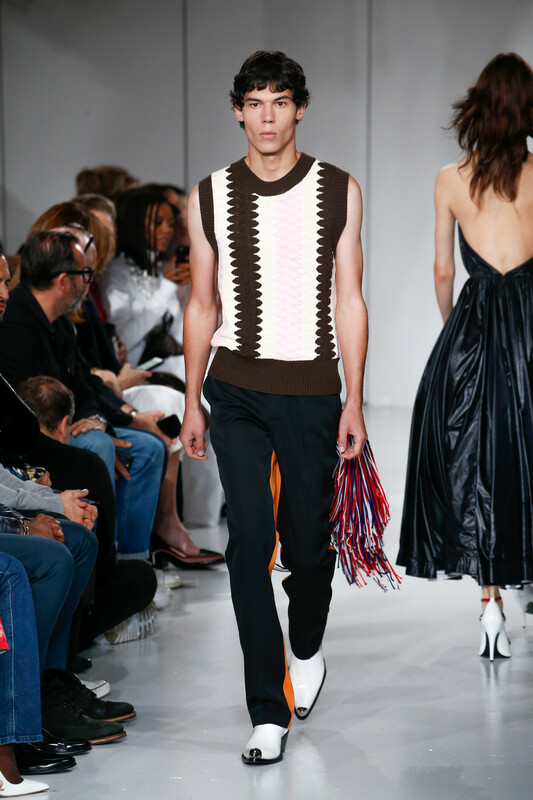 Vevers added retro patchwork designs that blended seamlessly with his celebration of Americana. 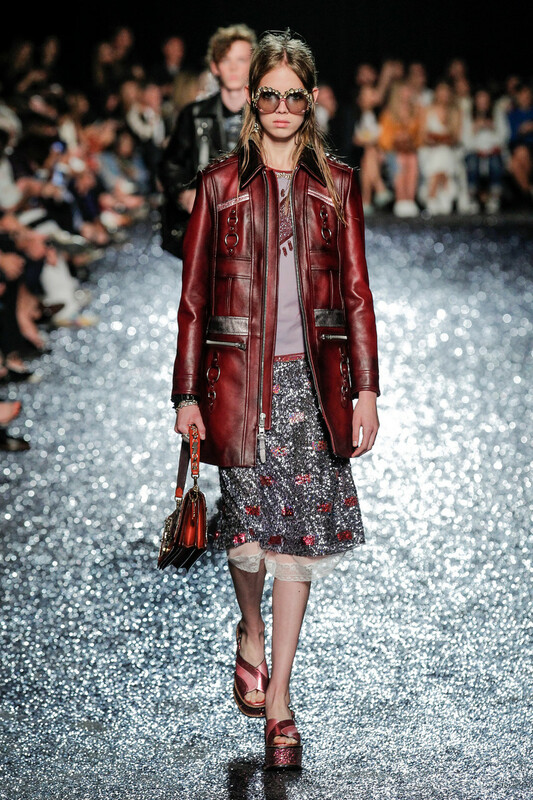 Coach’s archives also served Vevers well as he reinterpreted such classic pieces as the mailbox bag first created by Bonnie Cashin in 1972 and offered this time in a variety of colors and sizes. 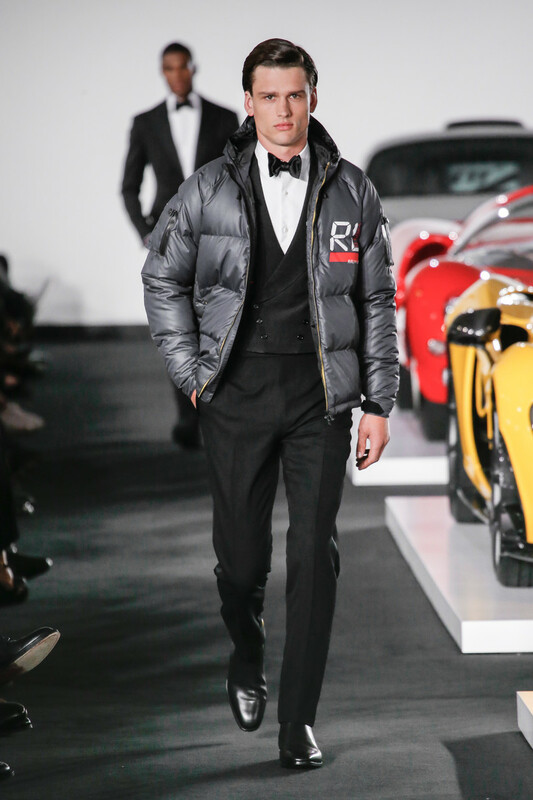 For the Coach man, it was all about attitude. 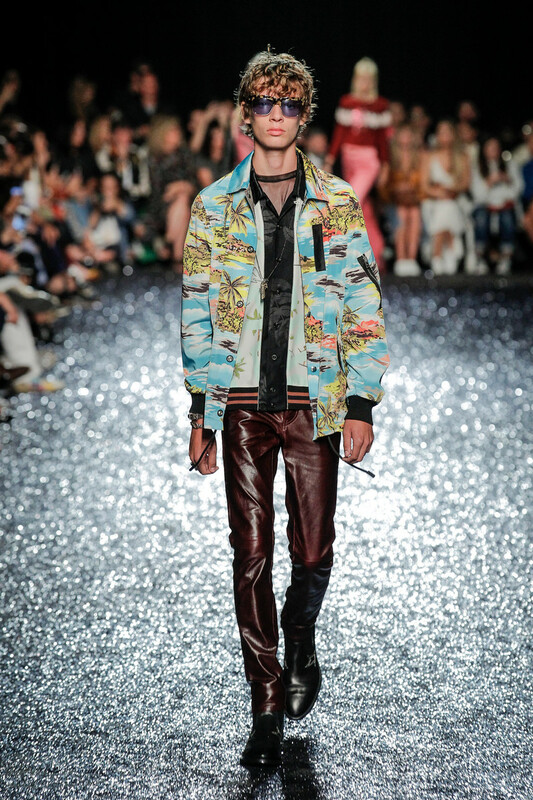 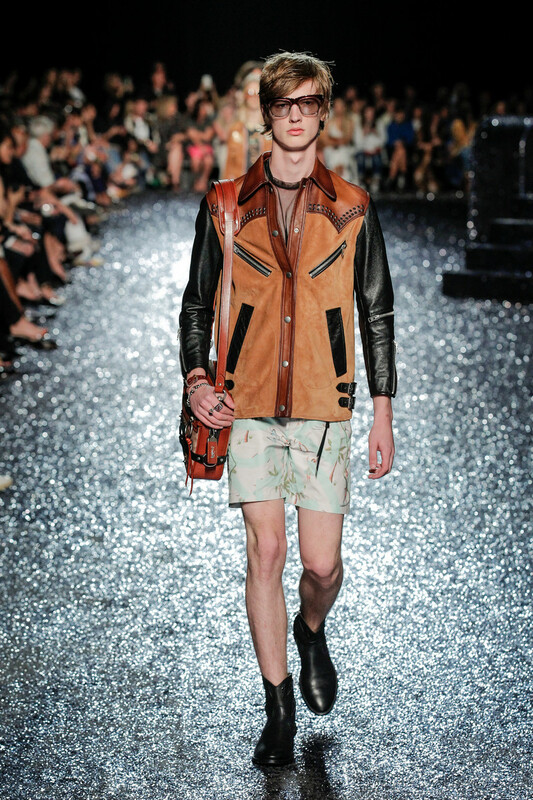 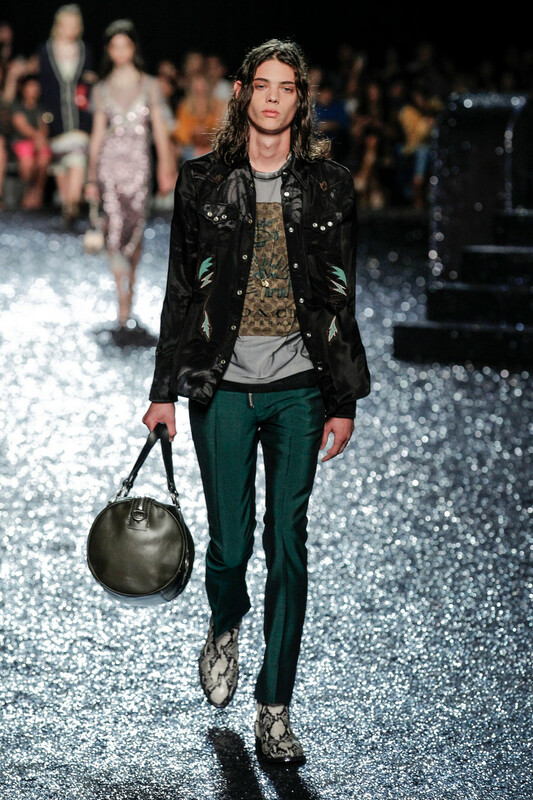 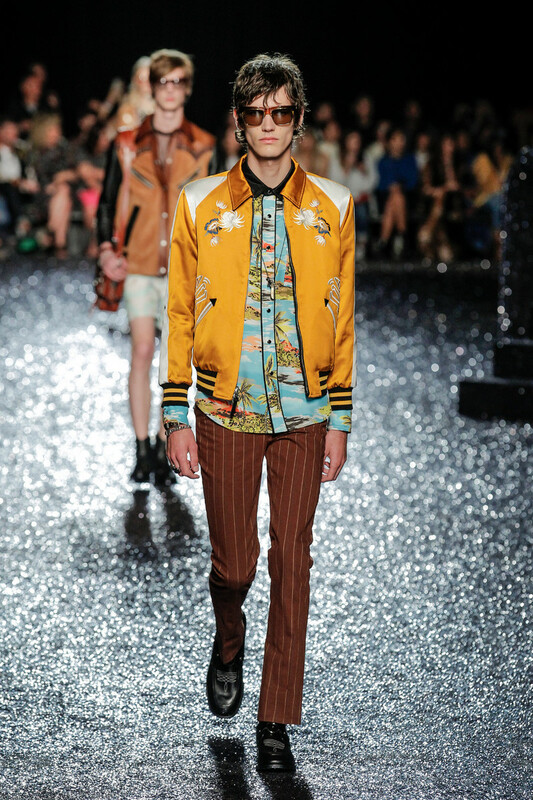 With Western-influences, mixed with Hawaii and sportswear. 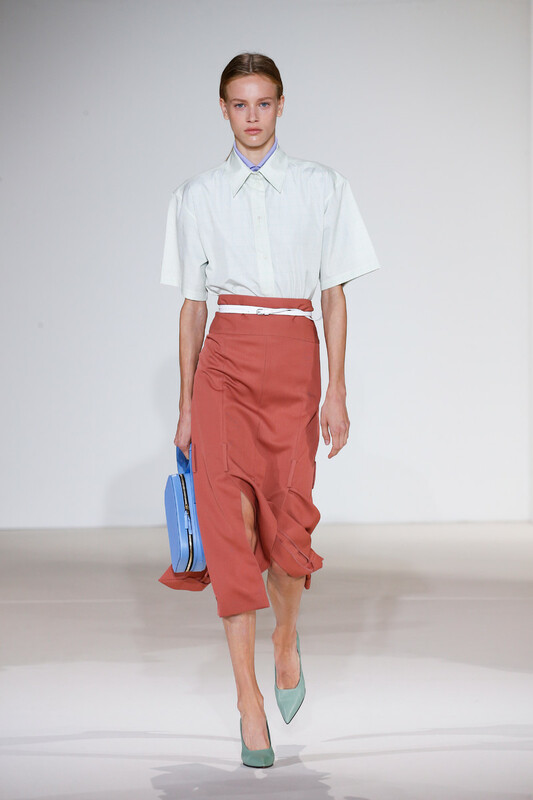 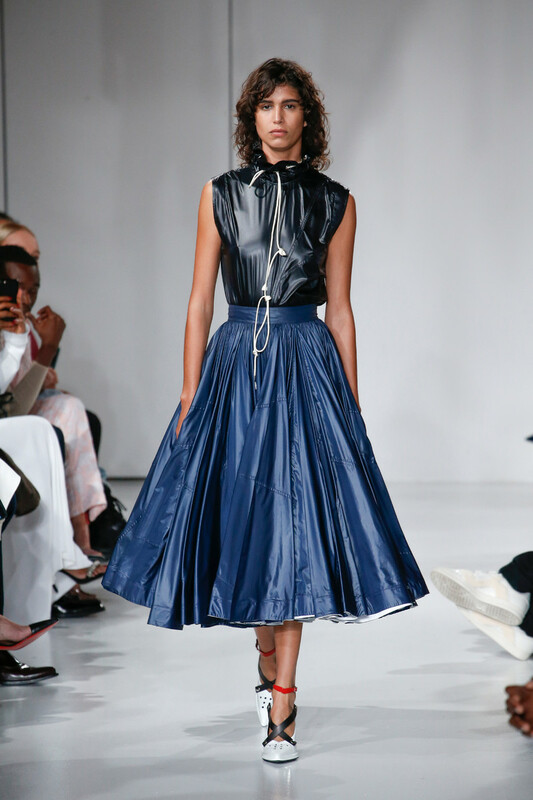 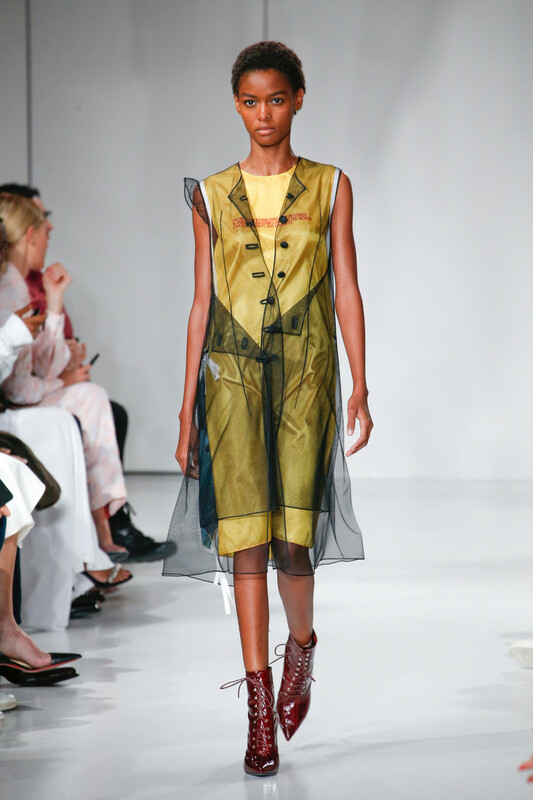 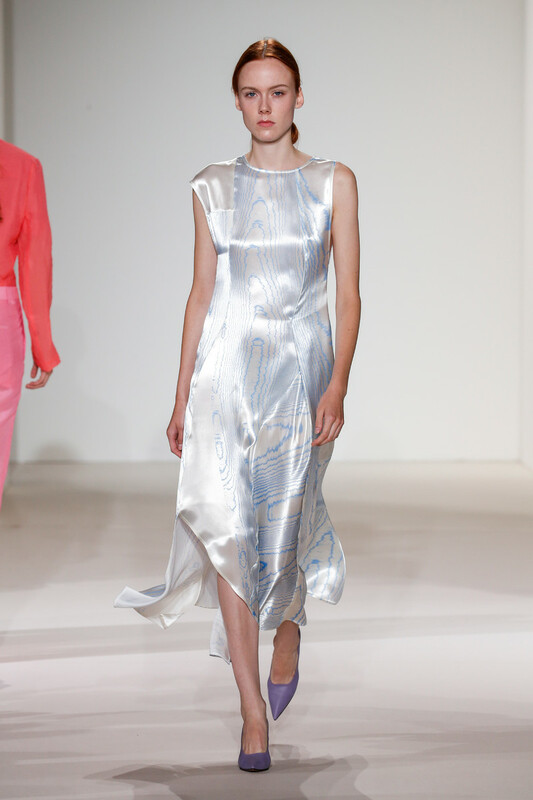 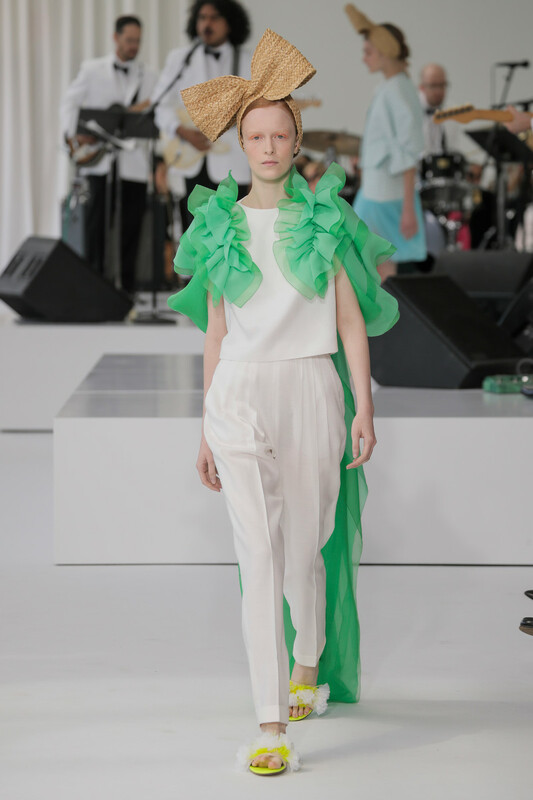 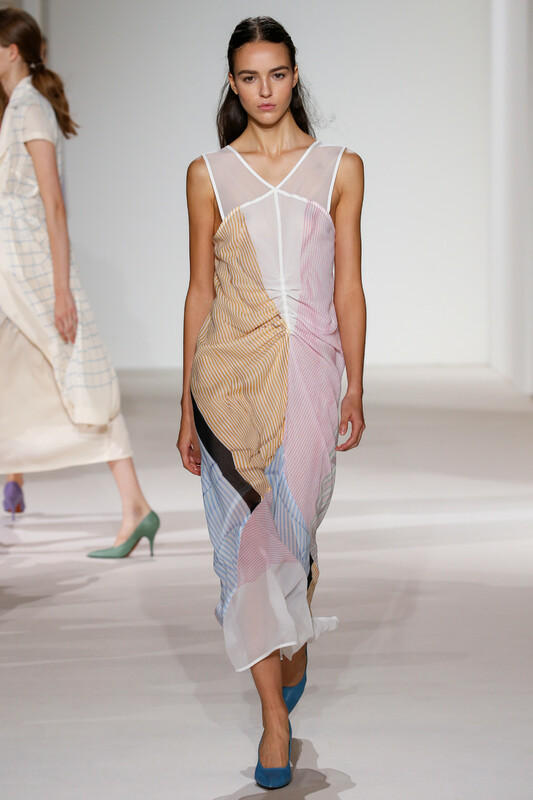 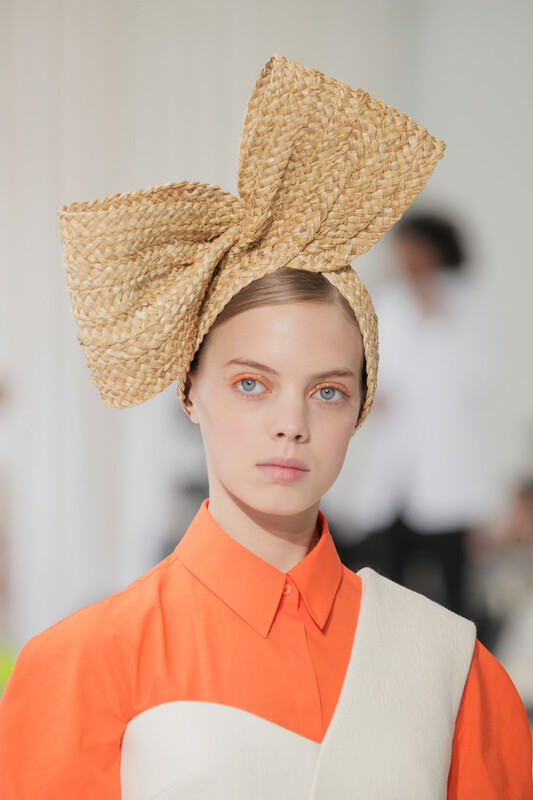 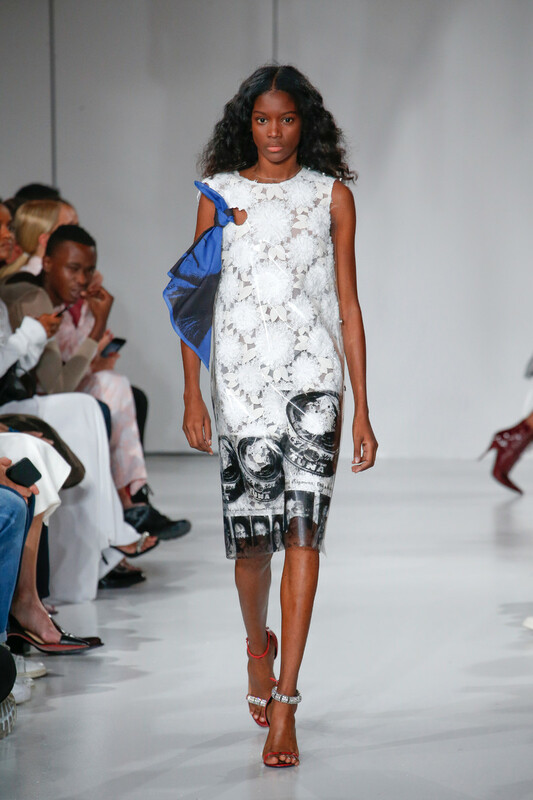 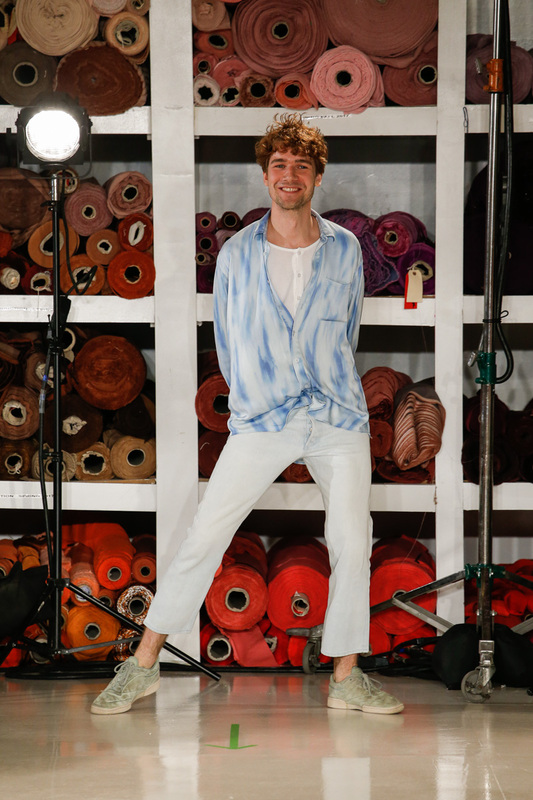 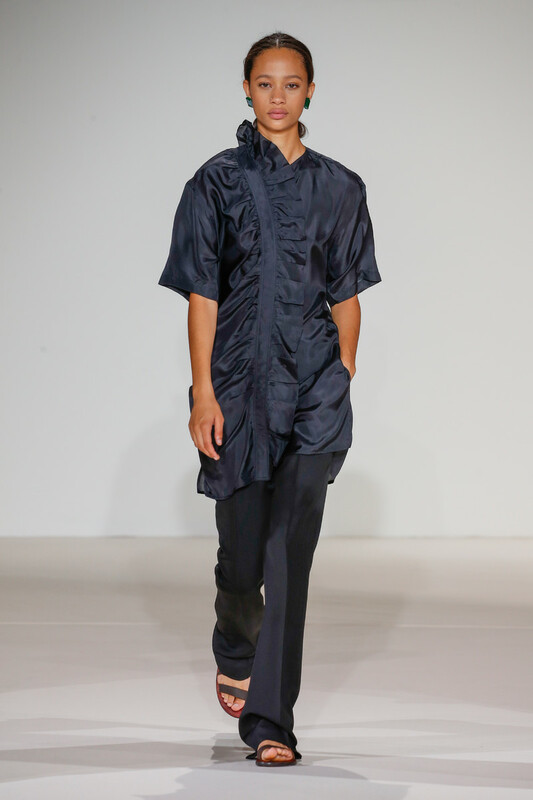 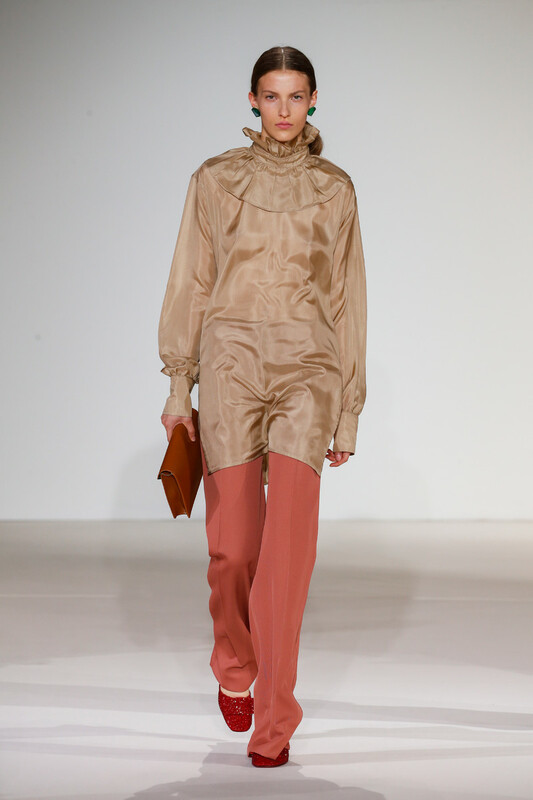 Lies Marjan designer Sander Lak wanted his spring collection to be personal. 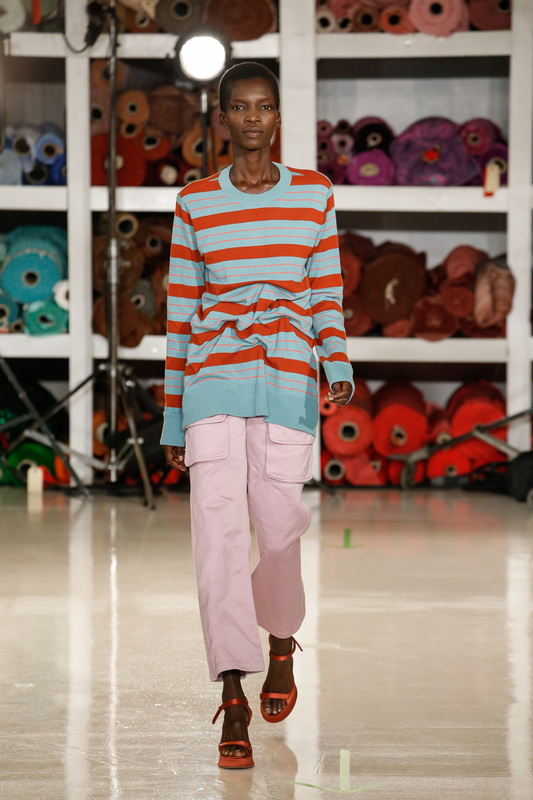 In his show-notes, he noted that the pieces were “put through a wash cycle, fabrics were squeezed, wrung, tumbled and hung up to dry.” That did not mean they looked lived-in or aged; on the contrary, the collection seemed fresh and spirited, perhaps because of his gently twisted slash-folded knits and his signature use of color. 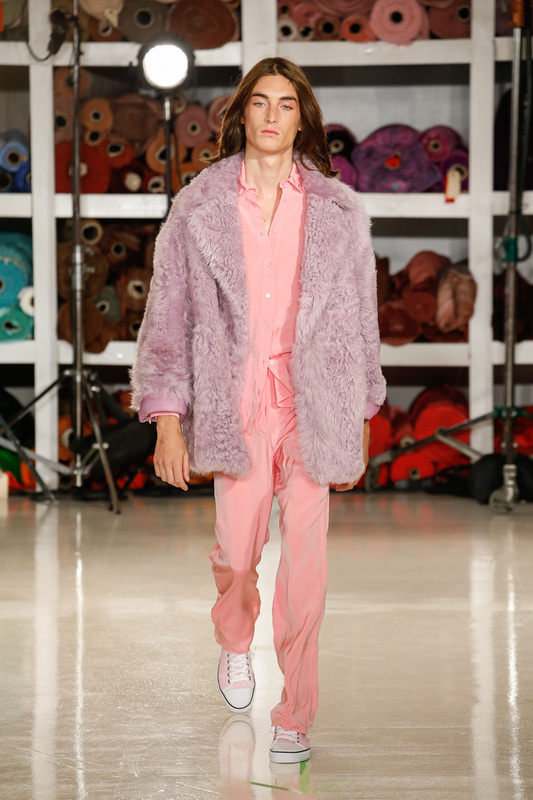 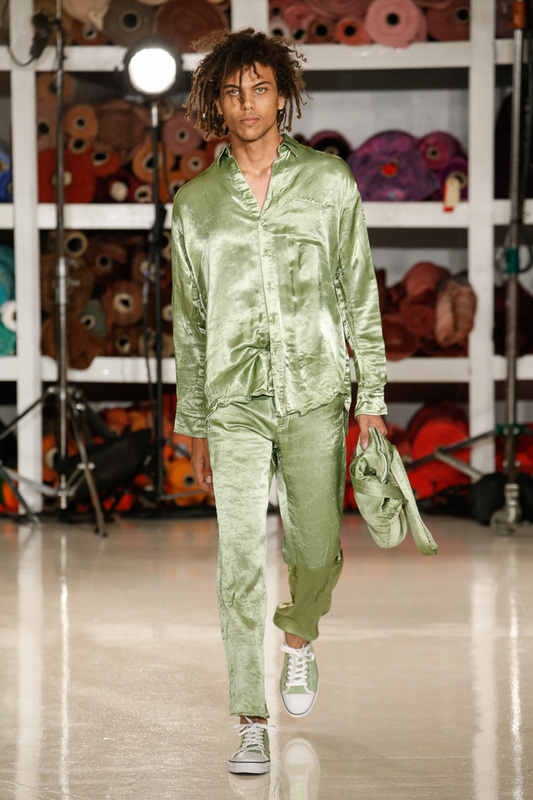 Guava and yellow, mint green and lavender, metallic orange and pink were all done in his signature slouchy drapy vibe. 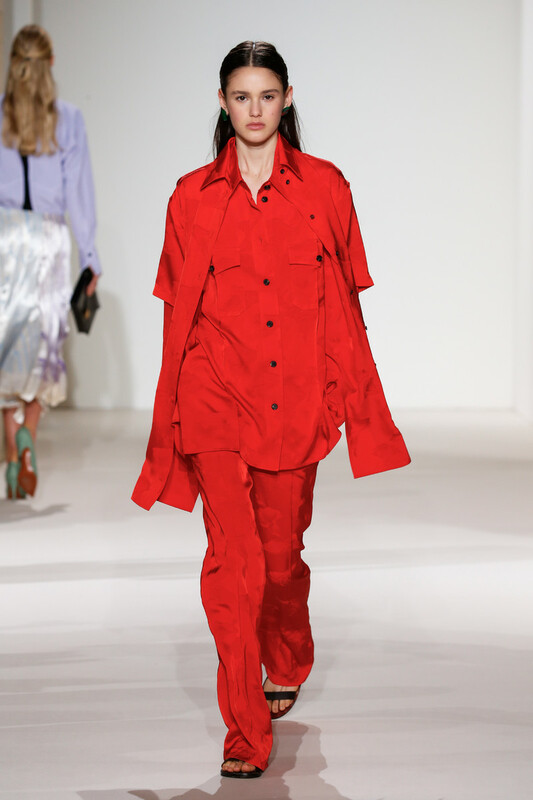 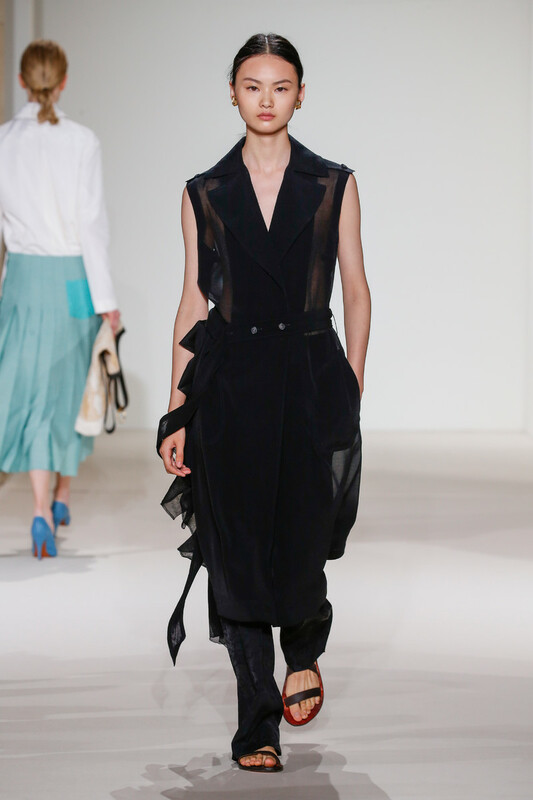 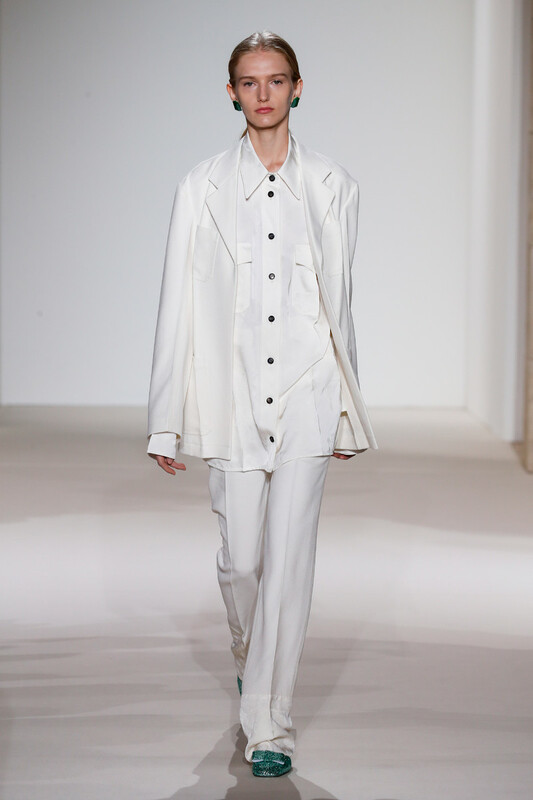 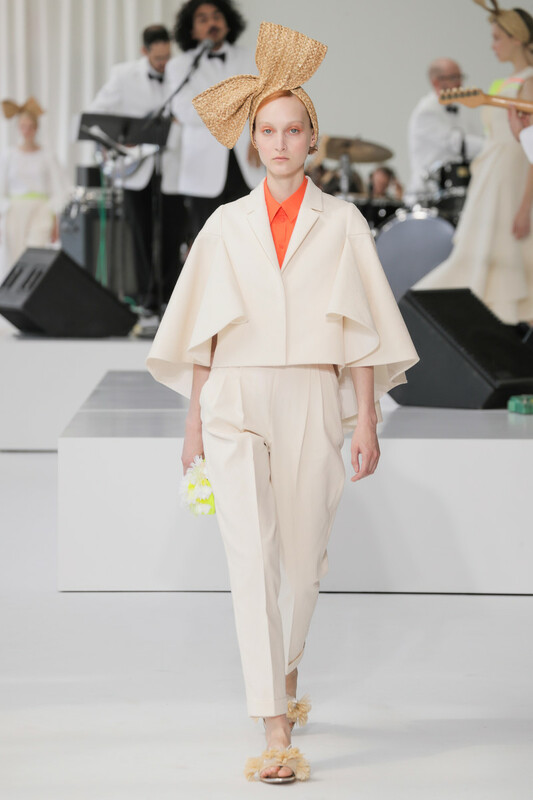 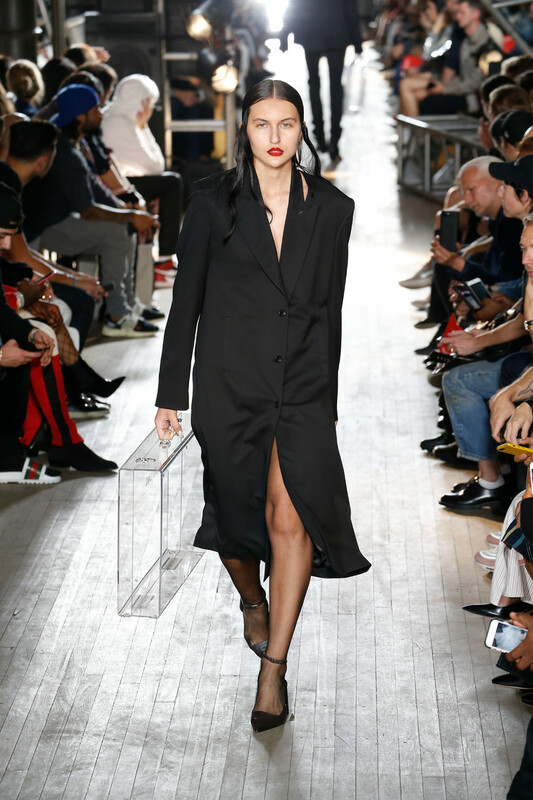 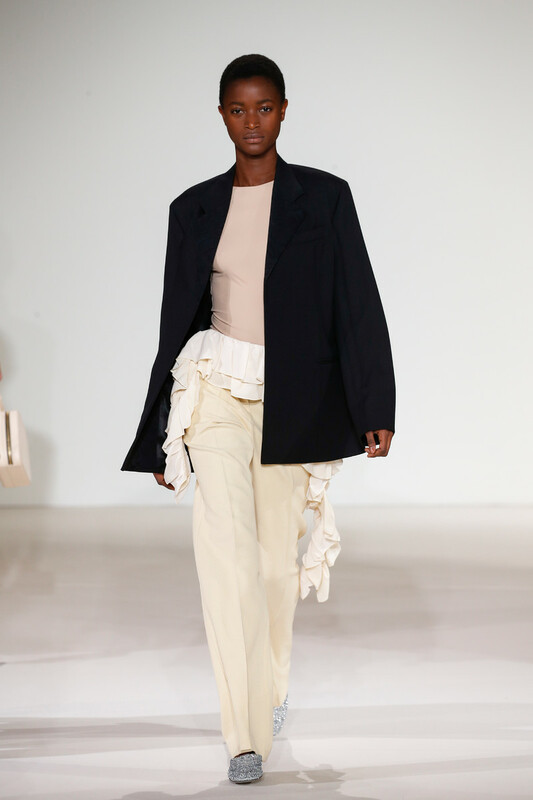 Victoria Beckham crafted a confident, stable point of view of chic wearability for women of means and a high taste level that sits somewhere between feminine and minimal. 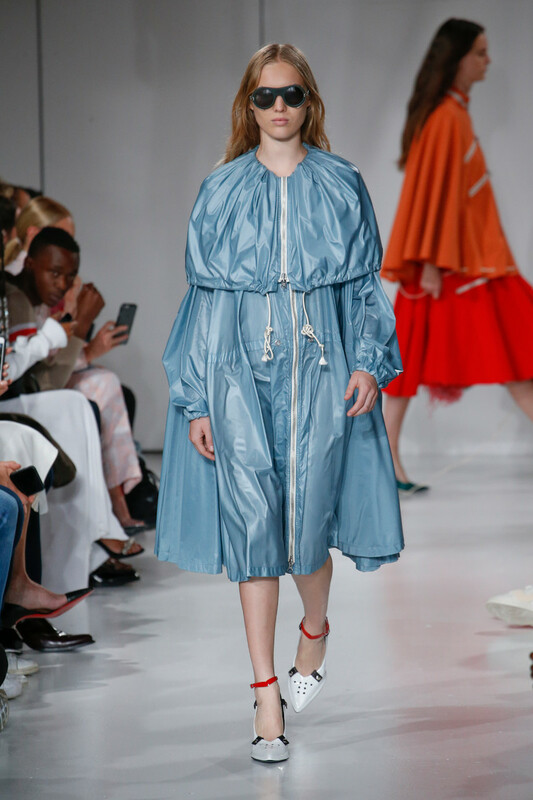 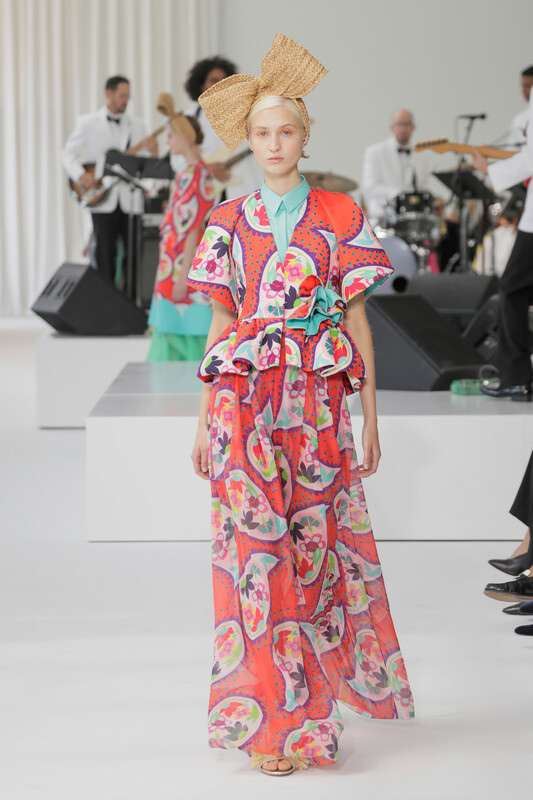 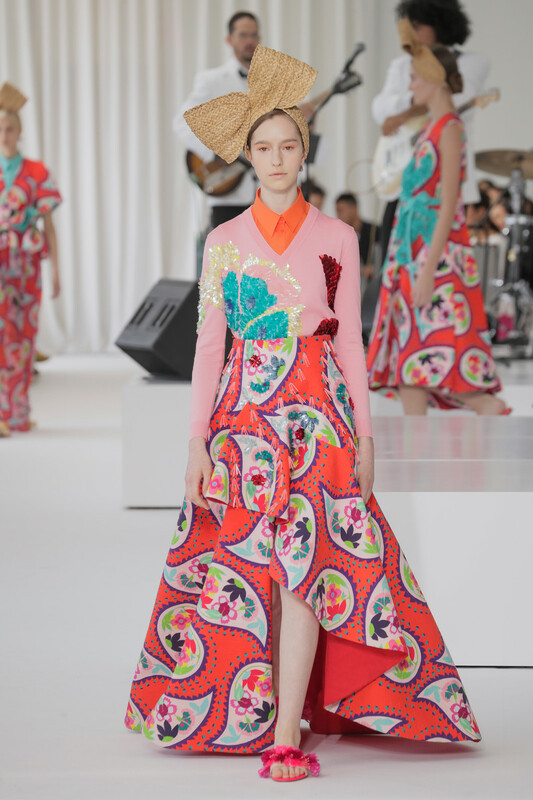 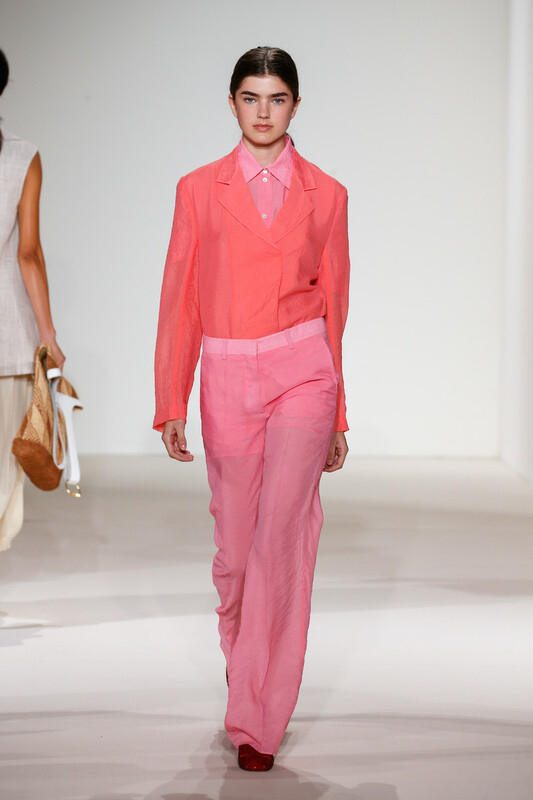 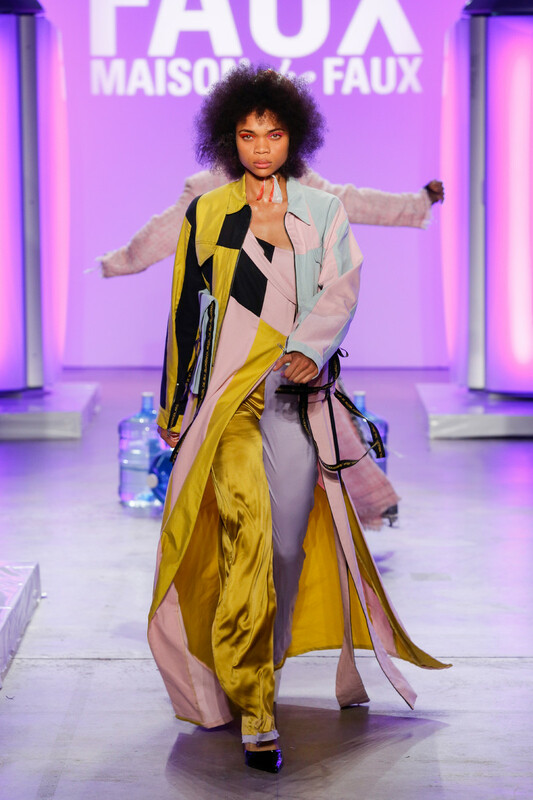 Her spring collection was flush with great color — soft, mineral blue, pink and lavender as well as vivid red — worked on silhouettes that exuded gentle power. 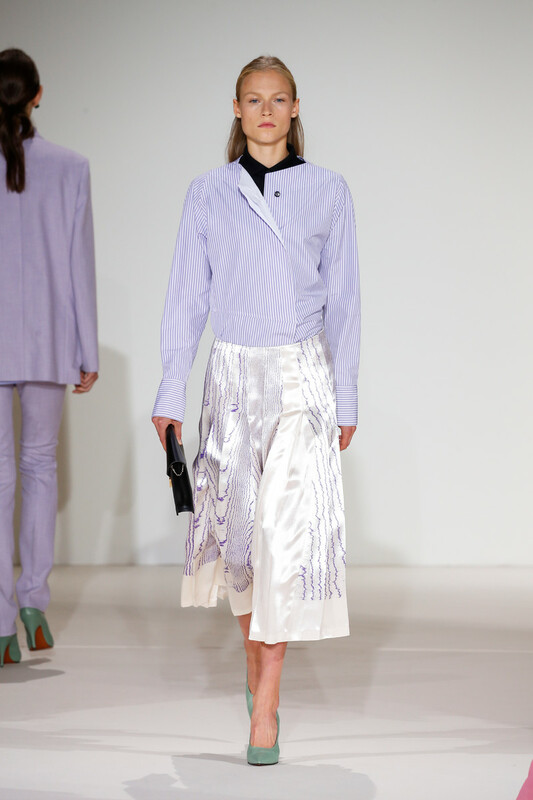 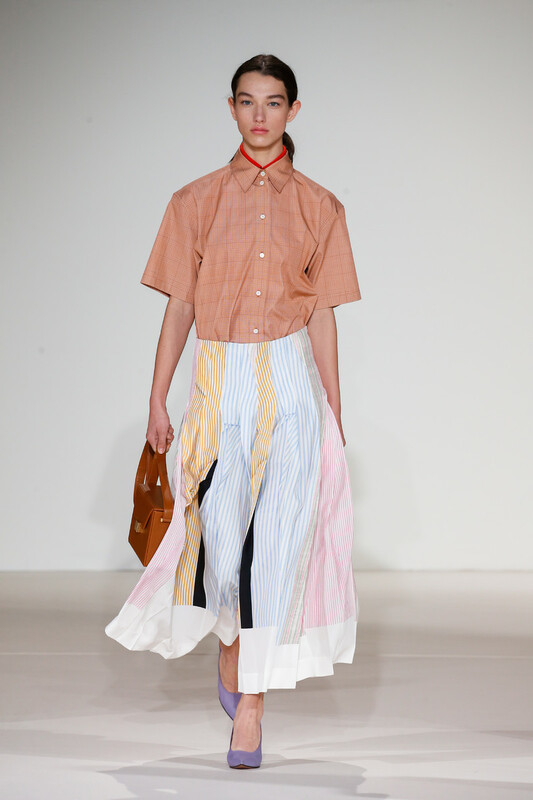 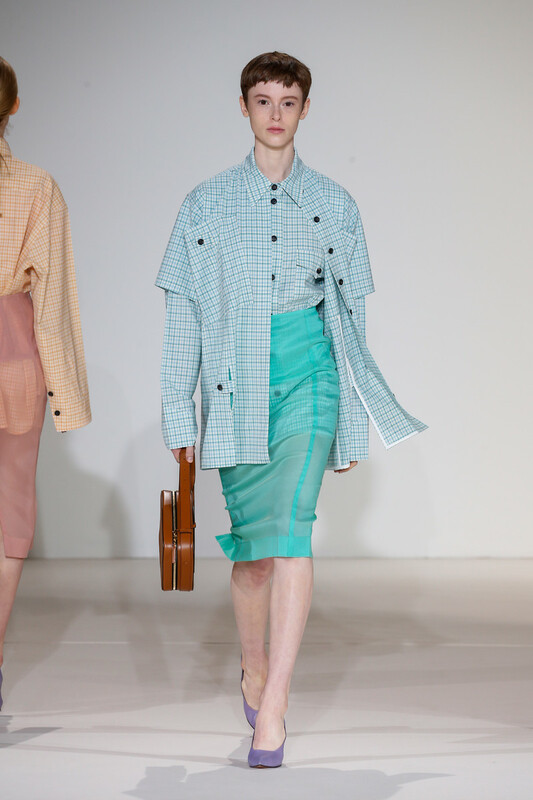 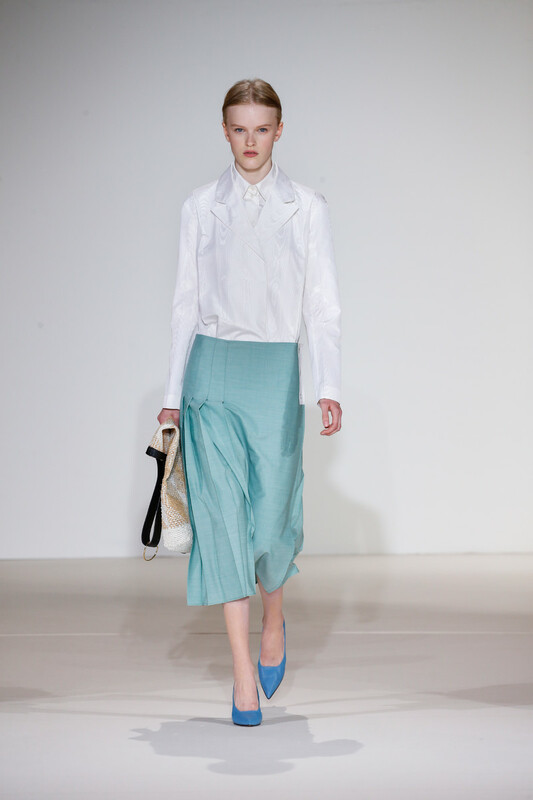 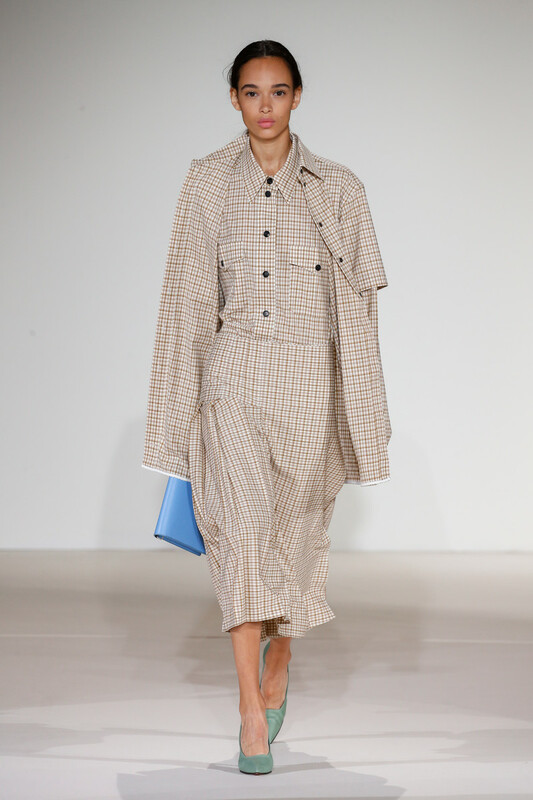 Pertly tailored takes on utility shirts, some done in men’s checks, were paired with light pencil skirts. 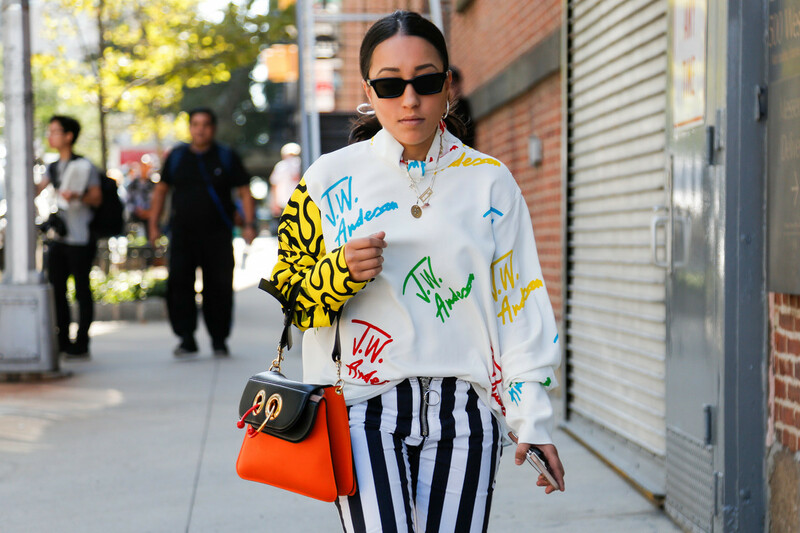 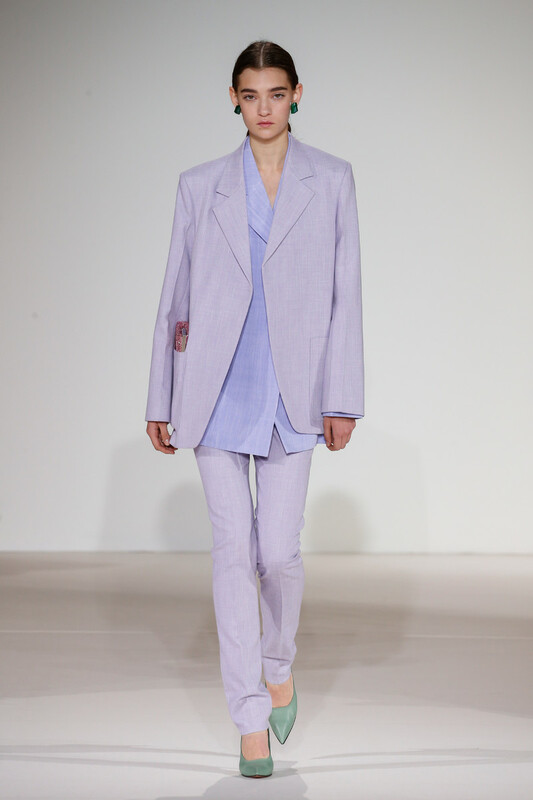 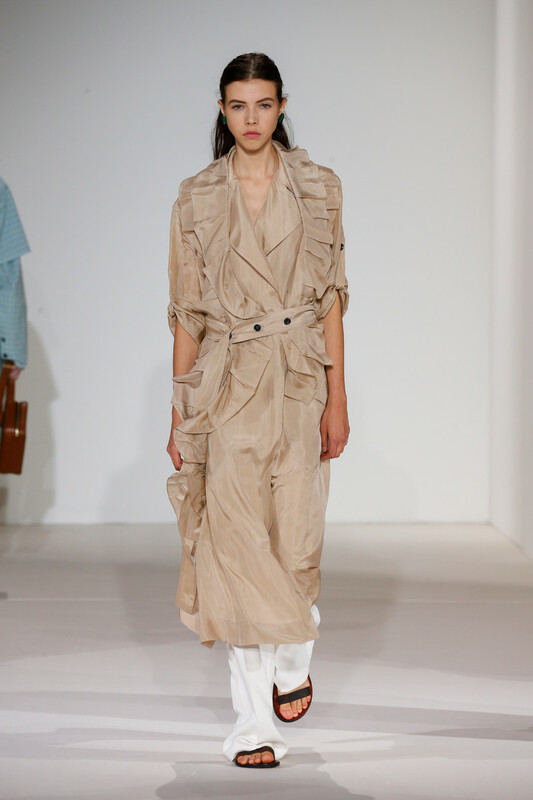 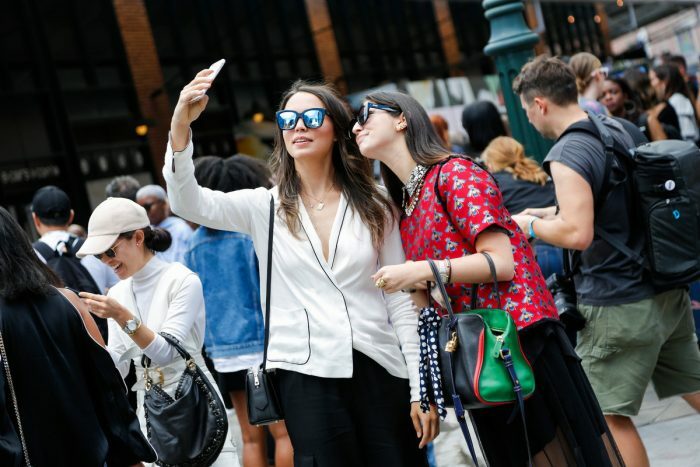 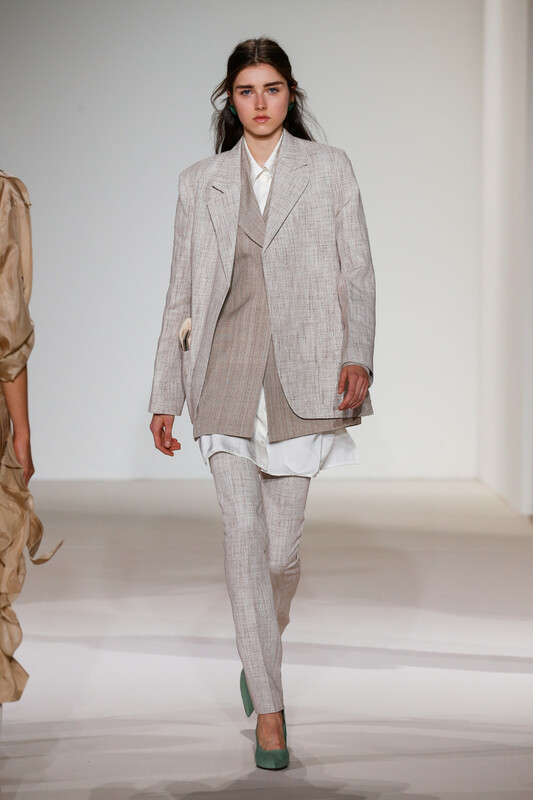 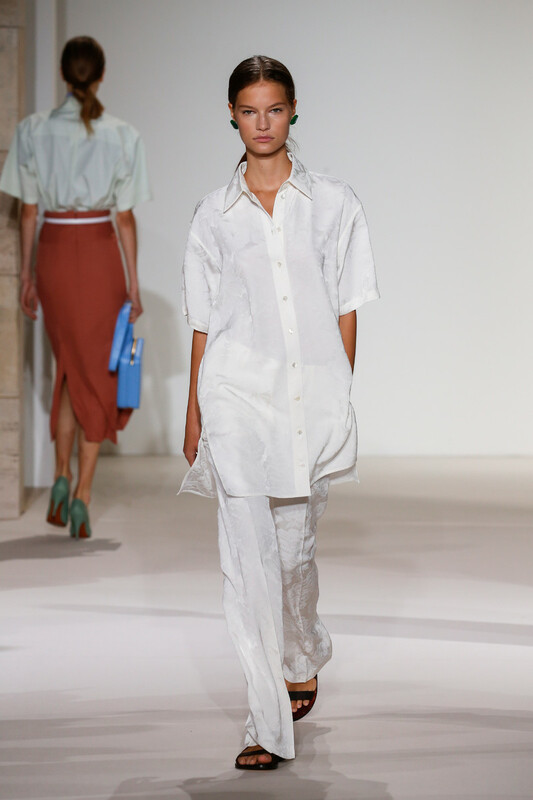 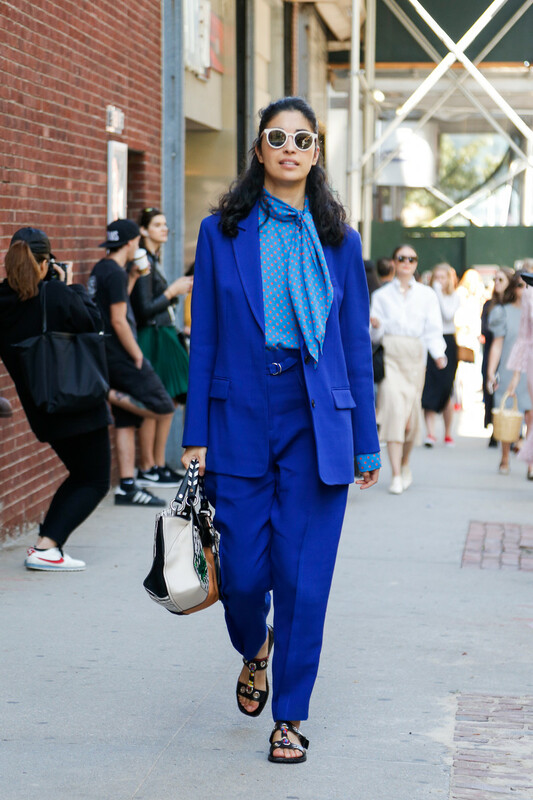 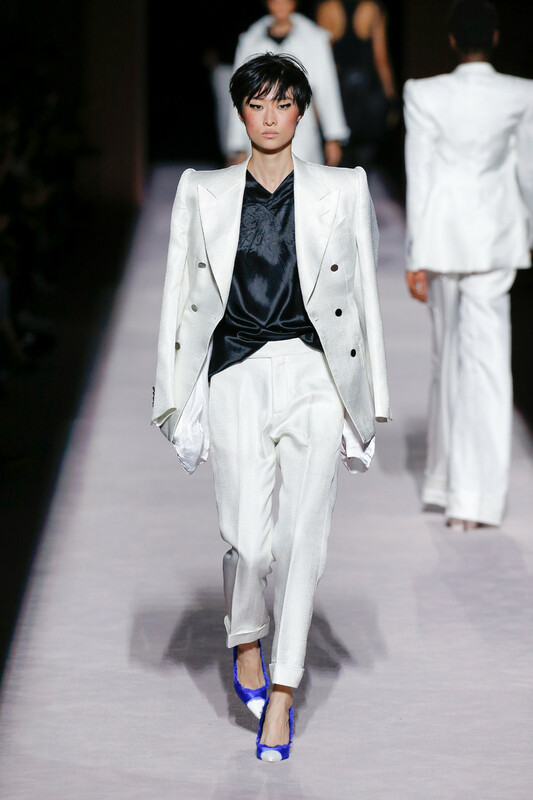 Fluid oversized shirts were layered over easy, wide-legged pants, and new suits came with boxy blazers and slim pants. 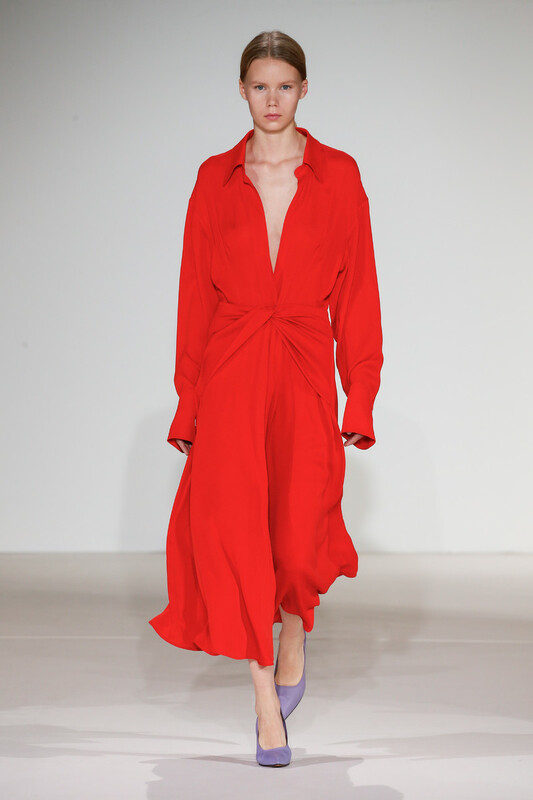 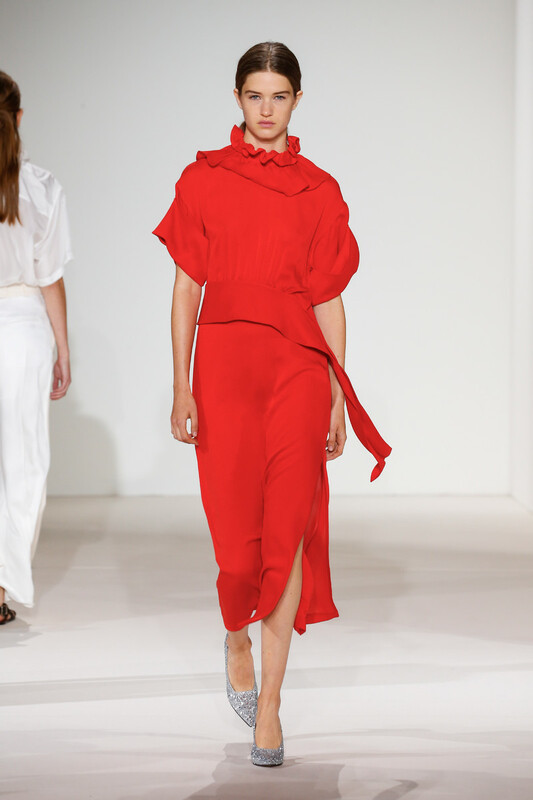 A red dress with a high, gracefully ruffled neckline and cutaway panel at the waist was cut in a relaxed but seductive line. 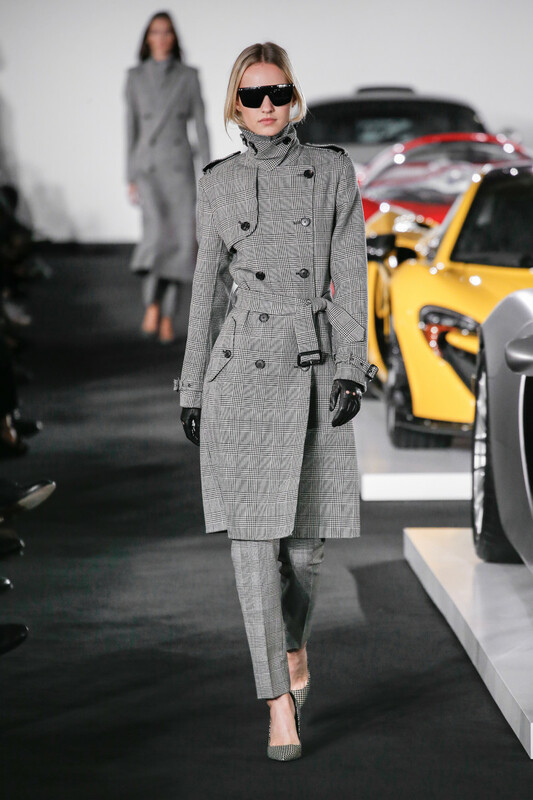 Many silhouettes were covered up, but not without allure or playfulness. 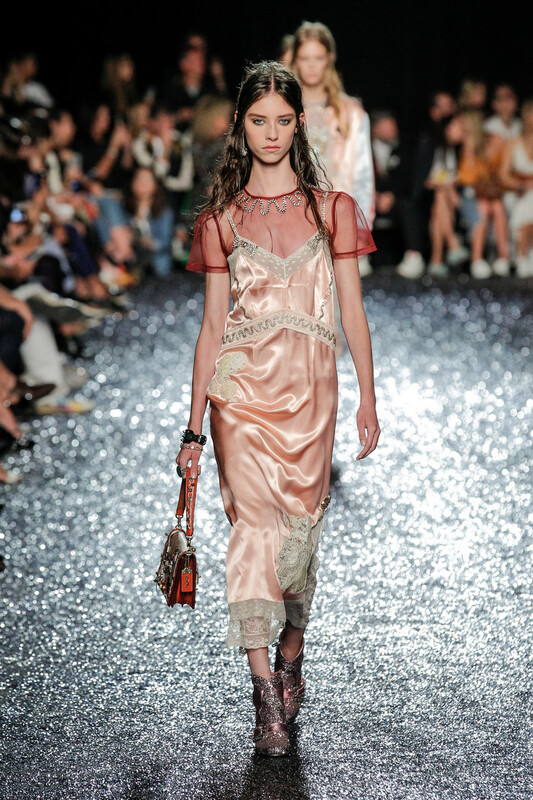 Candy-colored glitter pumps and the occasional jeweled anklet offset the collection’s womanly sophistication with the perfect boost of girlish whimsy. 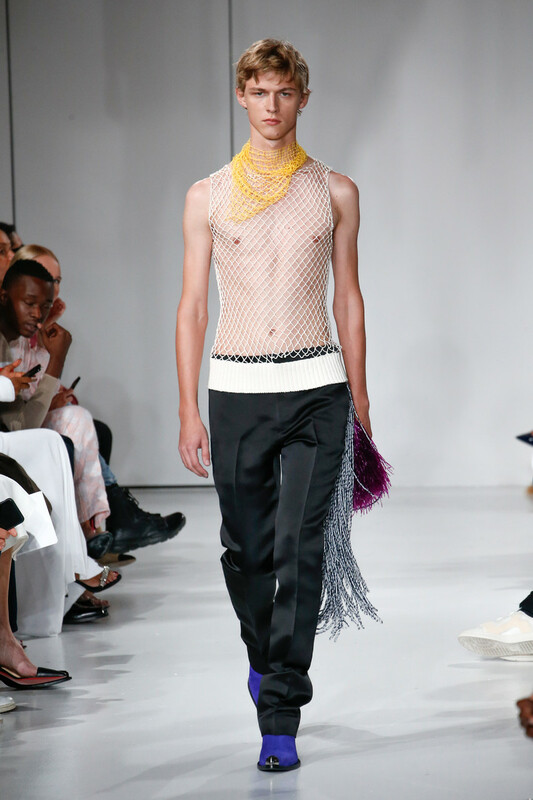 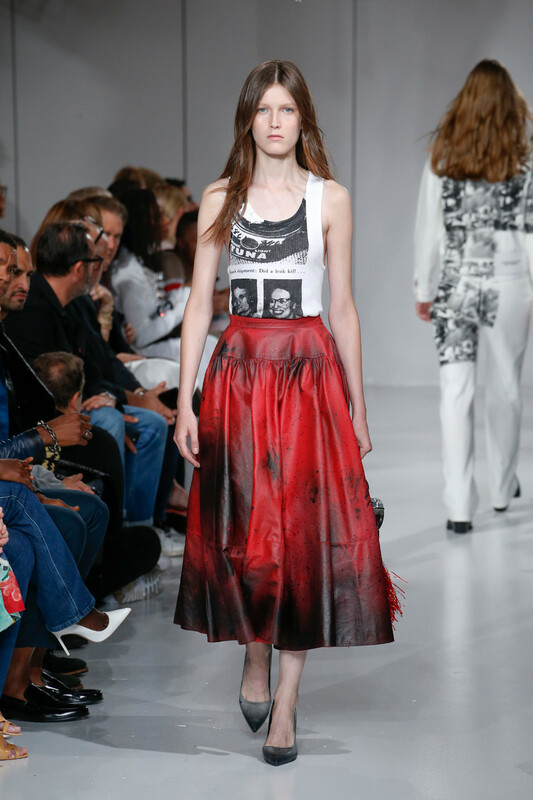 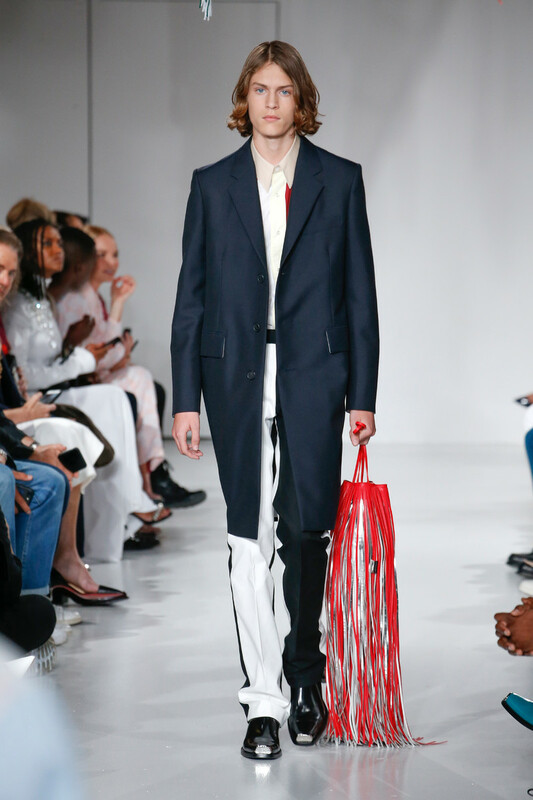 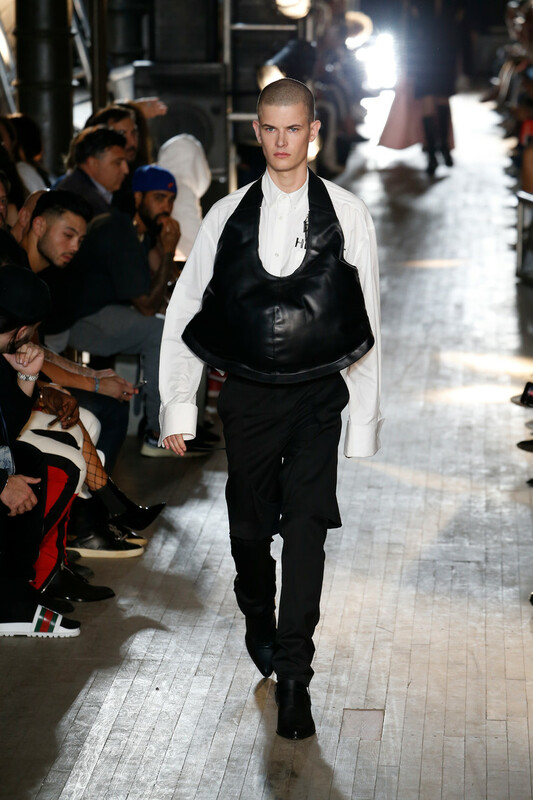 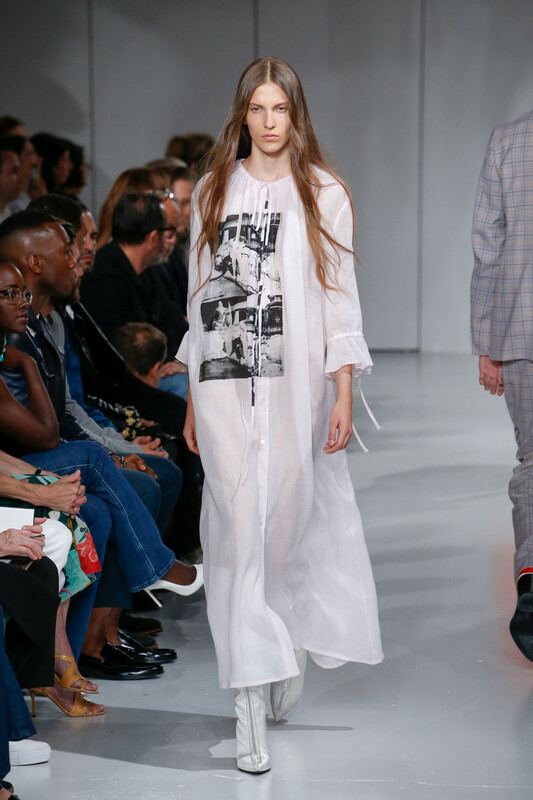 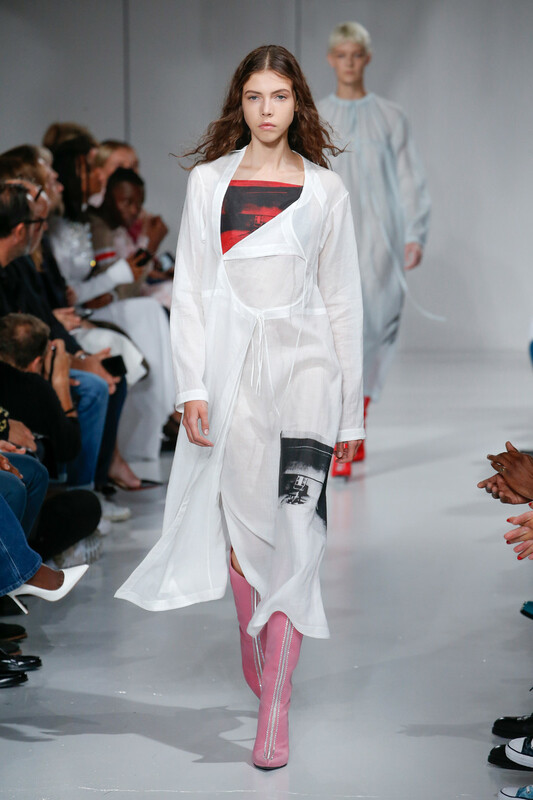 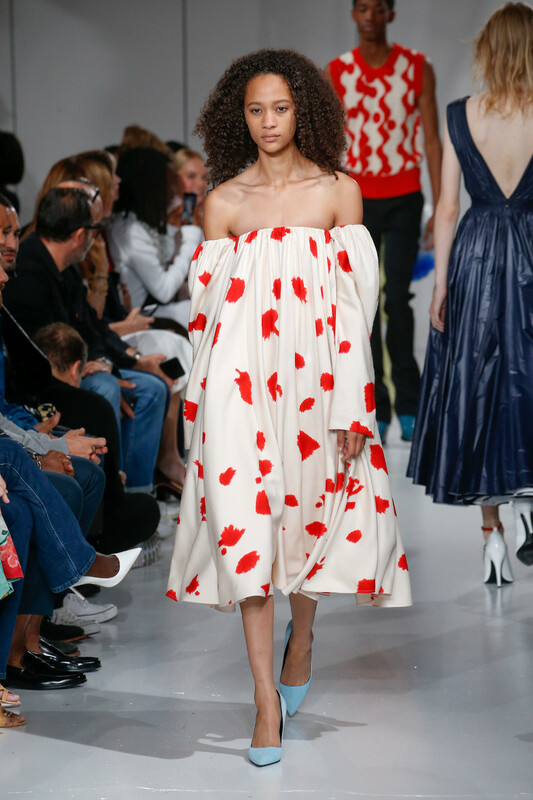 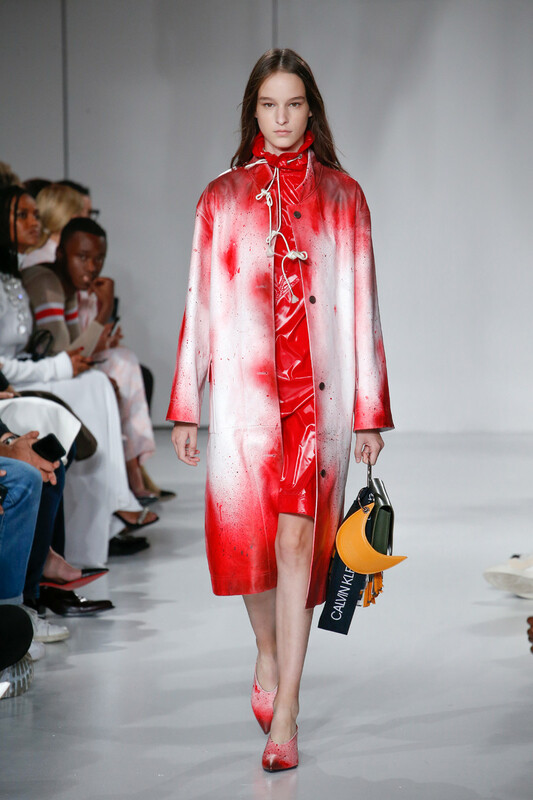 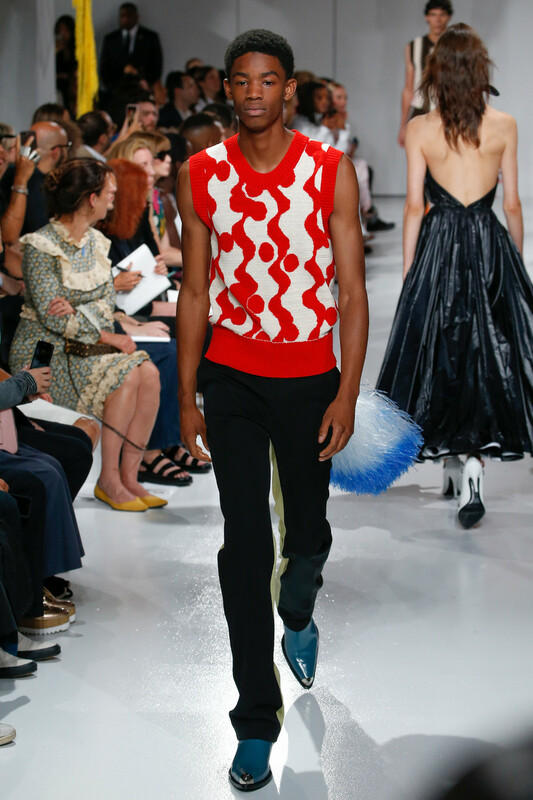 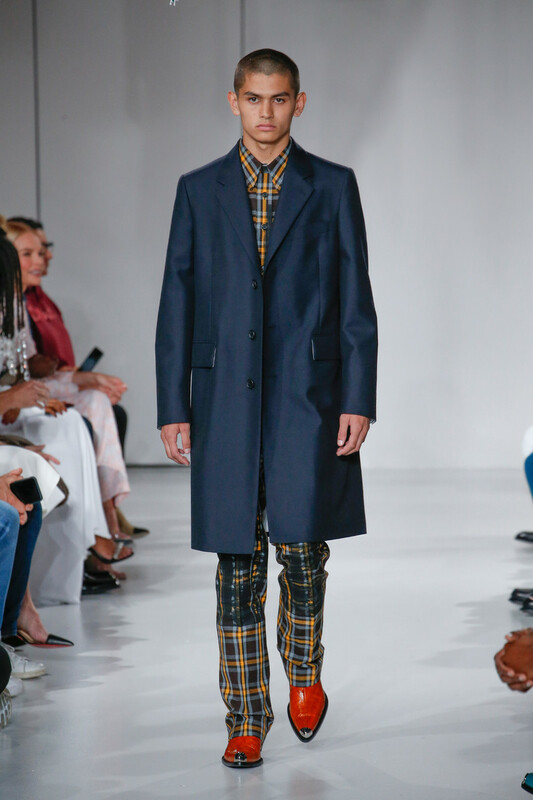 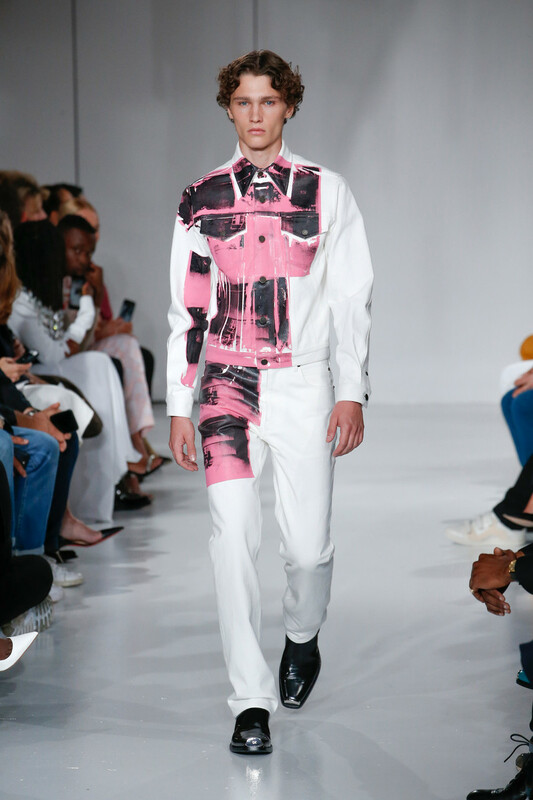 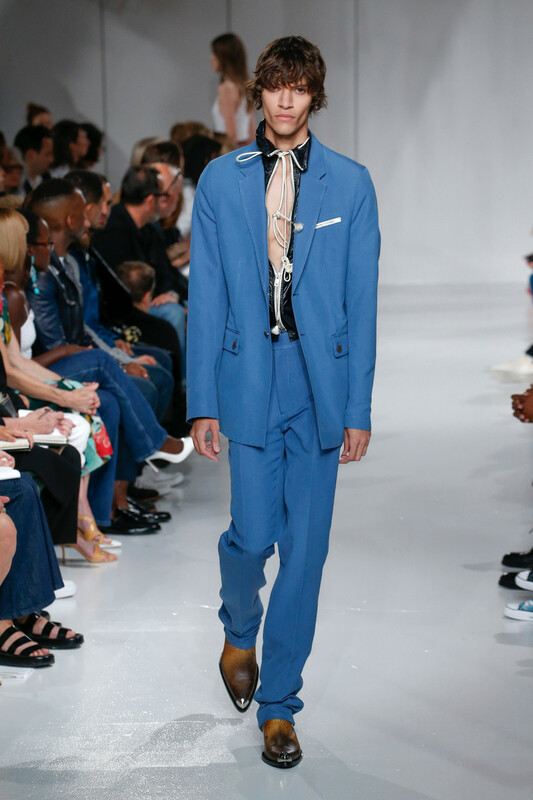 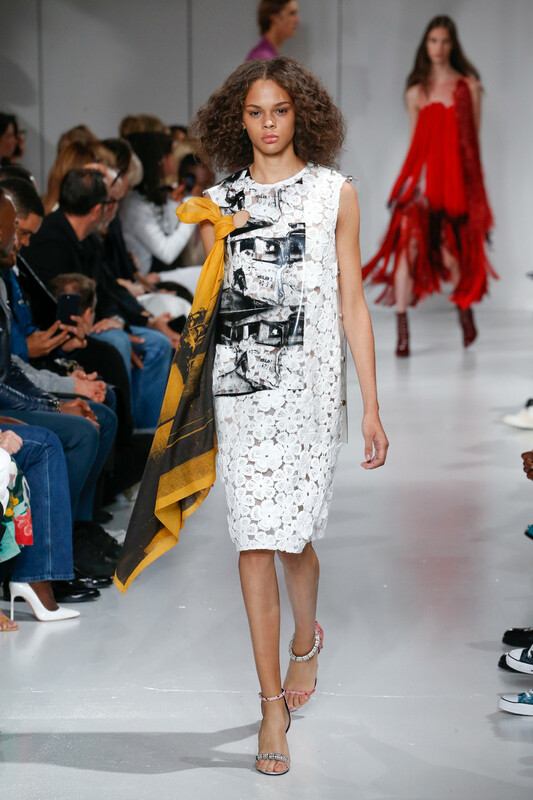 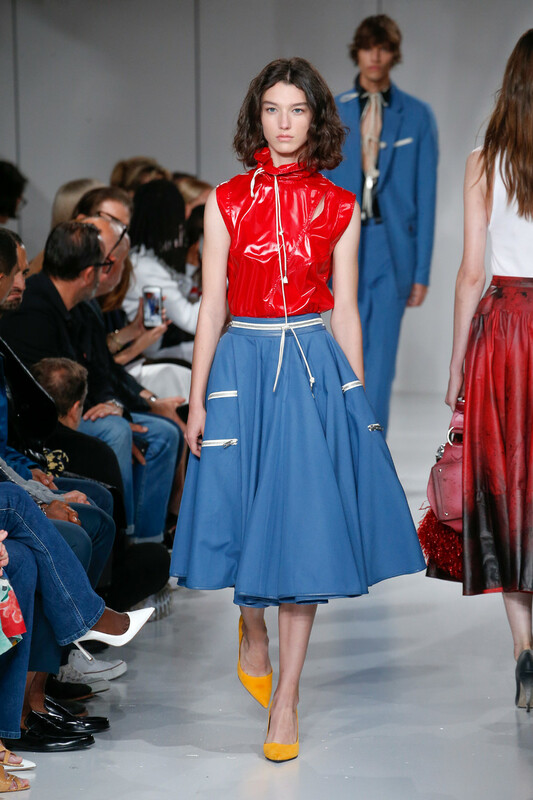 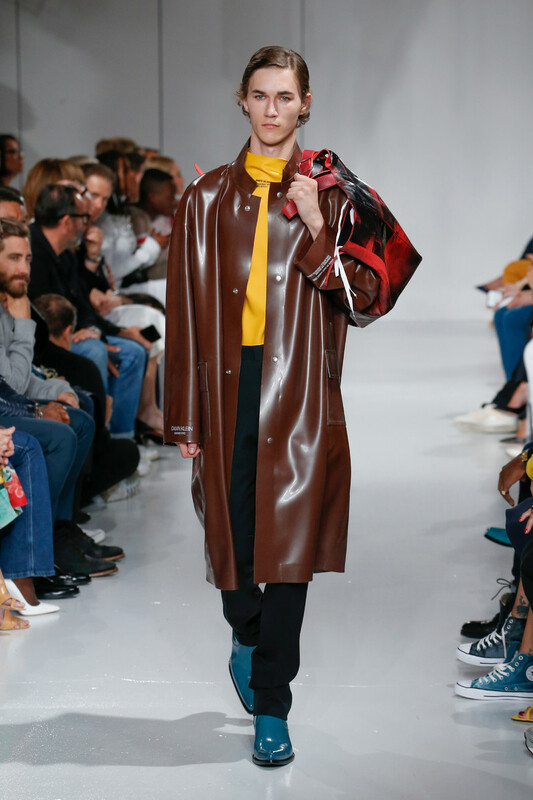 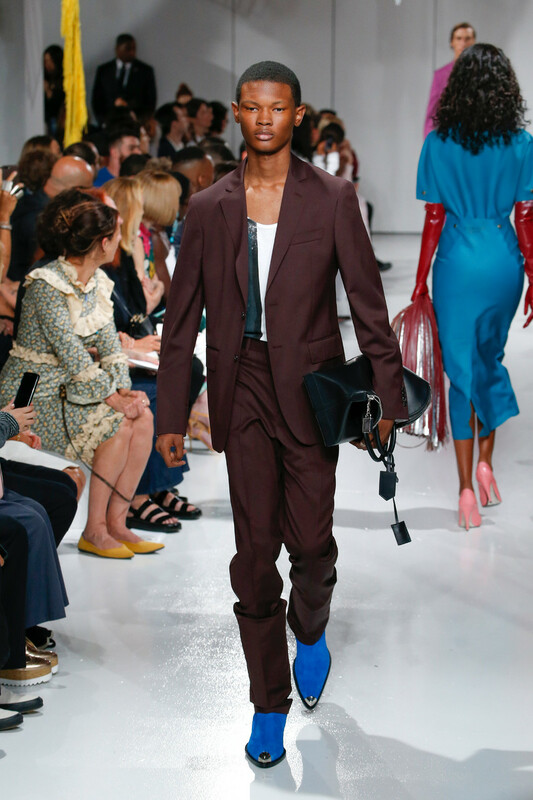 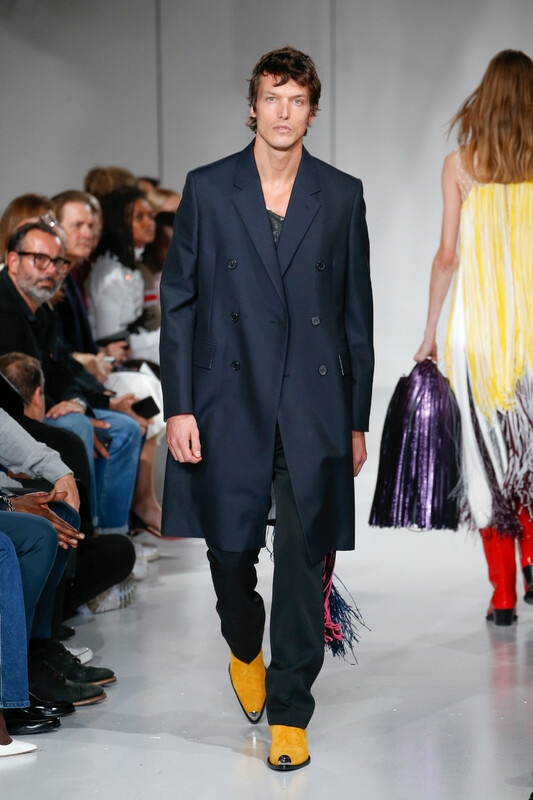 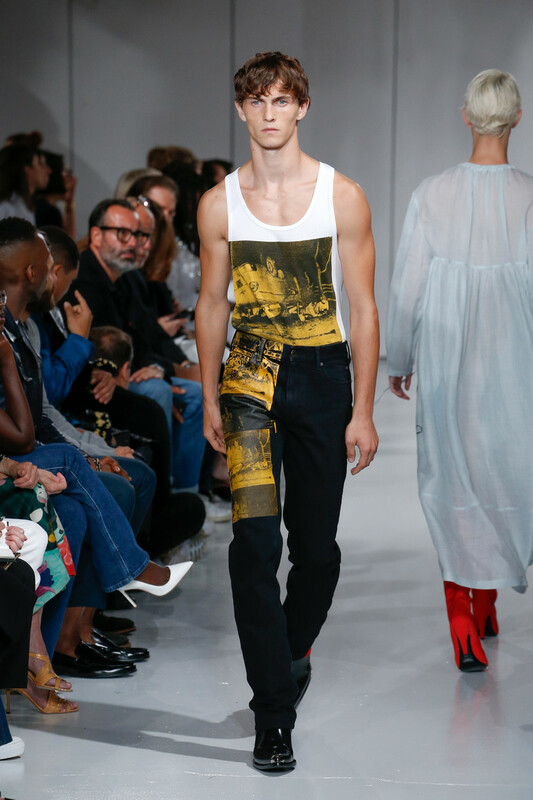 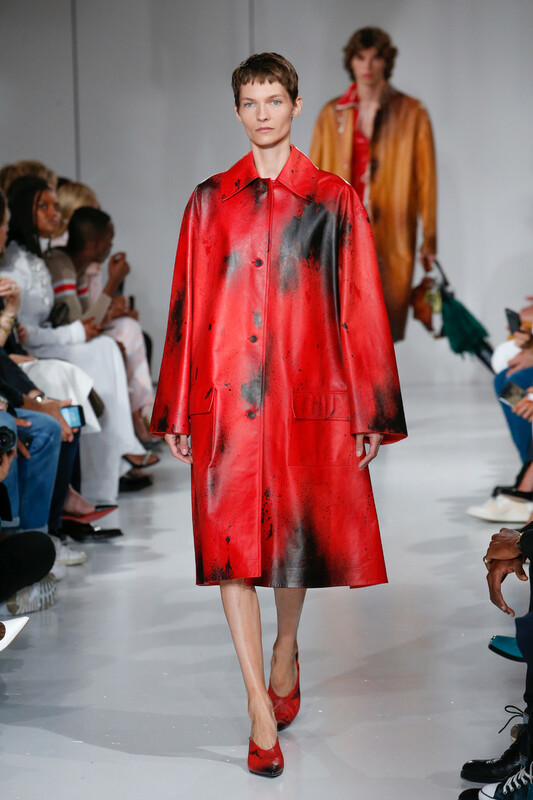 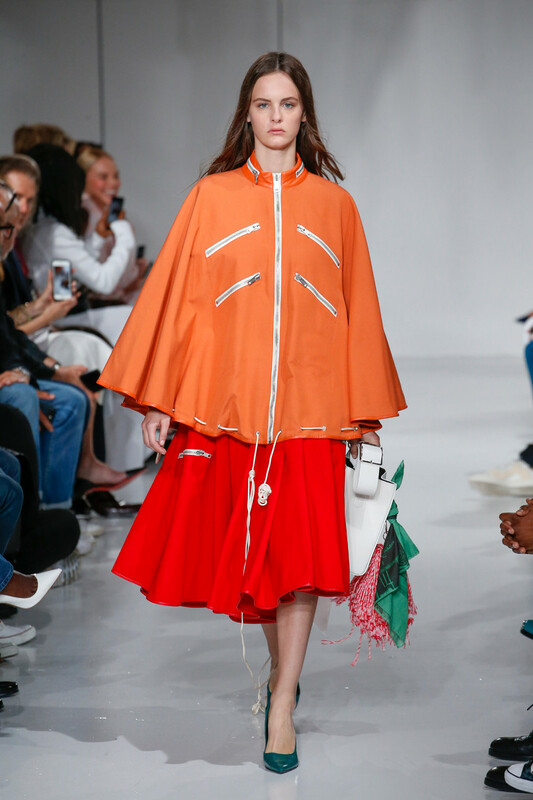 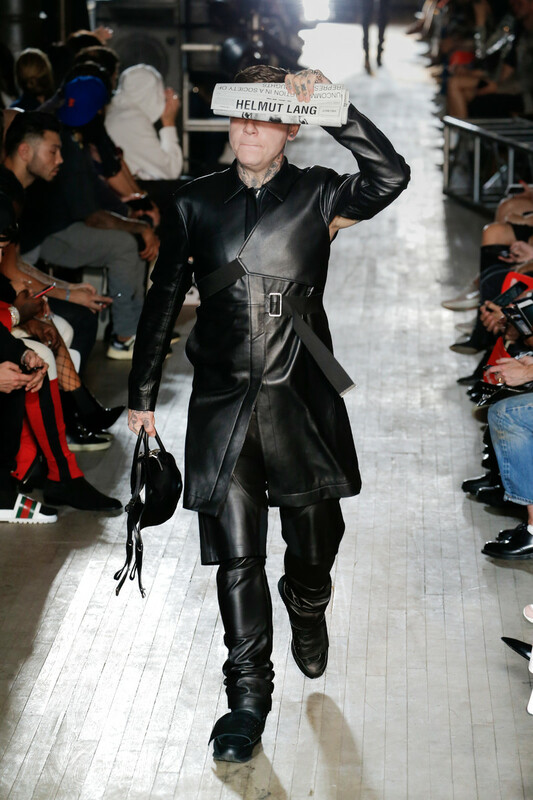 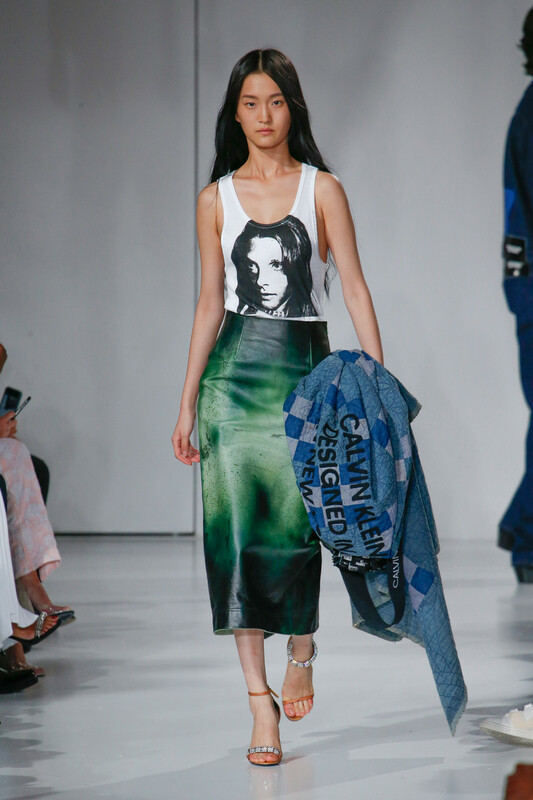 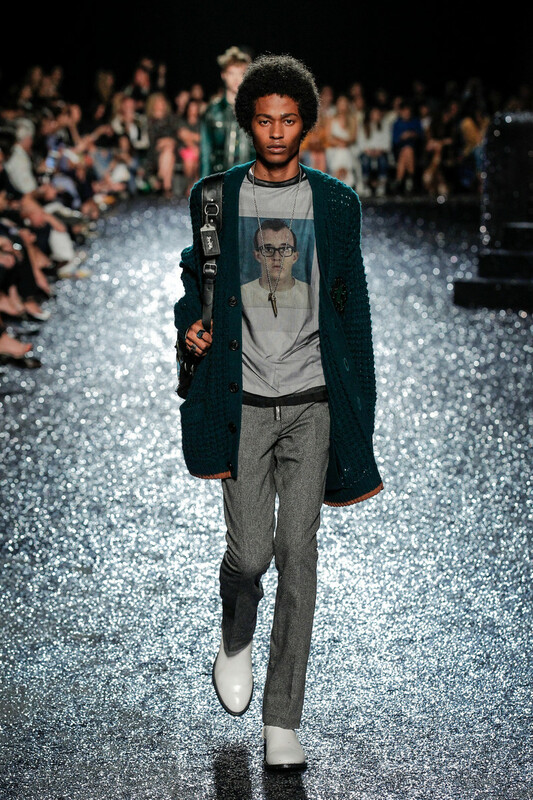 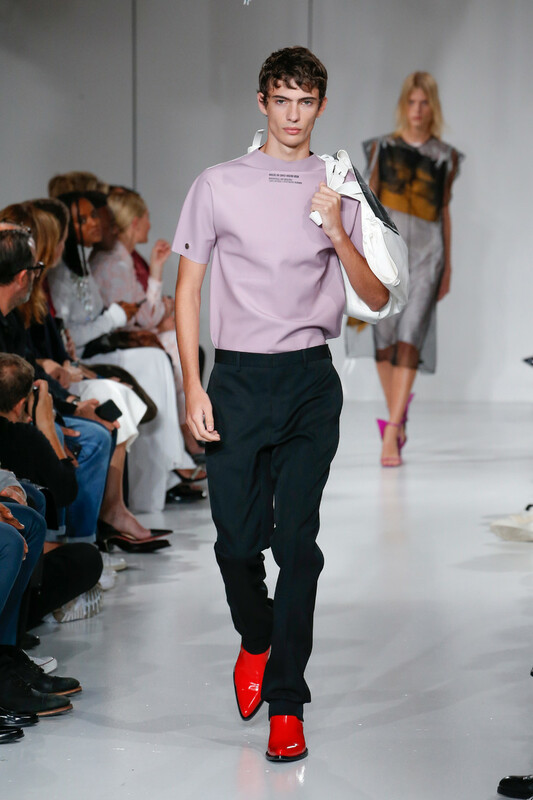 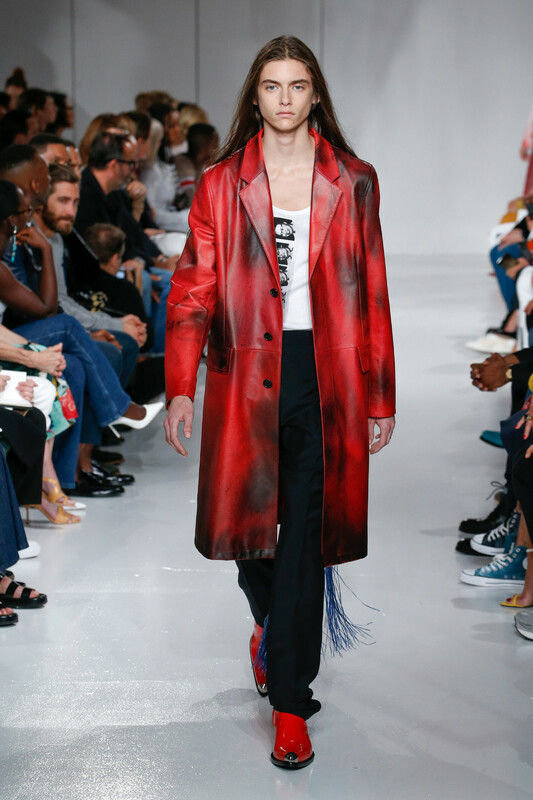 After two collections, it’s clear that Raf Simons’ approach of Calvin Klein is to mine broad-stroke aspects of American culture, whether out of respect, curiosity or a yen to telegraph to skeptics (if any exist), his appropriateness for the creative helm of one of the great bastions of American fashion. 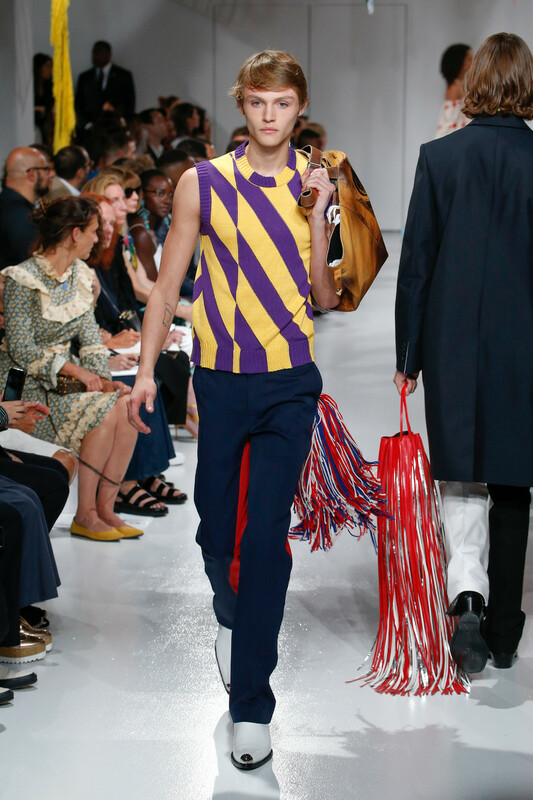 Hence, a prolonged stroll under Sterling Ruby’s latest collaboration with Simons, the rafters now hung with colorful, exaggerated pompoms and banners representing the cheery high school life, but with grim sightings — an axe here or there — interrupting the frivolity. 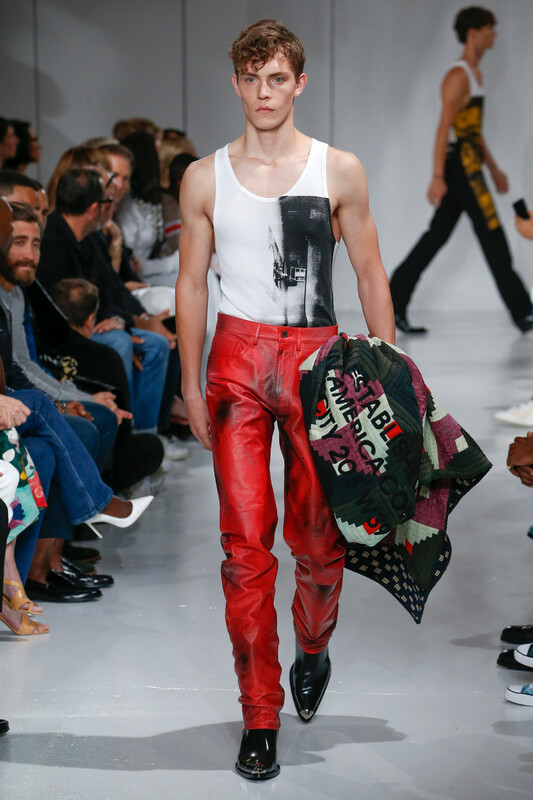 That provided the setting for the show, “Sweet Dreams,” inspired, Simons’ show notes informed, by the Hollywood horror genre and “its depictions of both an American nightmare, and the all-powerful American dream.” It resulted in a thoughtful juxtaposition of pleasant facade and disturbing underbelly, realized via a collaboration with the Andy Warhol Foundation for the Visual Arts; Simons used graphics from the artist’s “Death and Disaster” series to recontextualize clothes that ranged from ethereal (ghostly, billowing nightgowns) to cool (coed denim). 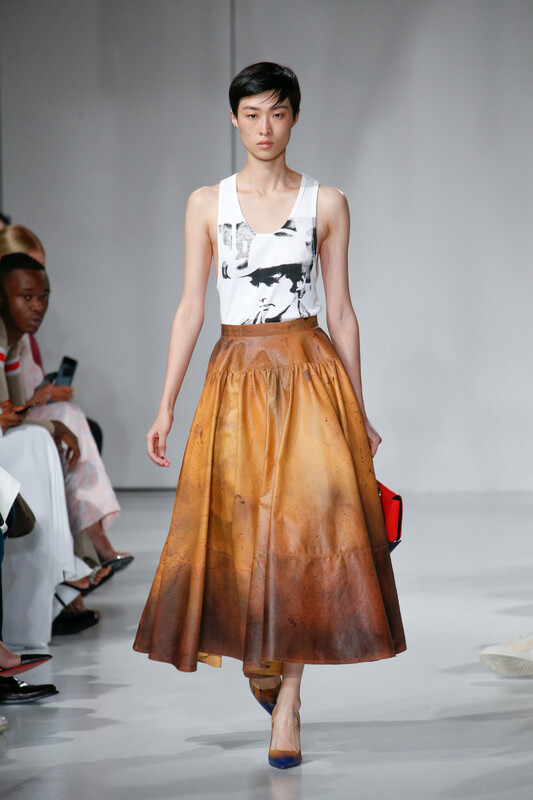 Within the social-commentary context, Simons mused broadly and brilliantly on silhouette and materials. 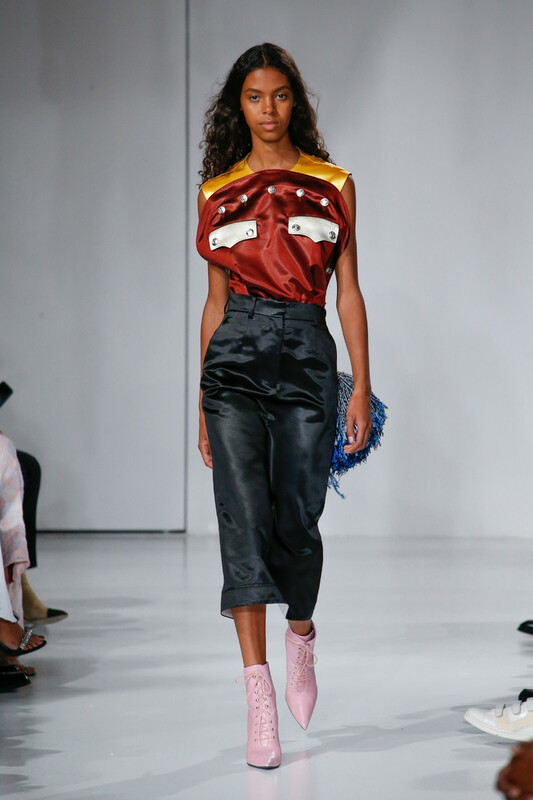 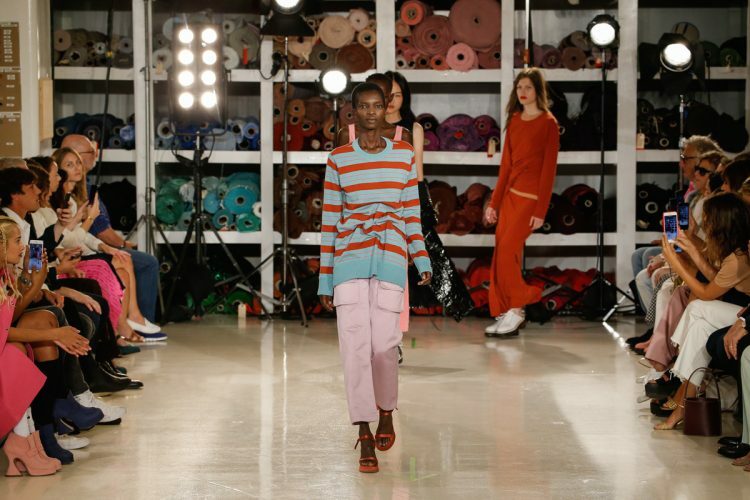 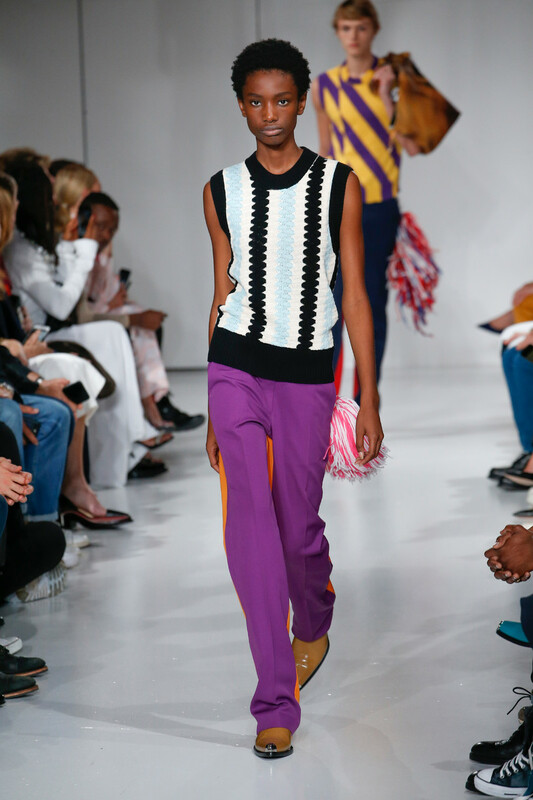 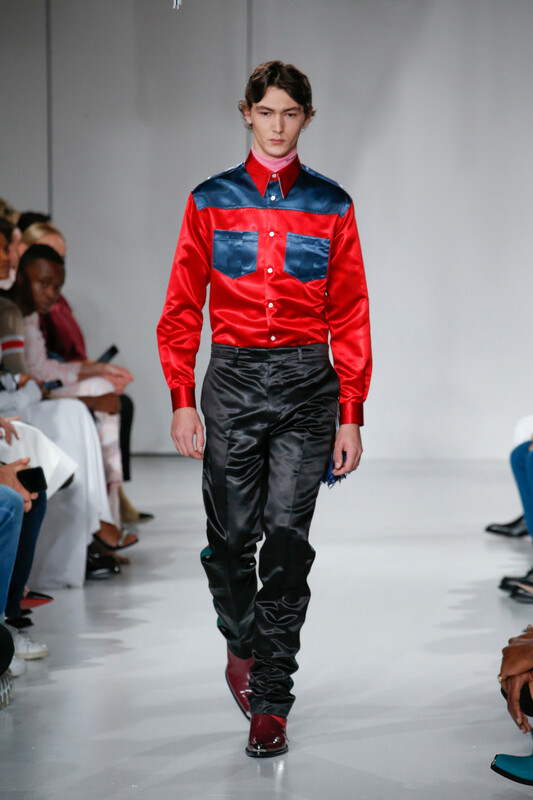 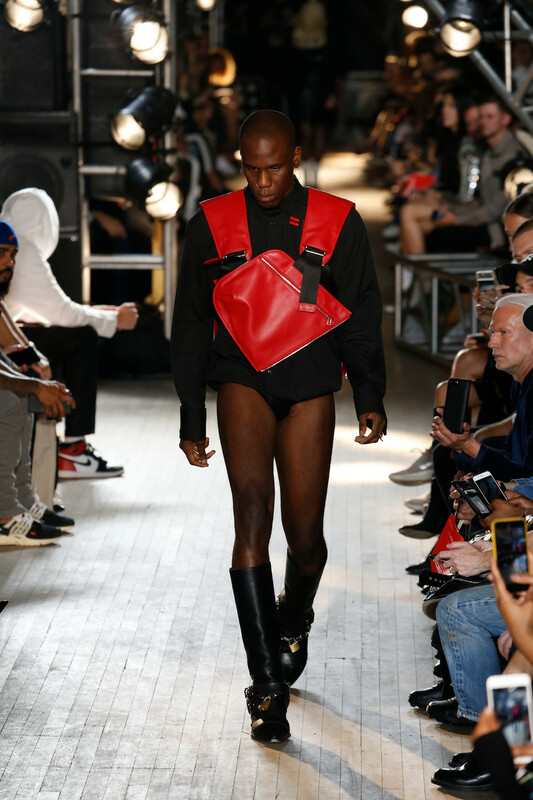 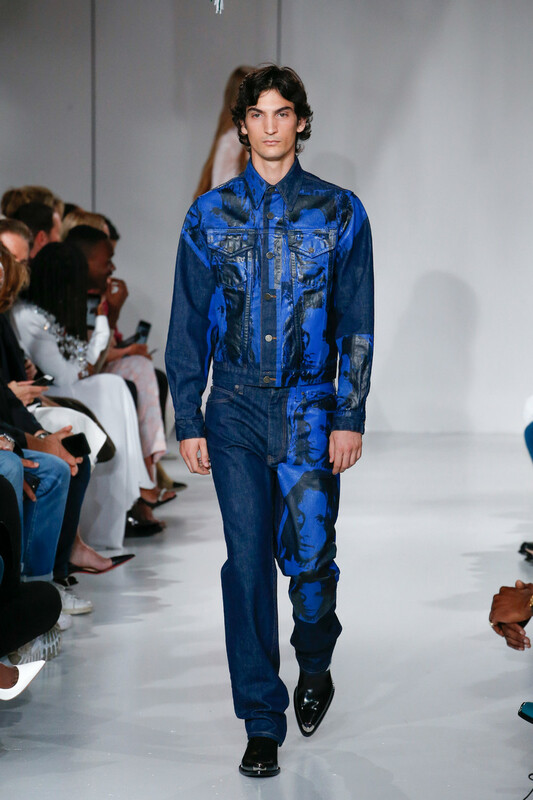 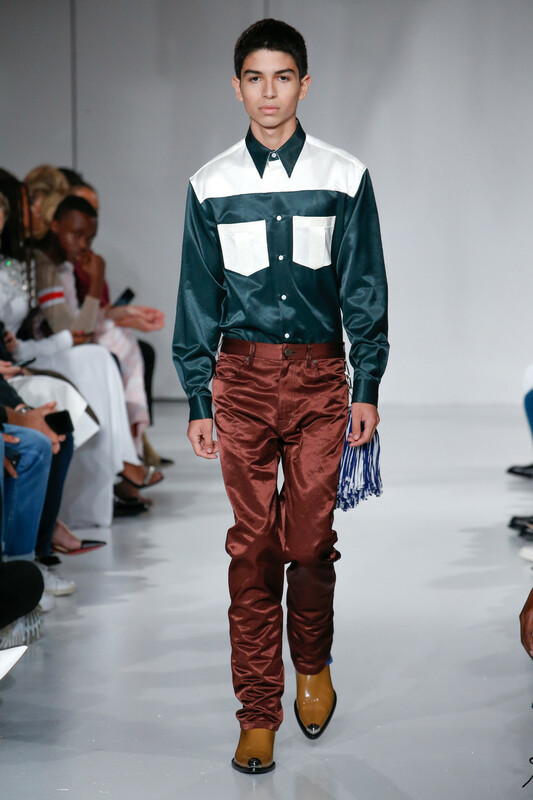 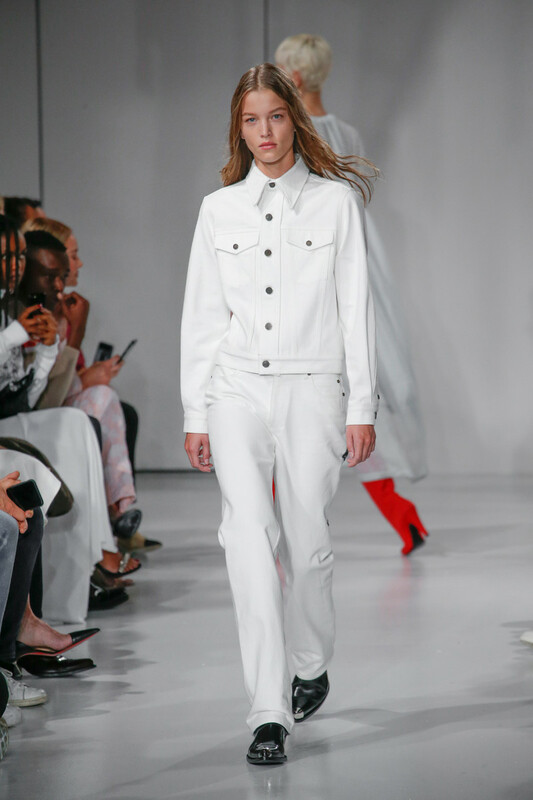 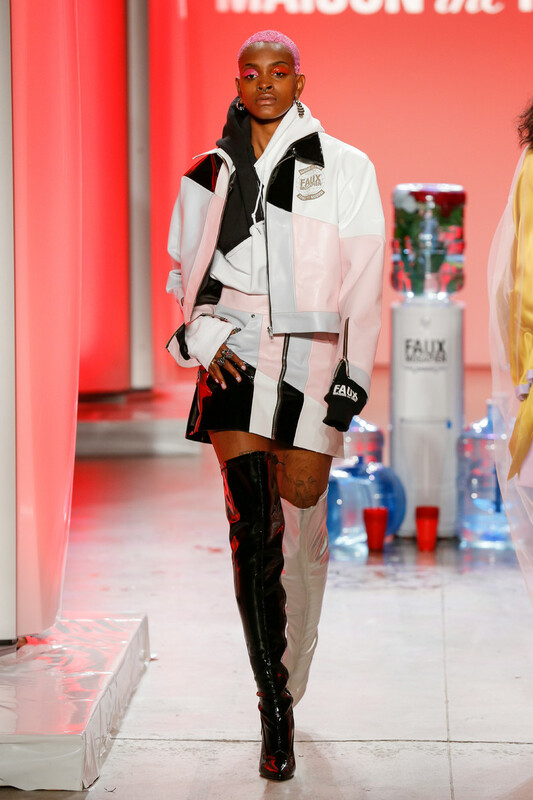 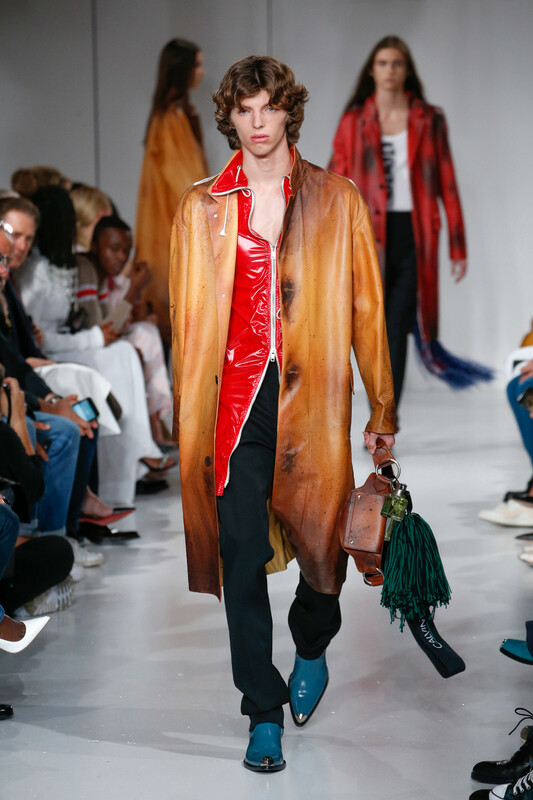 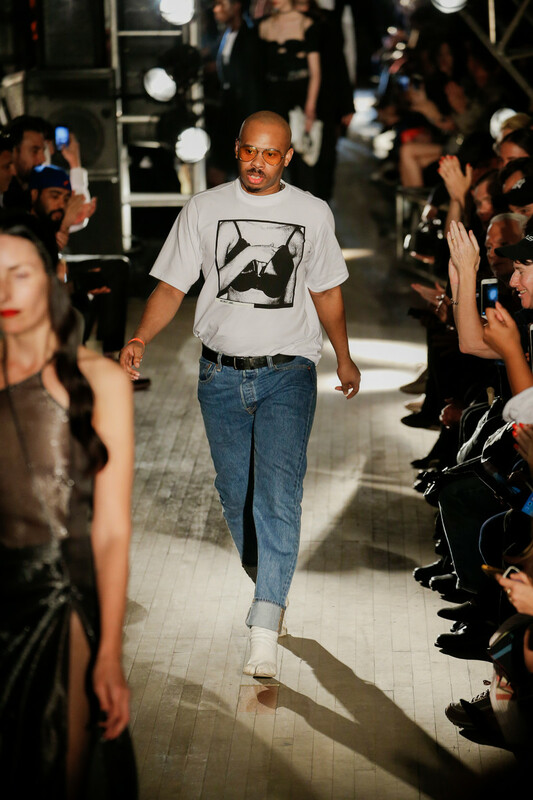 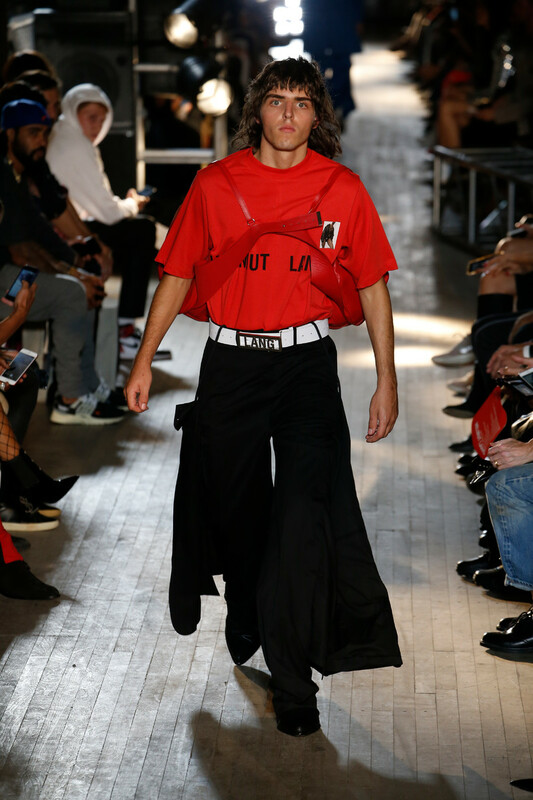 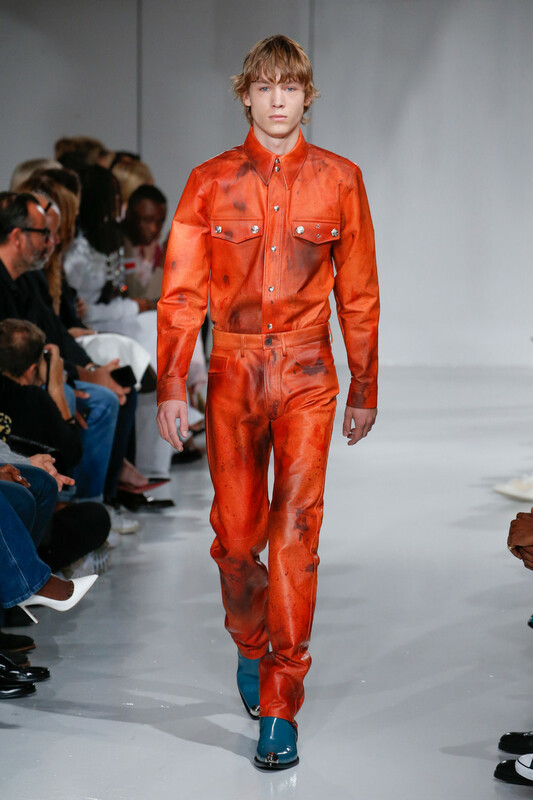 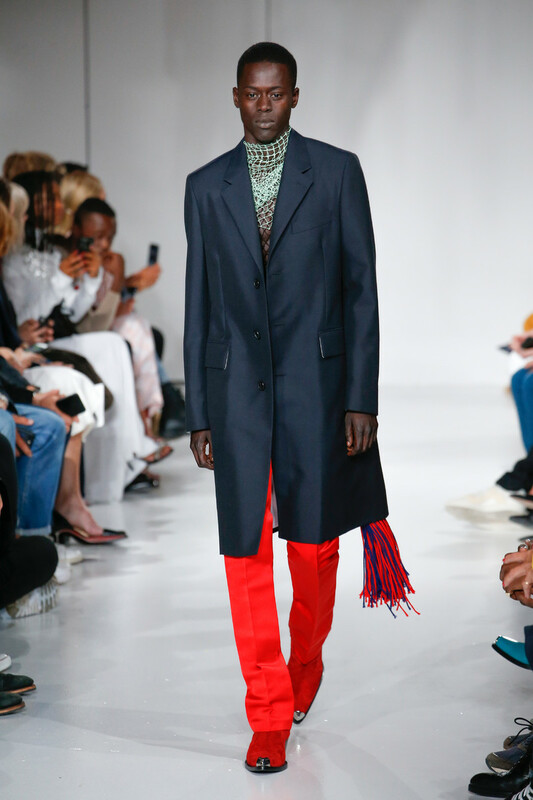 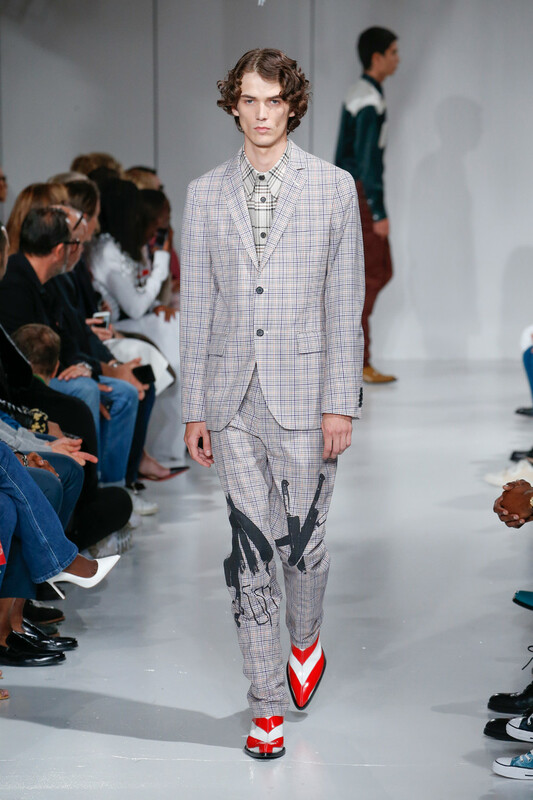 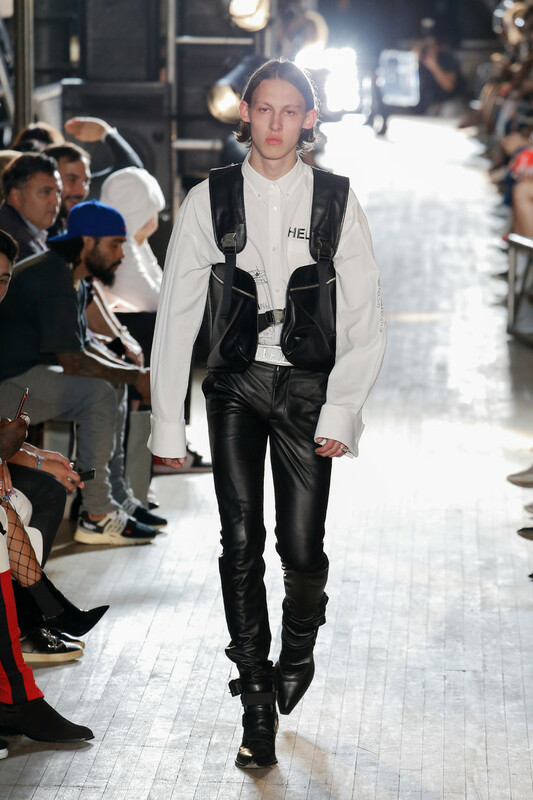 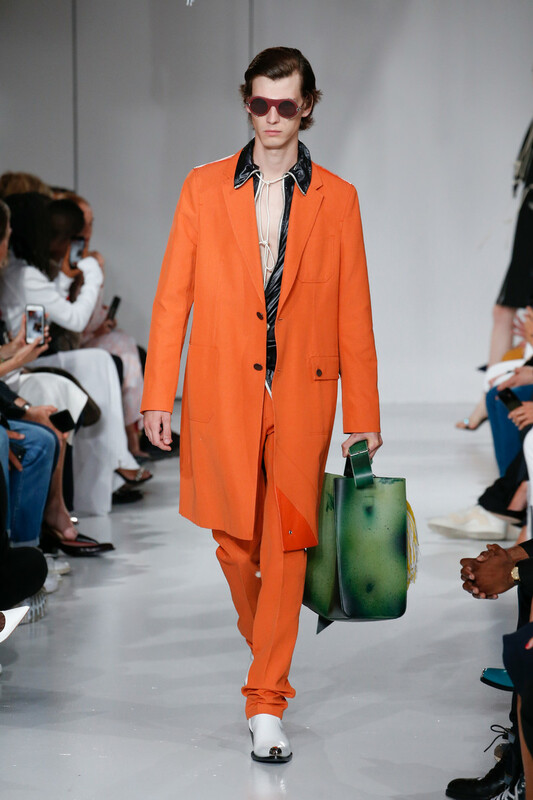 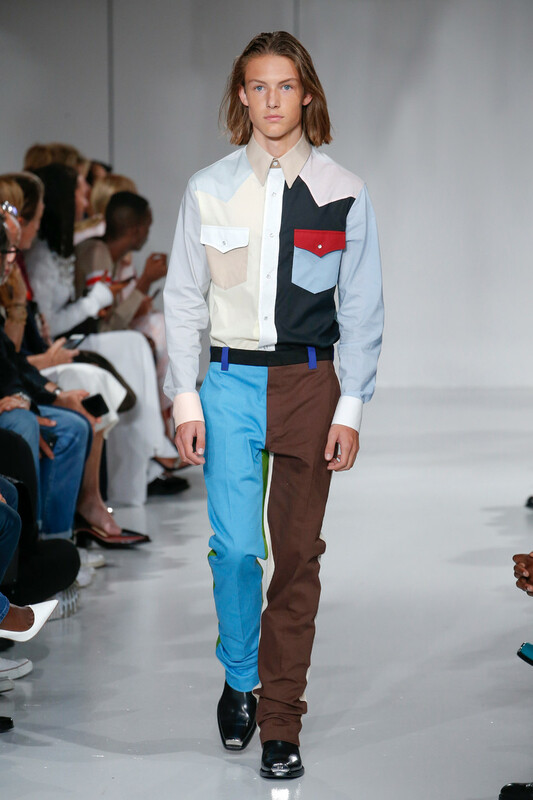 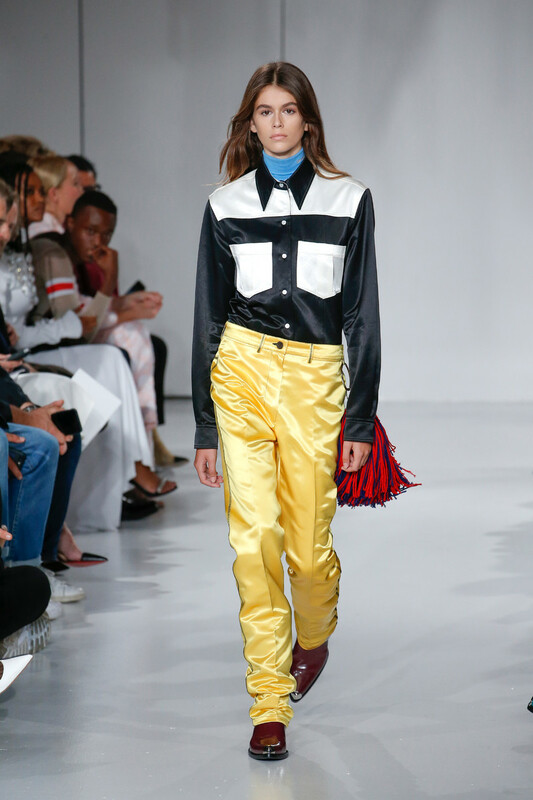 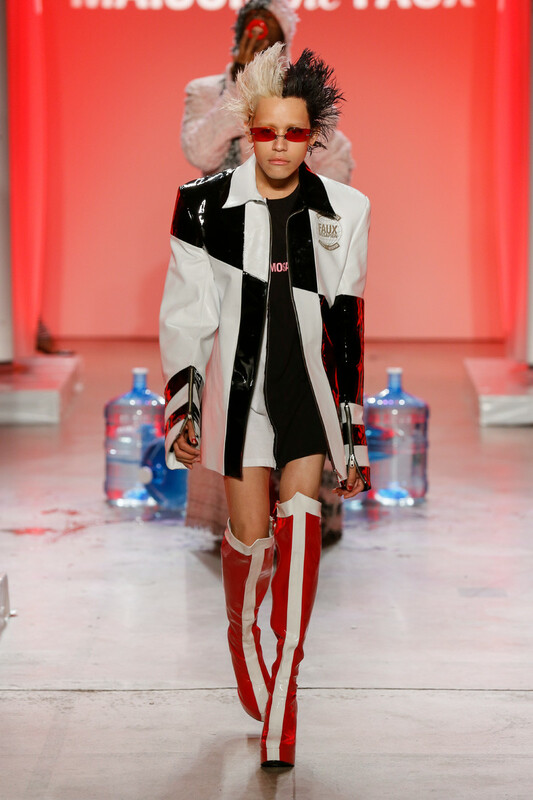 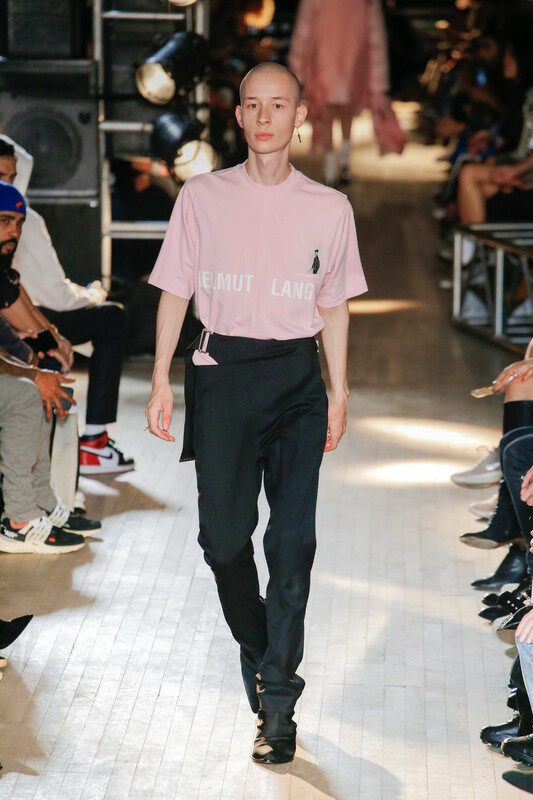 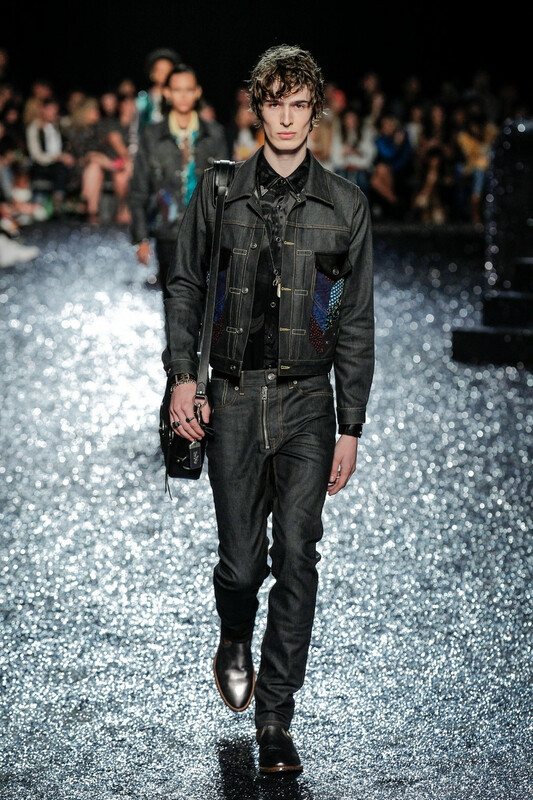 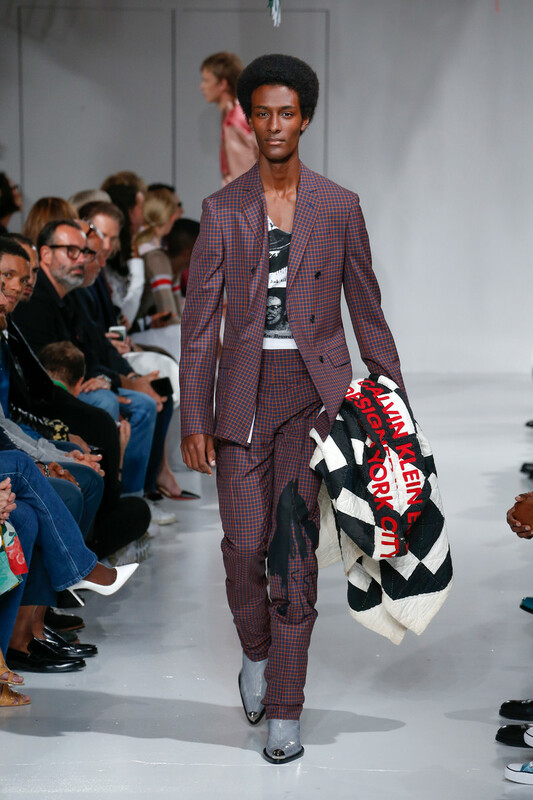 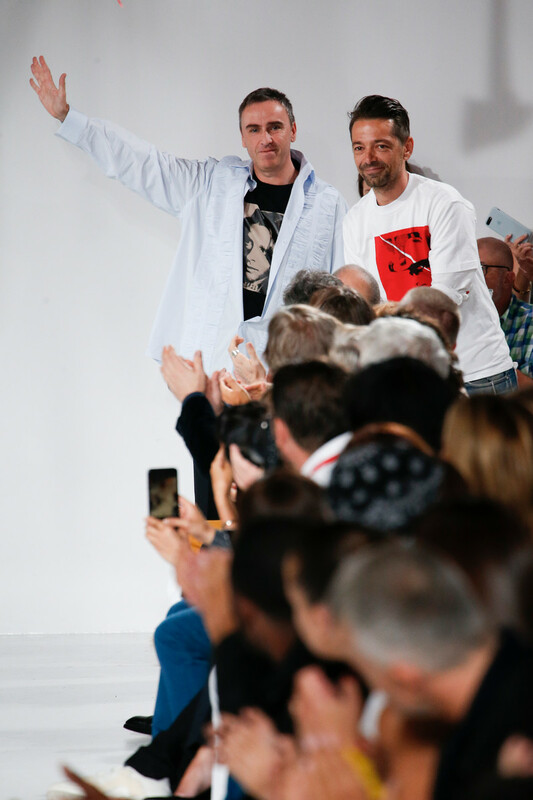 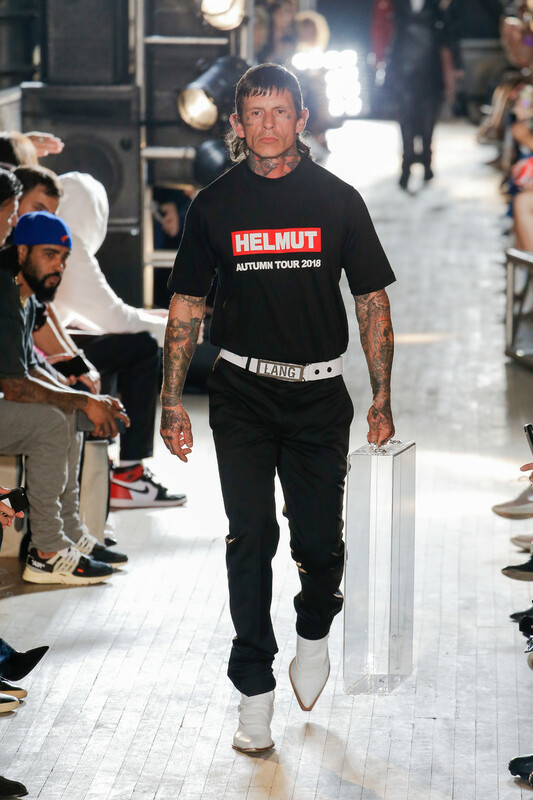 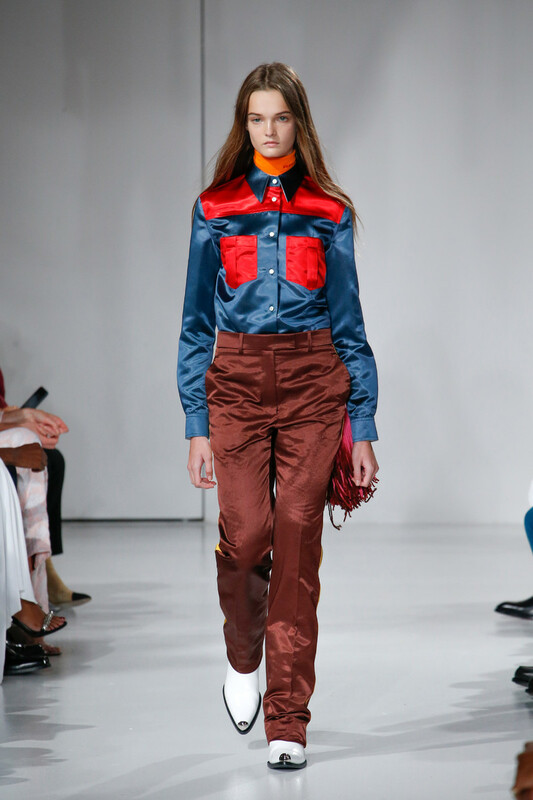 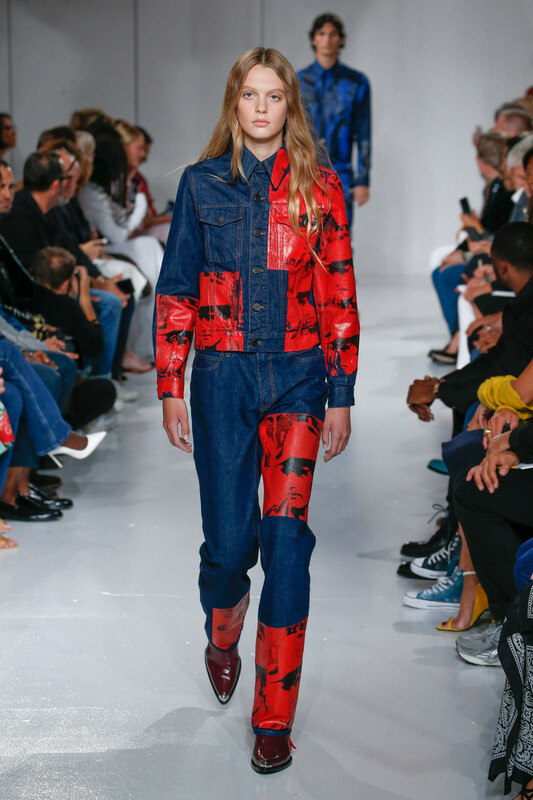 He presented Take Two on several very American motifs introduced in his debut collection — the denim, quilts and the color-blocked Western shirts with which he opened. 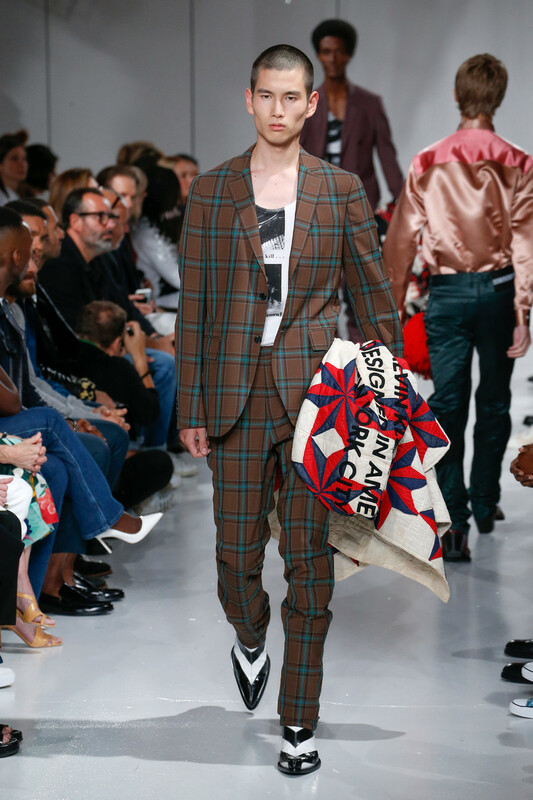 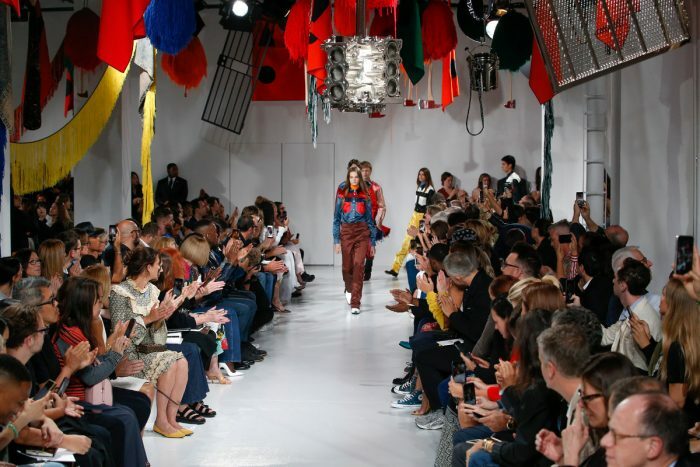 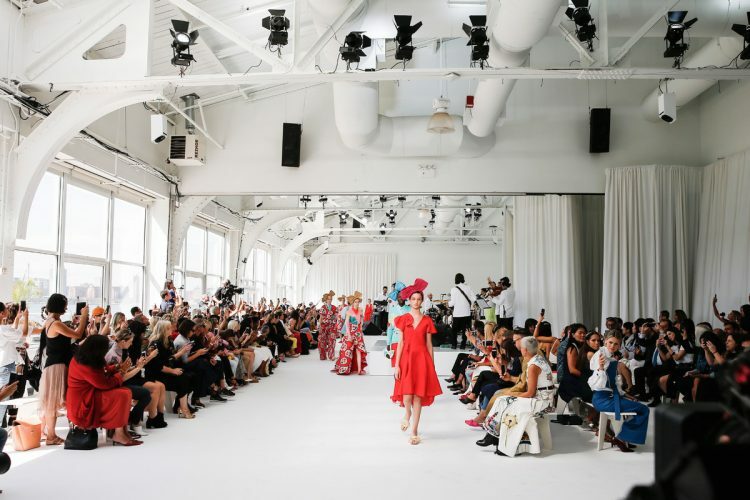 These made an odd kickoff to a show brimming with ideas: modernist nylon redos of full-skirted Fifties frocks, madcap dresses made from miles of yarn fringe, and, for men, lean-cut plaid suits that worked the chic side of geek. 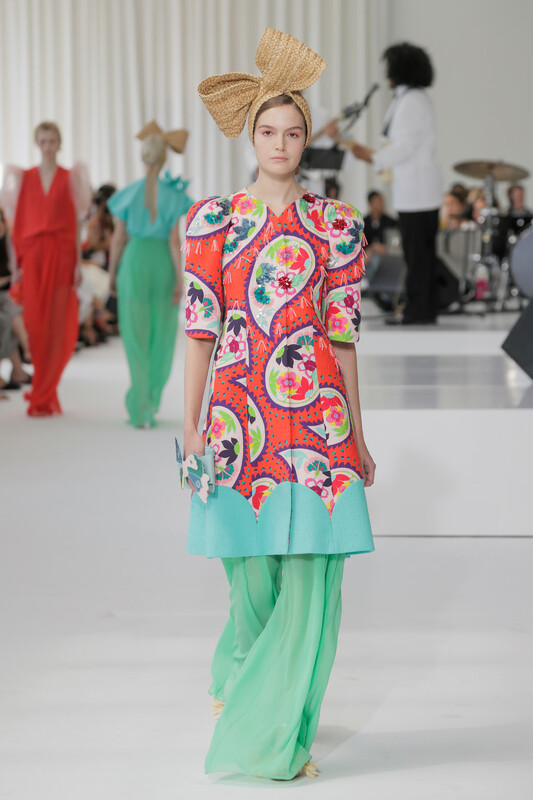 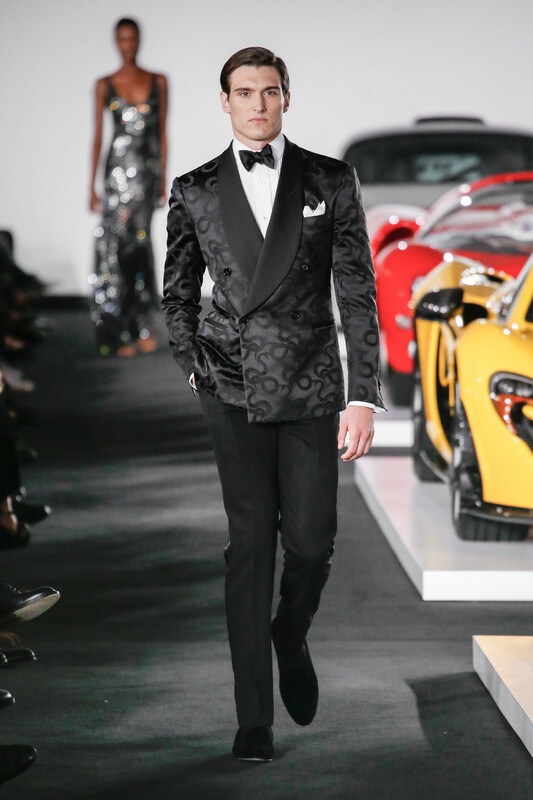 The clothes were often inventive and always impeccable. 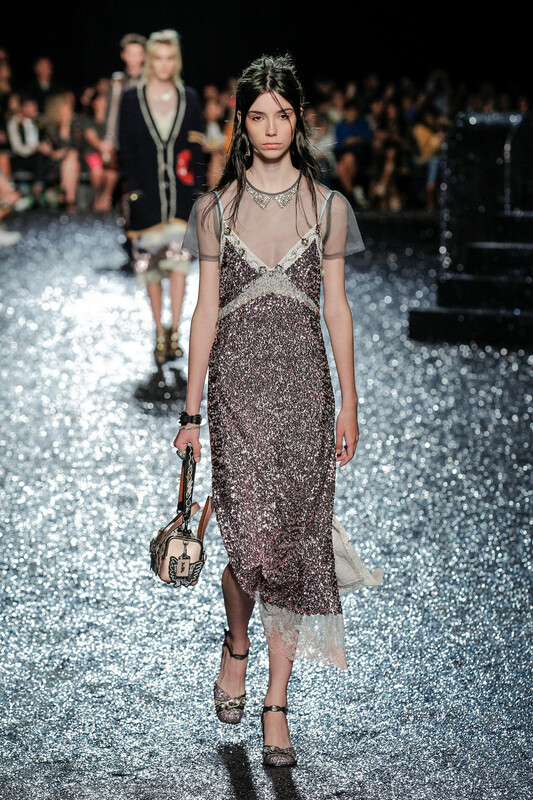 Yet it all felt a little hollow, observational rather than immersive. 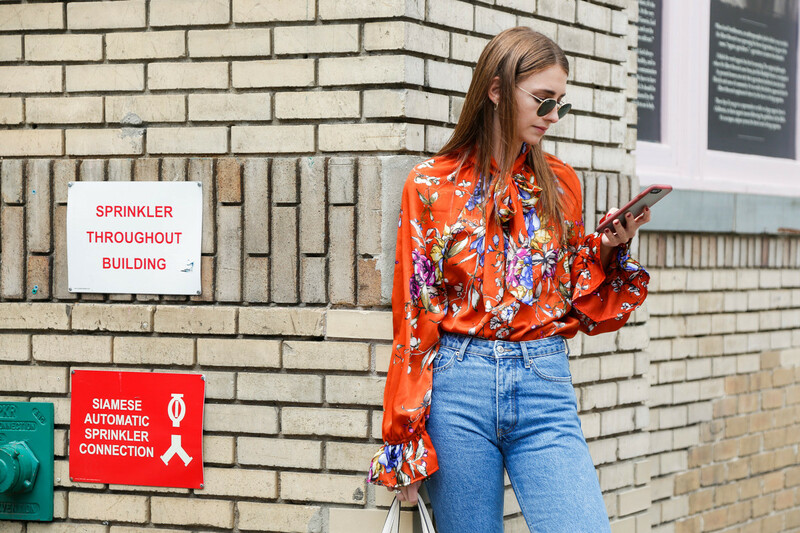 Perhaps it’s the difference between an intellectual and emotional approach. 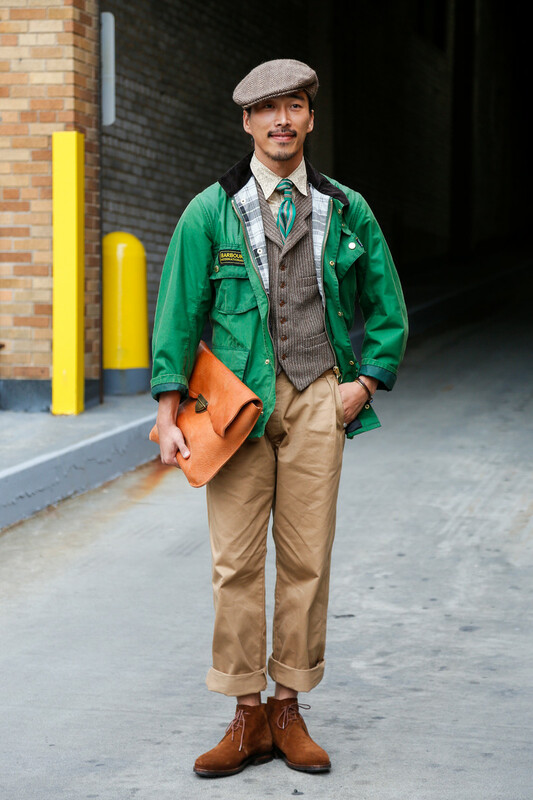 Simons falls in the former camp, and masterfully so. 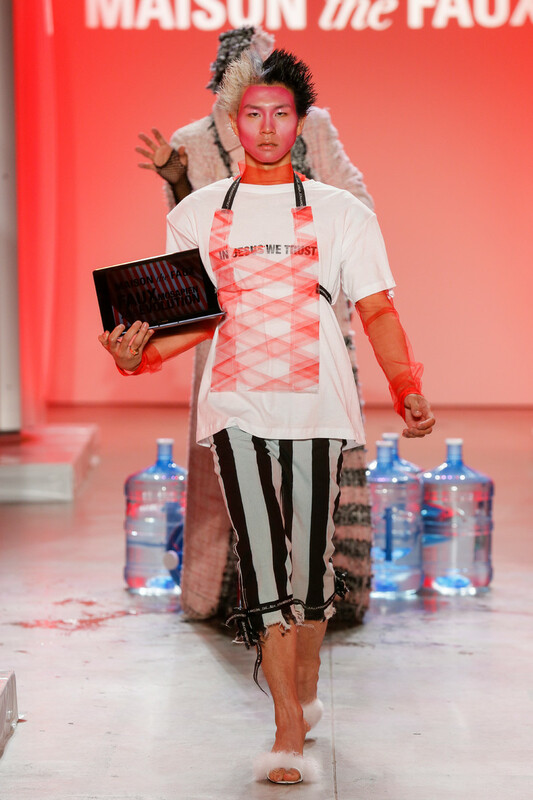 Yet horror is an emotional motif. 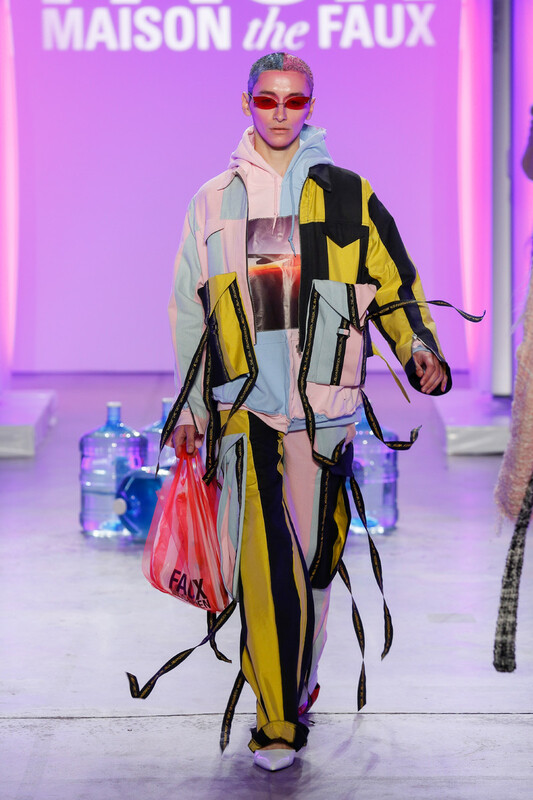 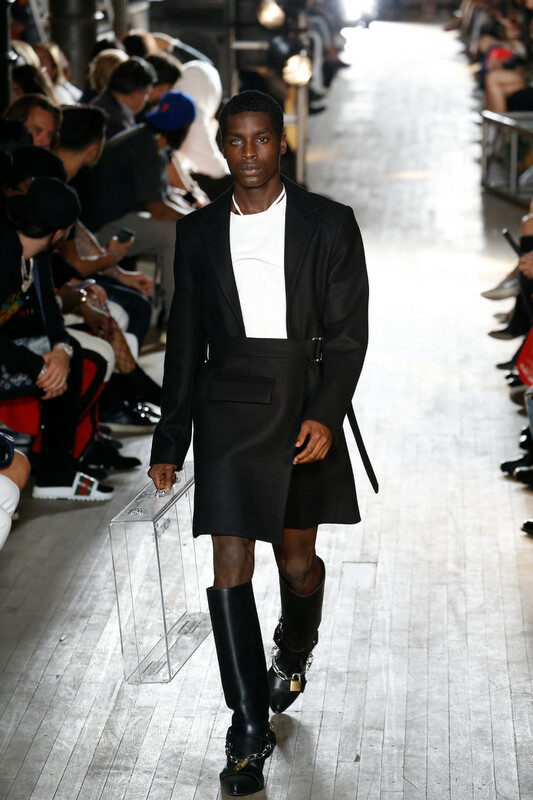 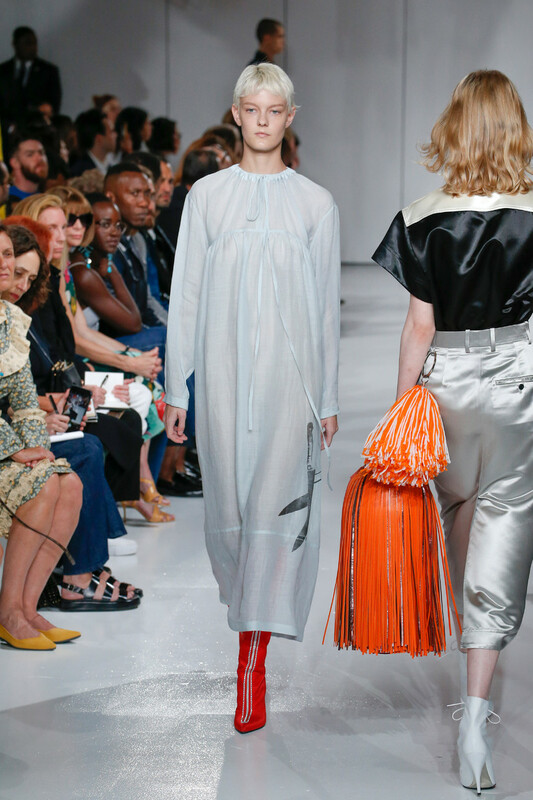 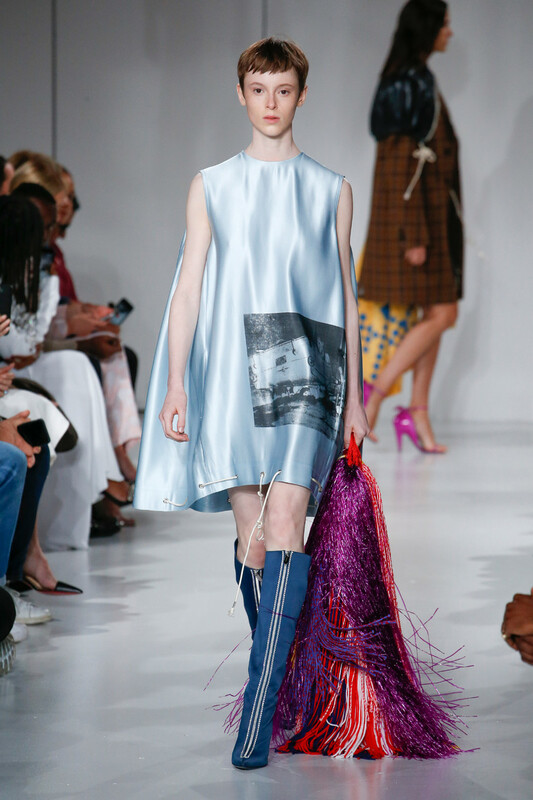 The show notes indicated “a corporeality that speaks of both sexuality and mortality.” That’s a lot to put on a dress — even one with Warhol knives on it. 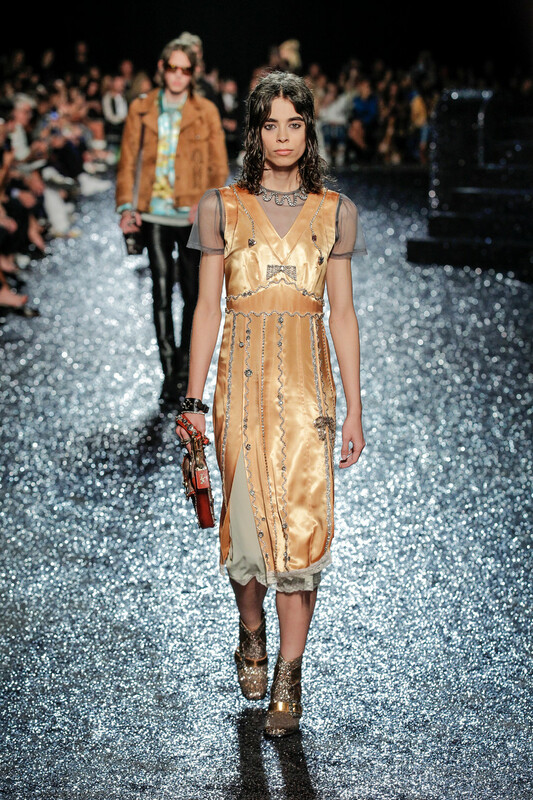 , our review will follow shortly. 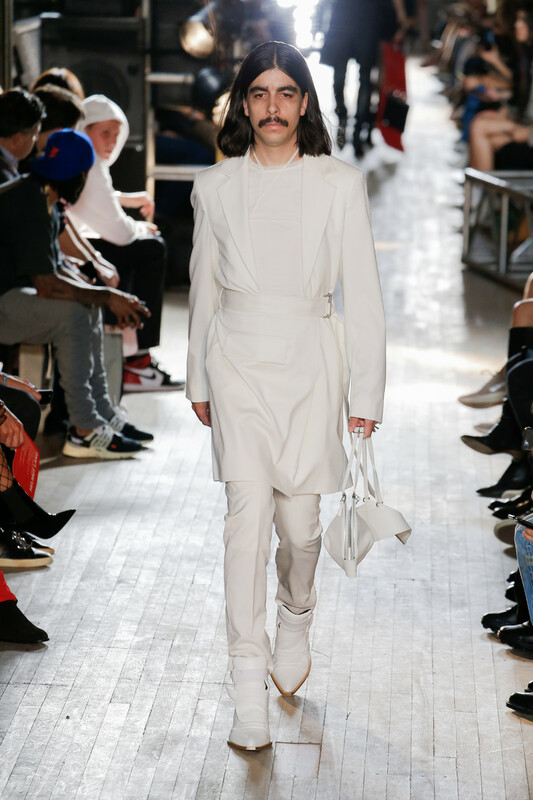 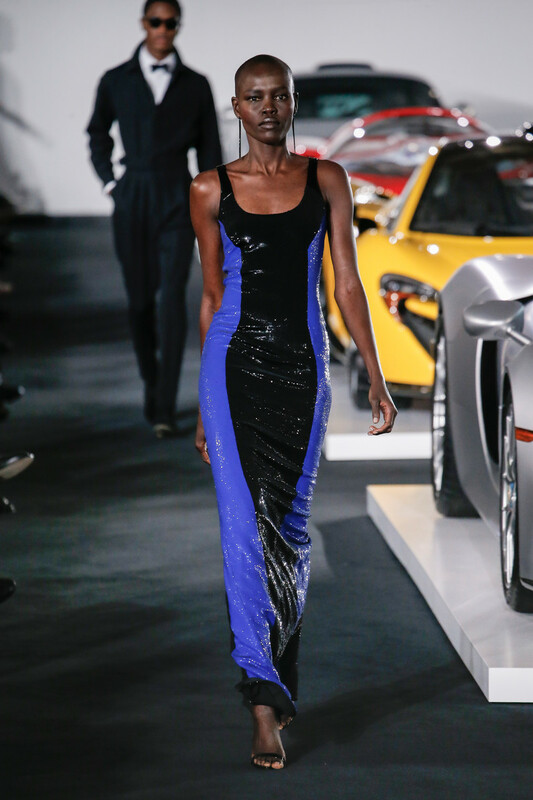 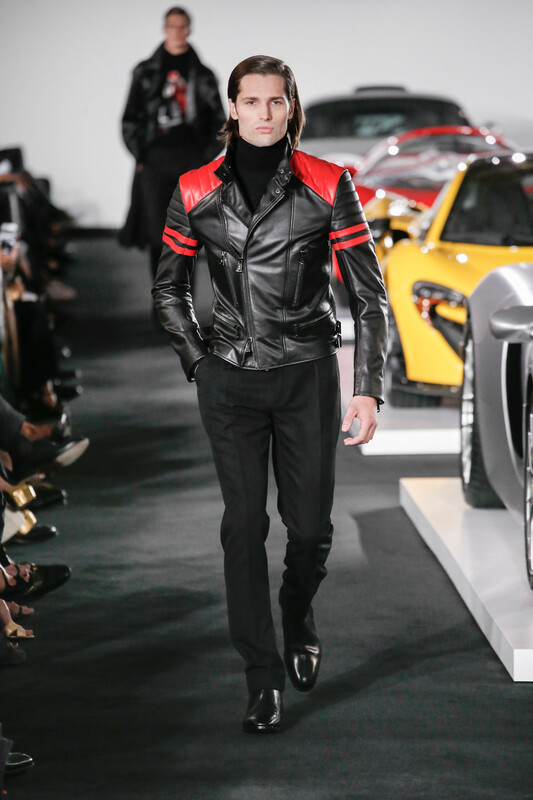 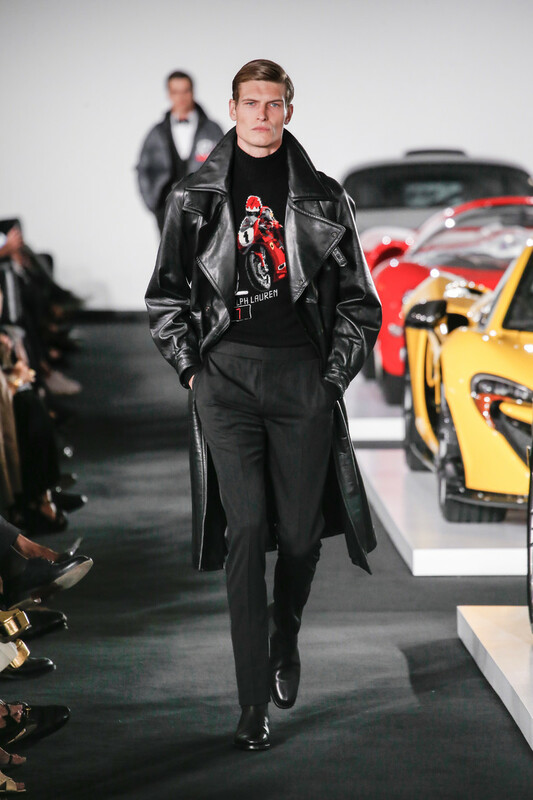 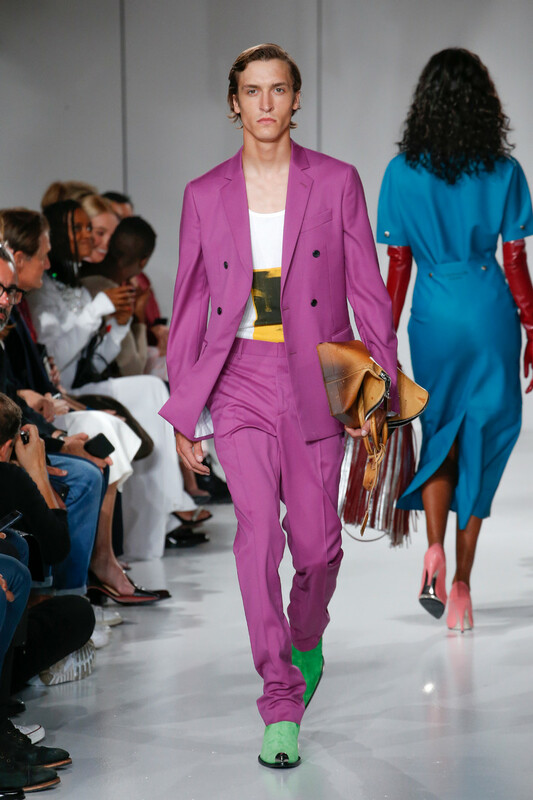 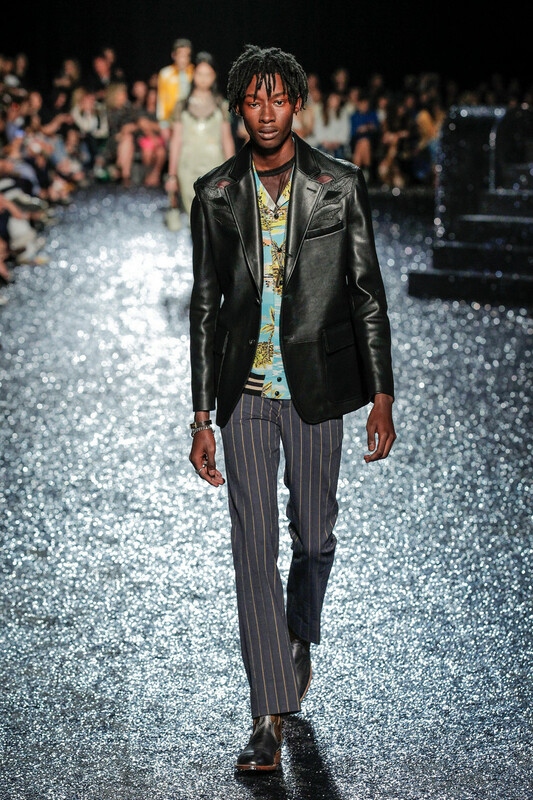 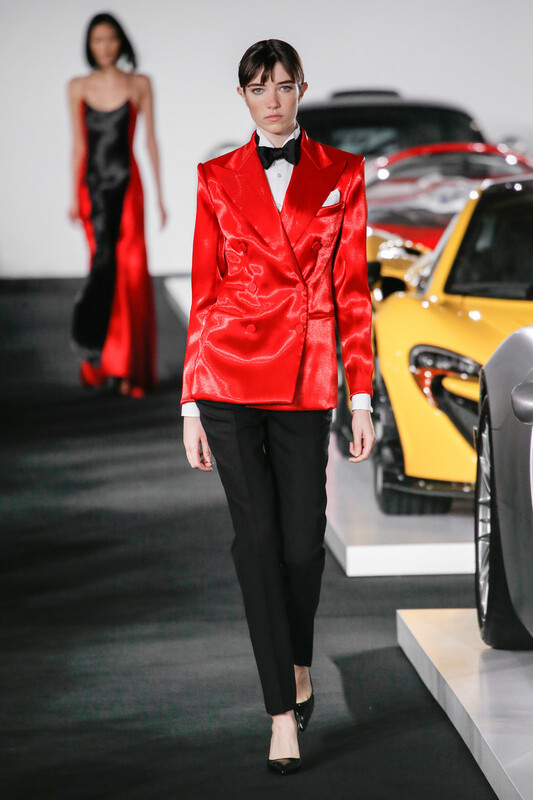 The spring summer collection Tom Ford presented was a classic one: the calculated decadence we know so well from Ford, rendered in a split between athletic-derived sportswear and power-woman goddess gowns. 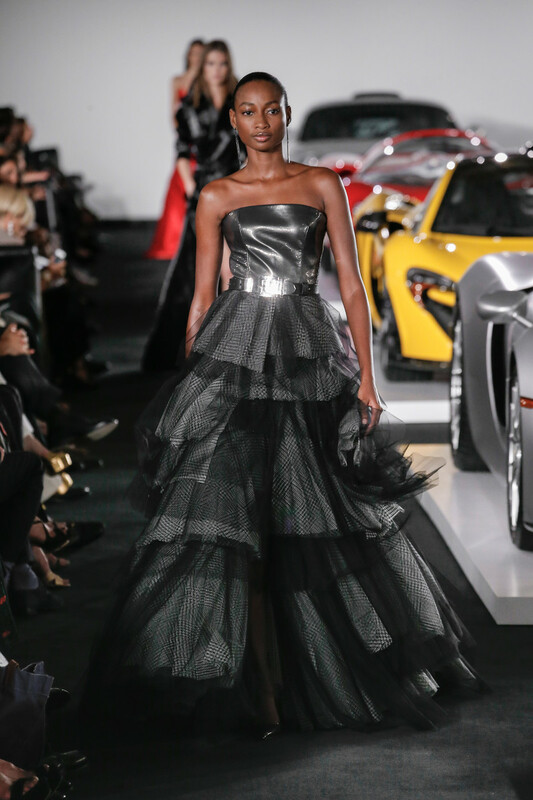 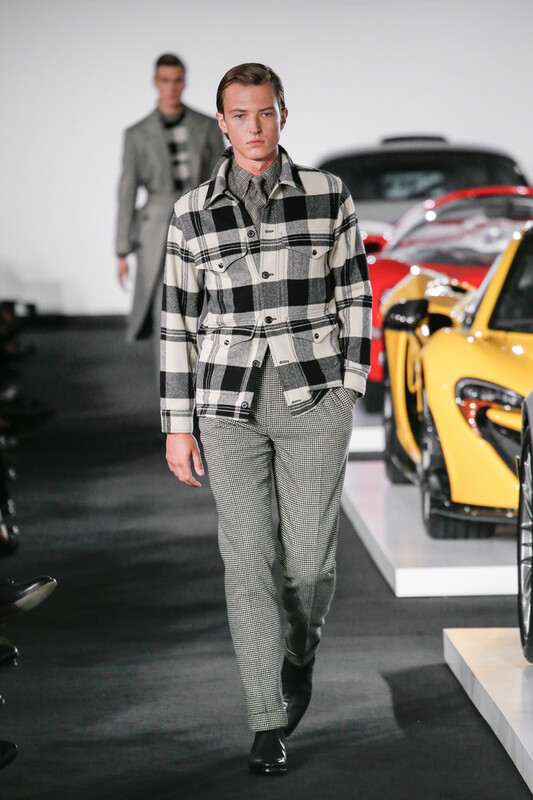 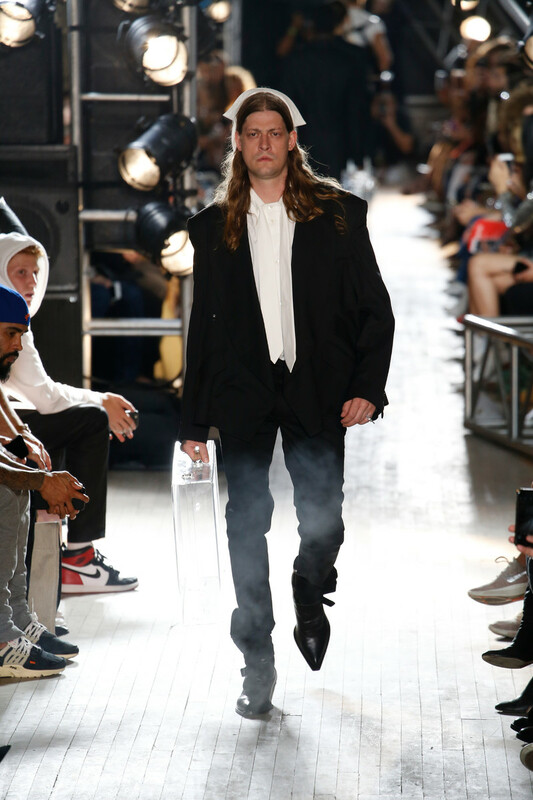 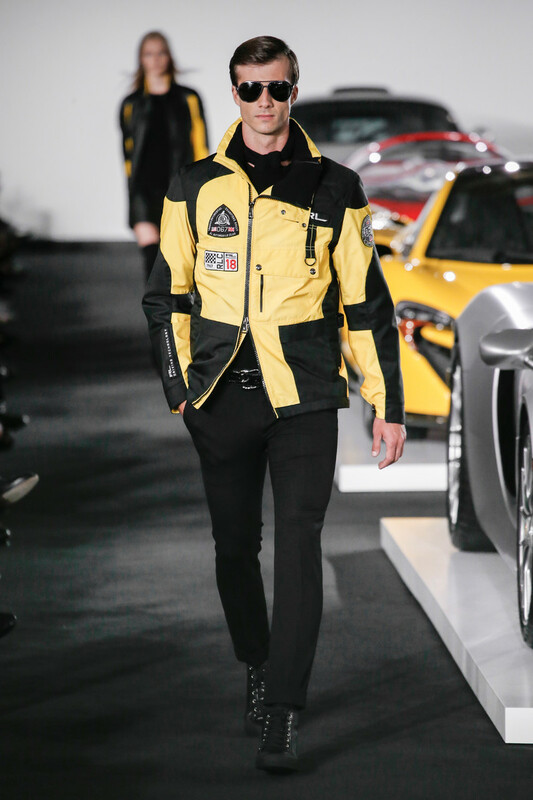 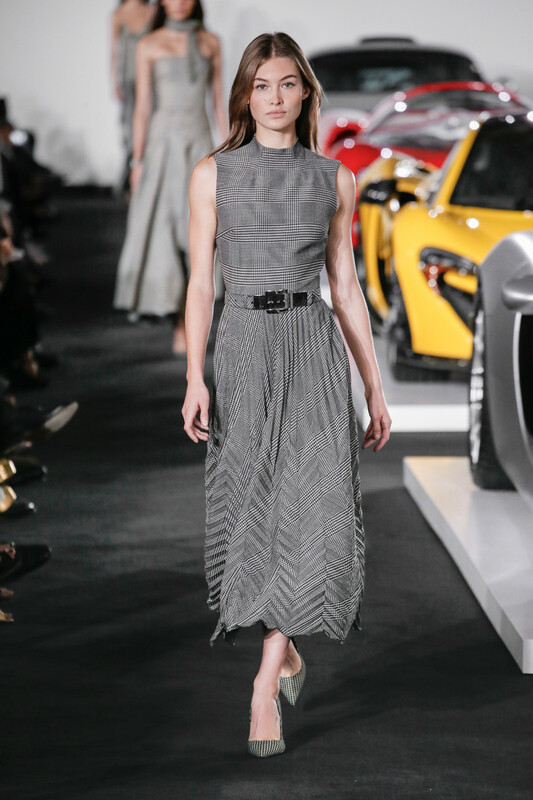 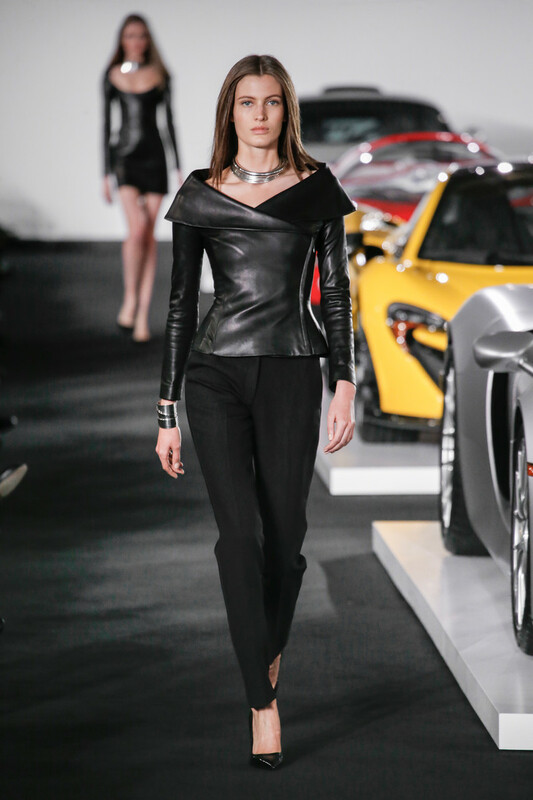 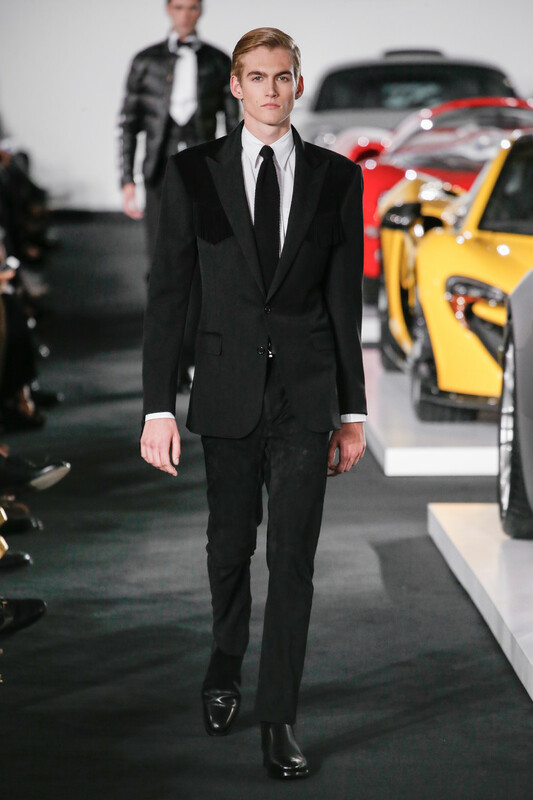 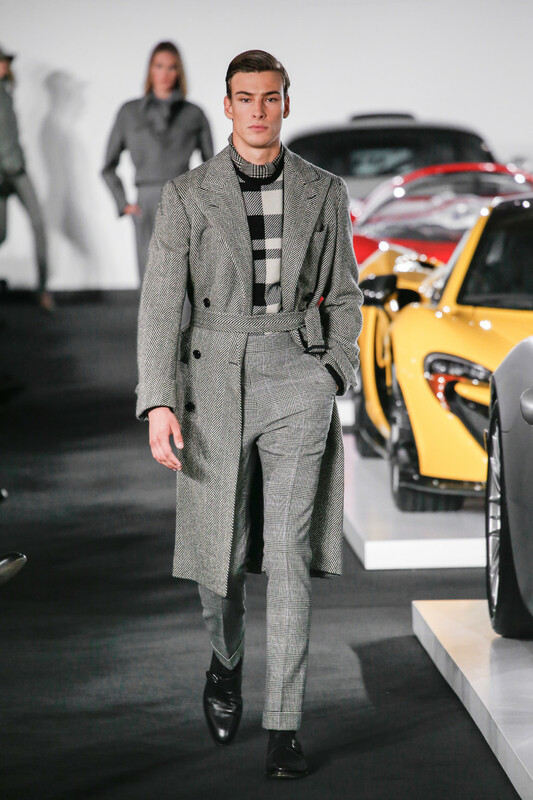 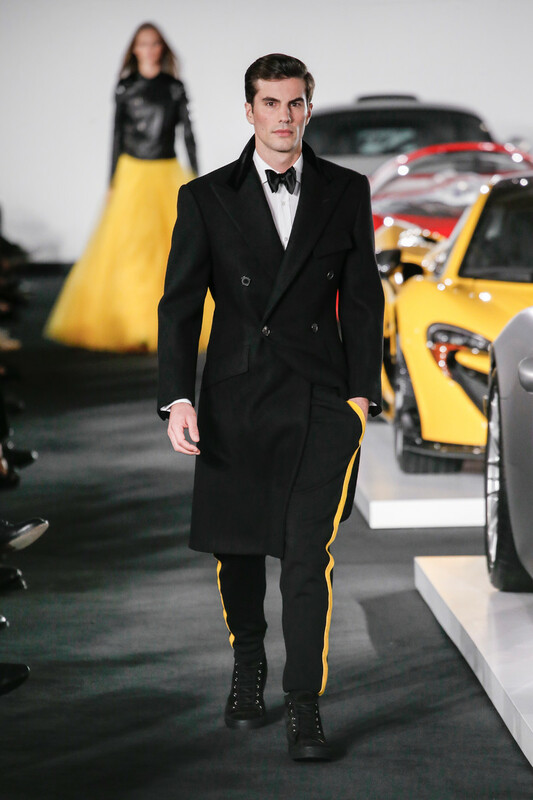 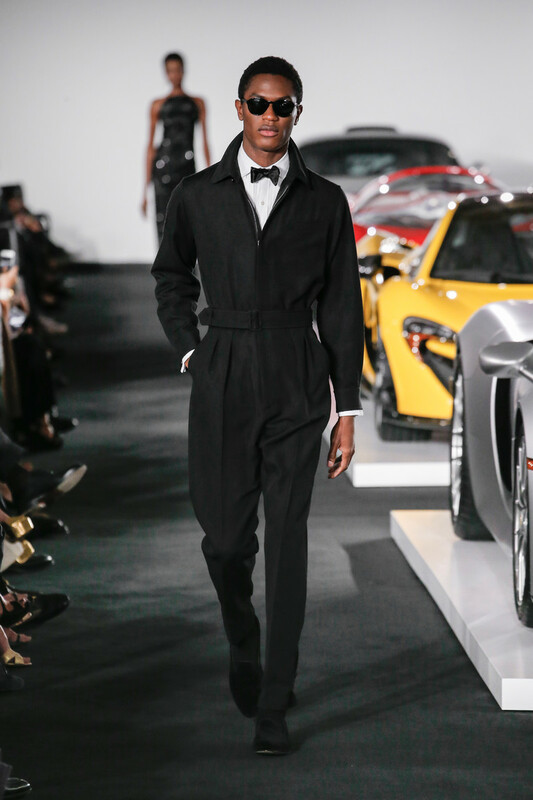 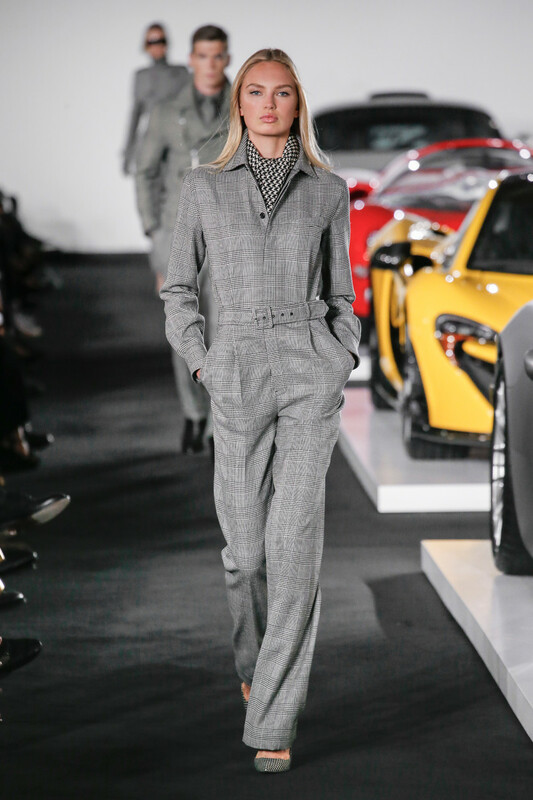 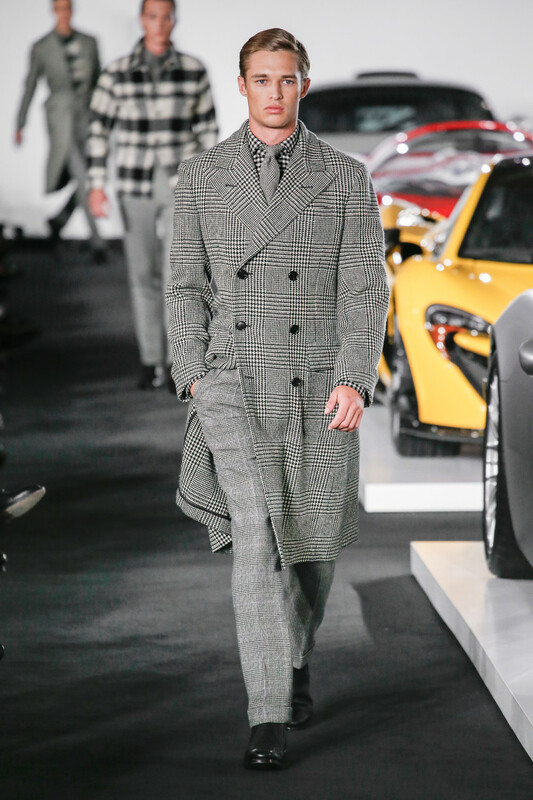 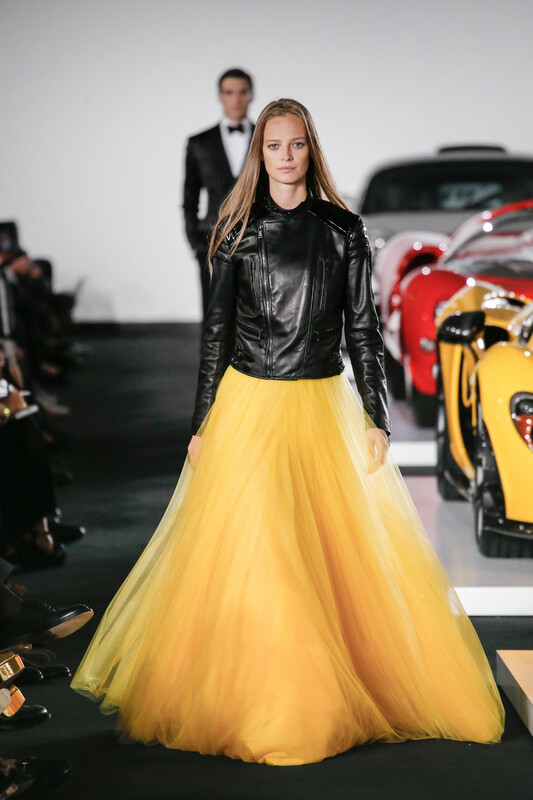 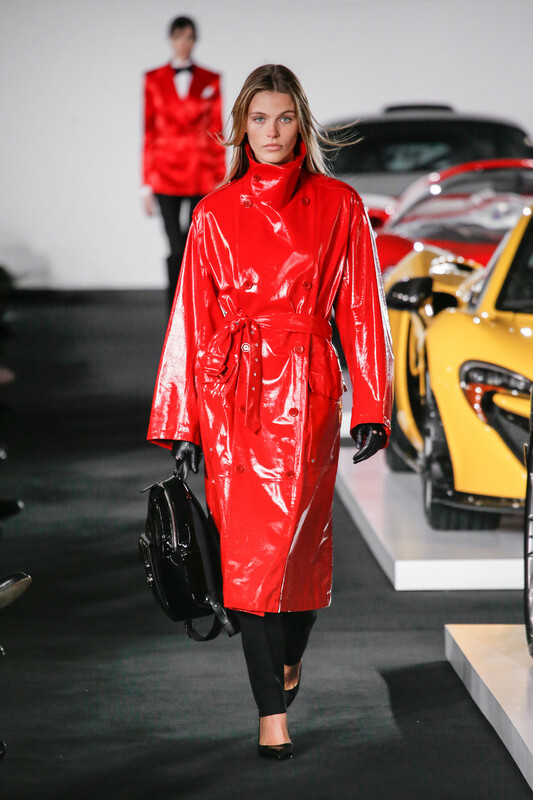 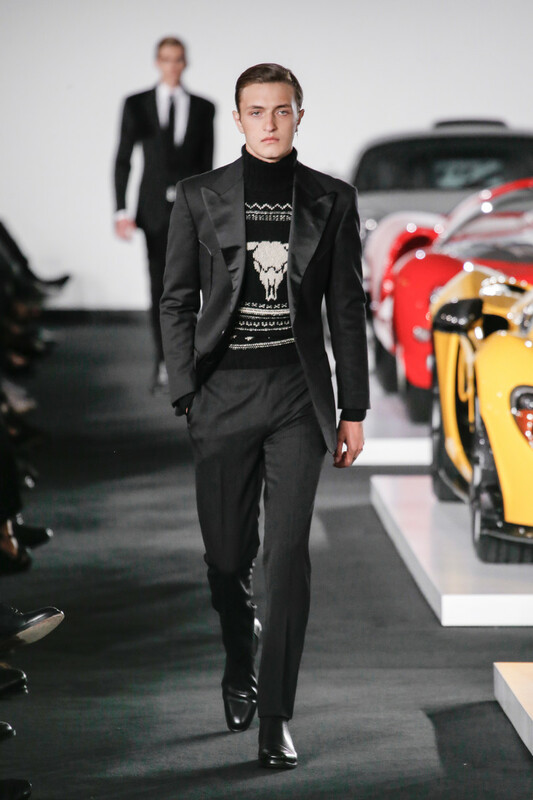 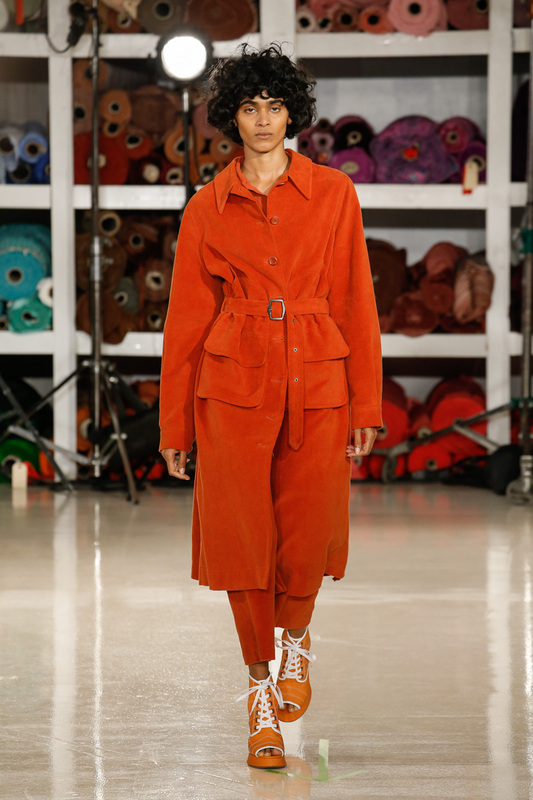 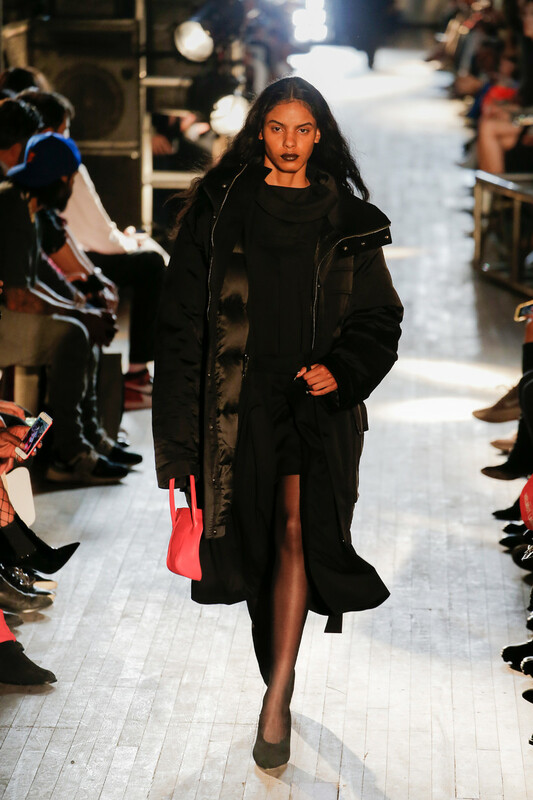 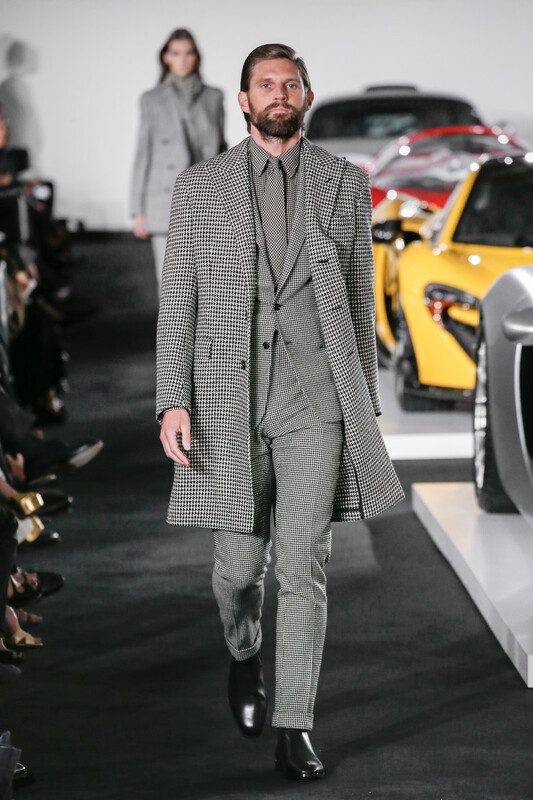 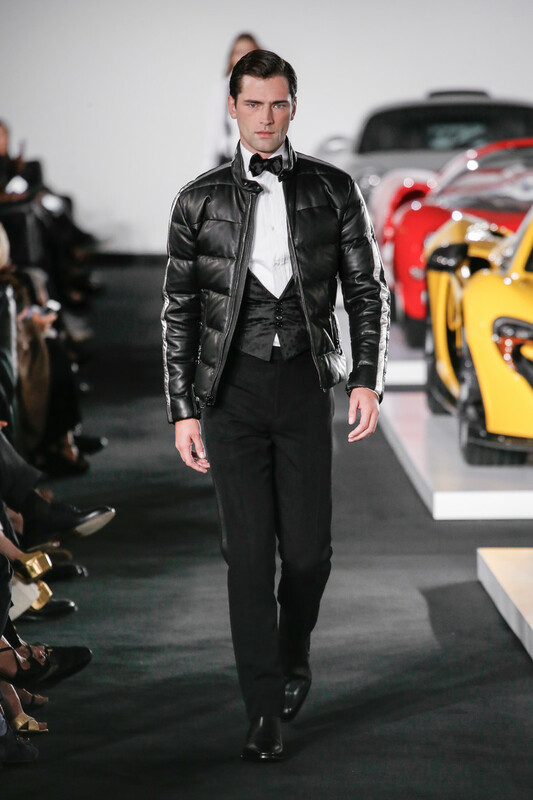 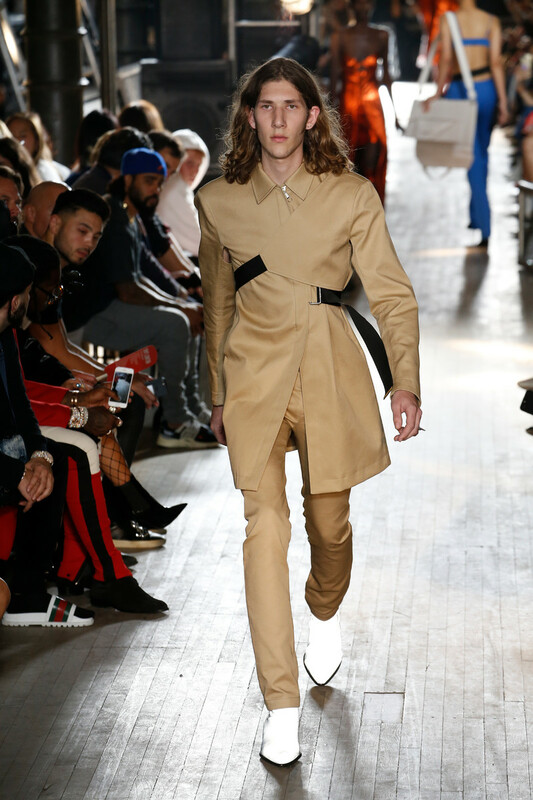 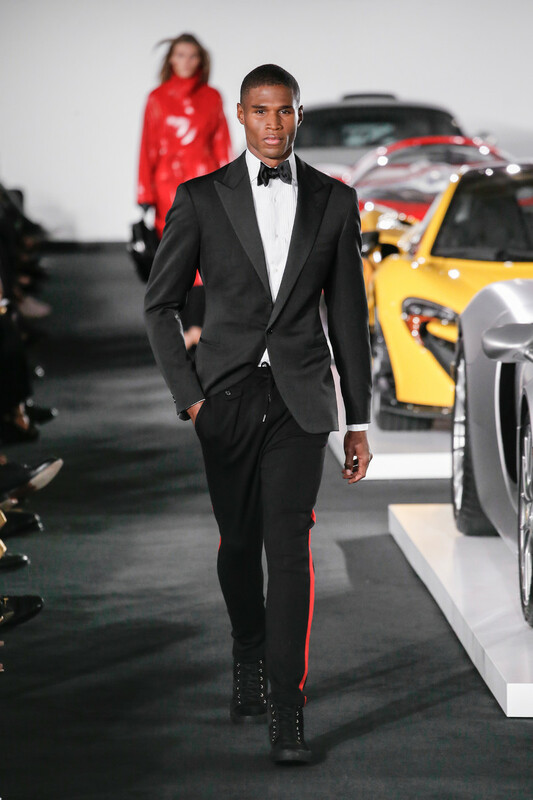 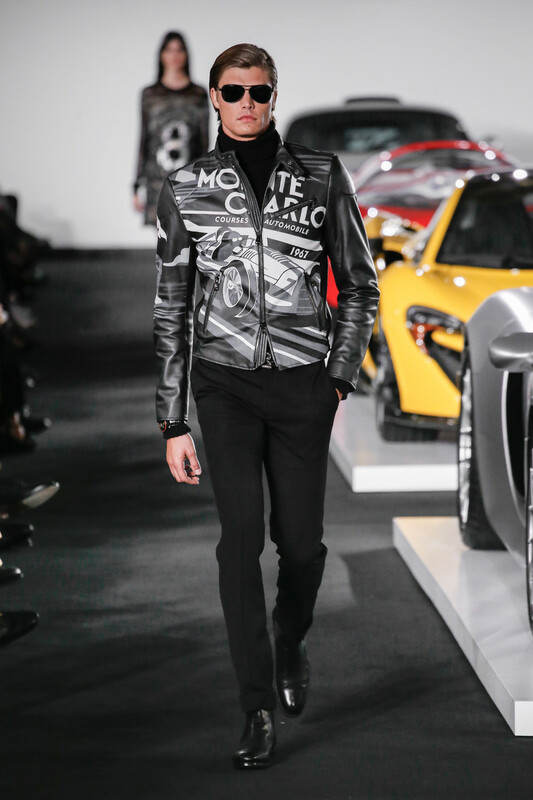 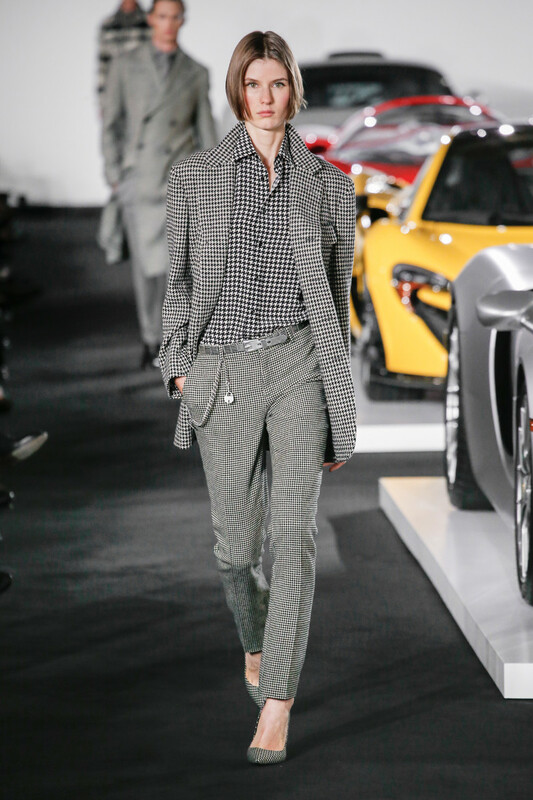 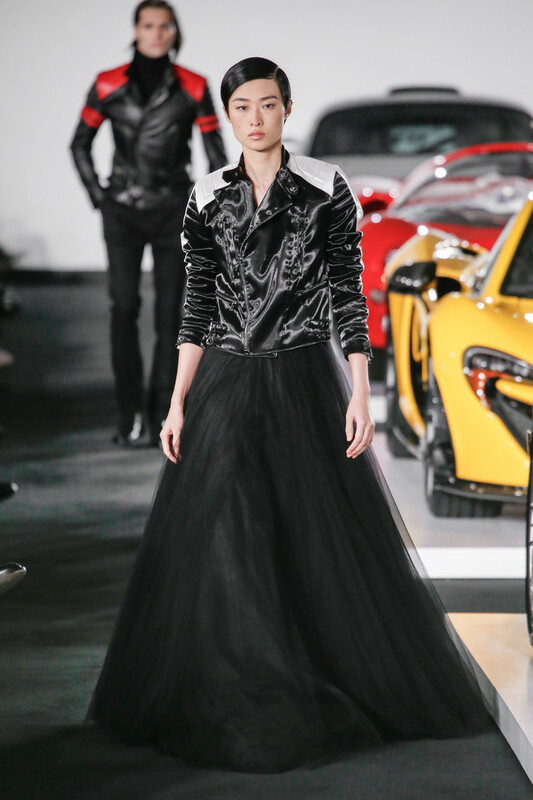 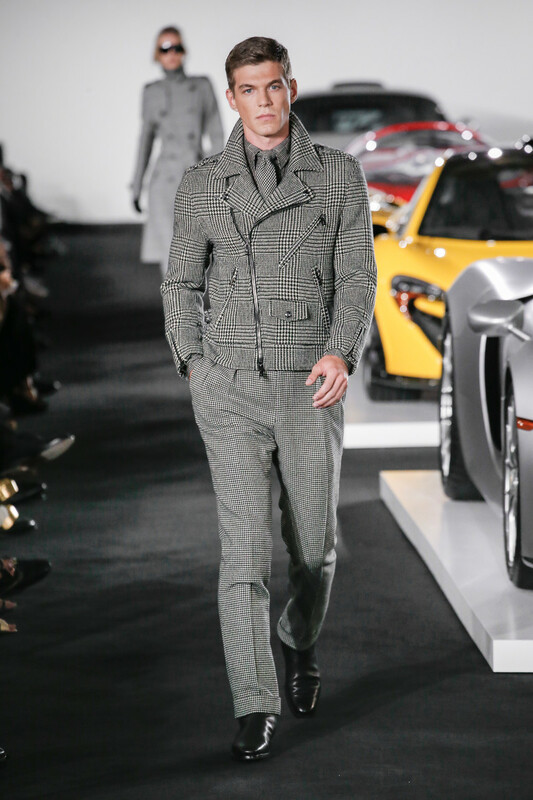 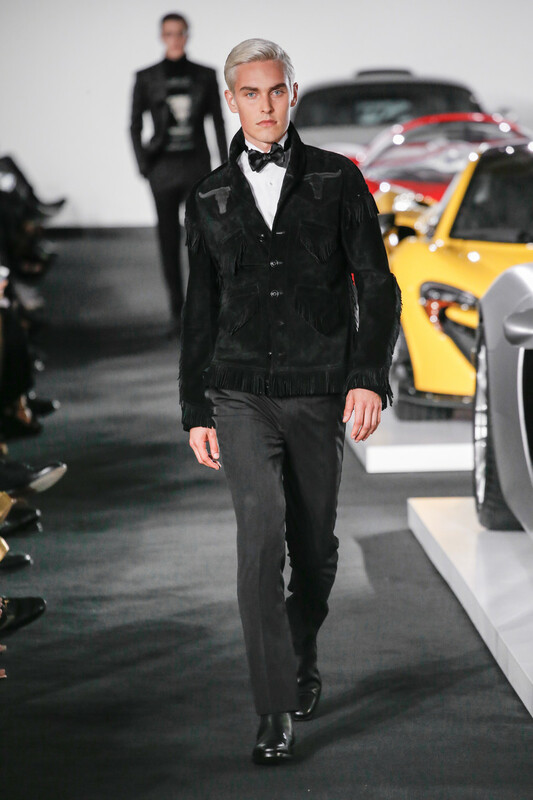 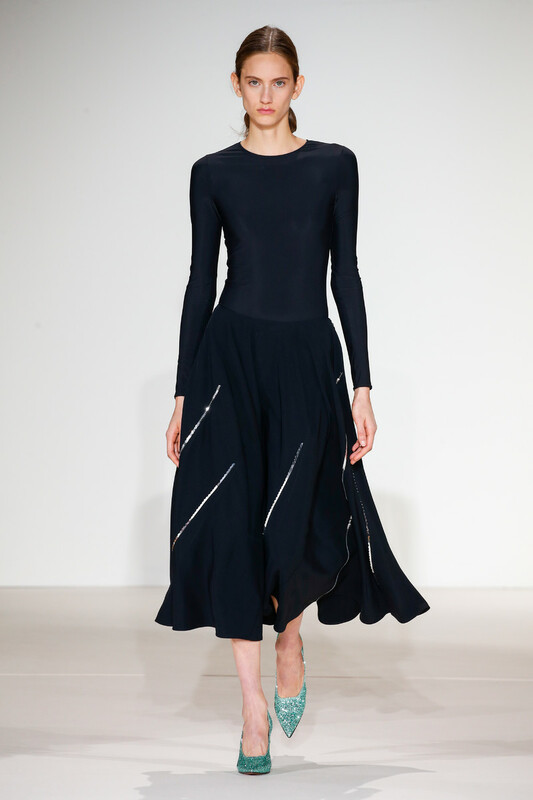 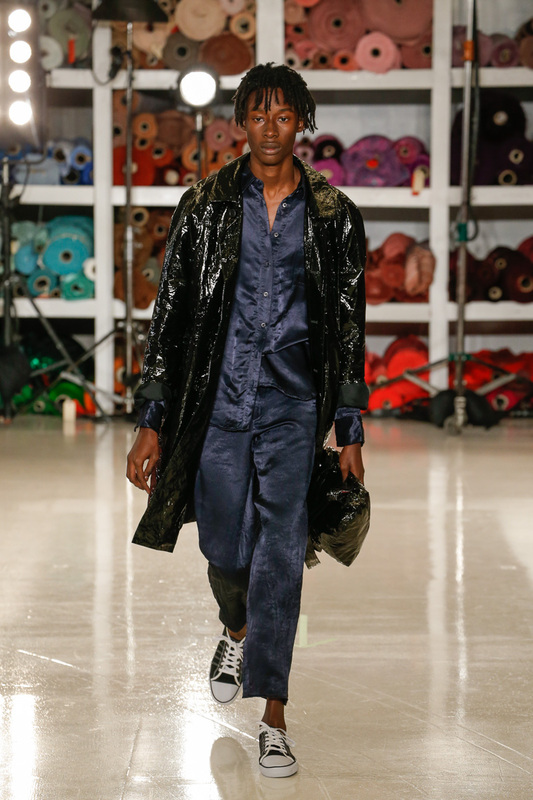 Crossover of athletica into the primary daywear vernacular aside, Ford loves tailored polish. 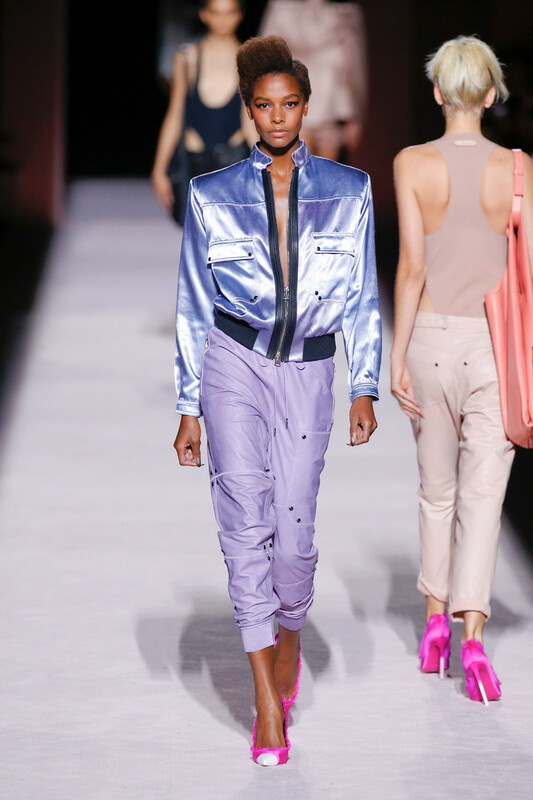 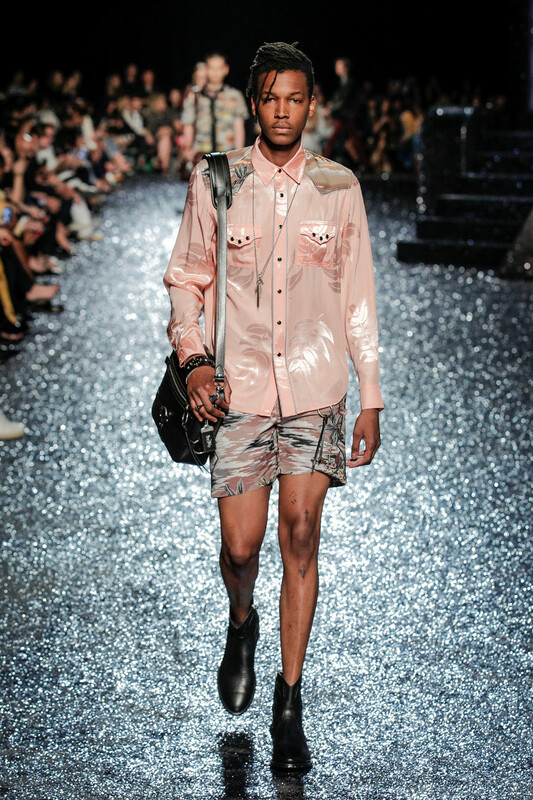 He opened with a bold-shouldered pale pink satin tuxedo jacket over a liquid metallic top and short-shorts, rolled at the hem. 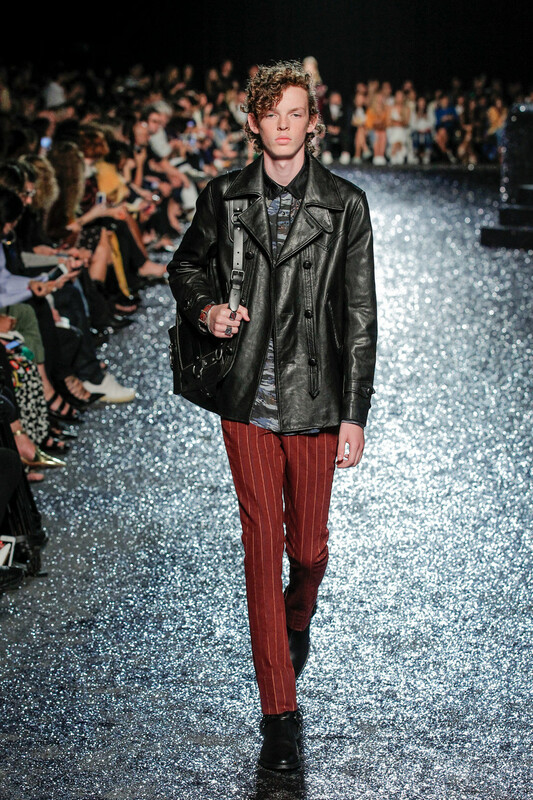 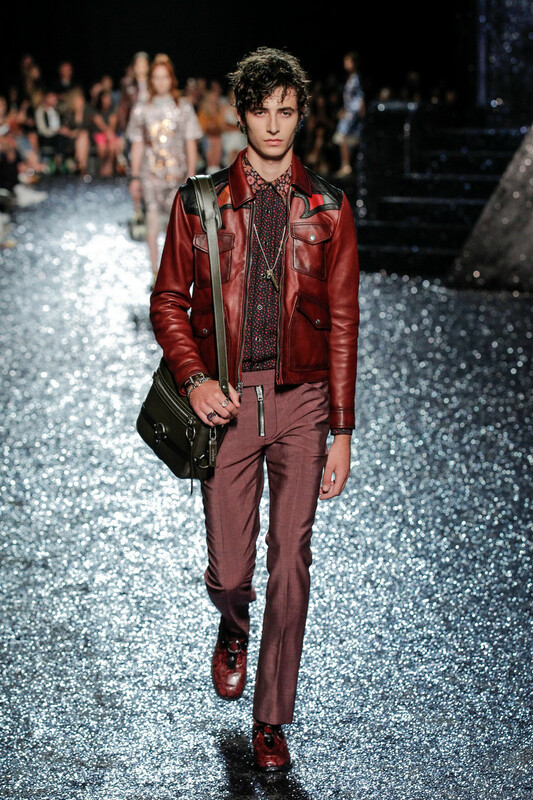 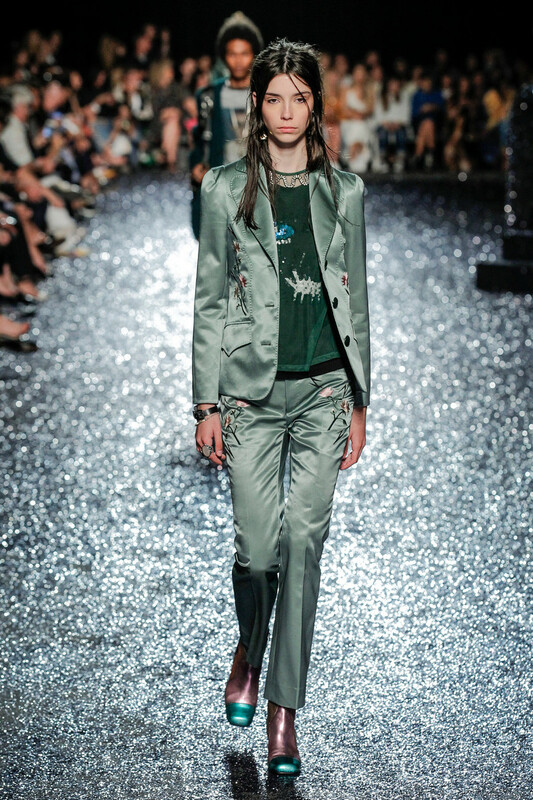 Unlike the old Gucci days when he worked the daylights out of a single look, here he offered options, some approachably chic, others challenging to all but the most secure of attitude and body image: classic pantsuits, dressed-up dark denim, short leather trenches and racy jumpsuits. 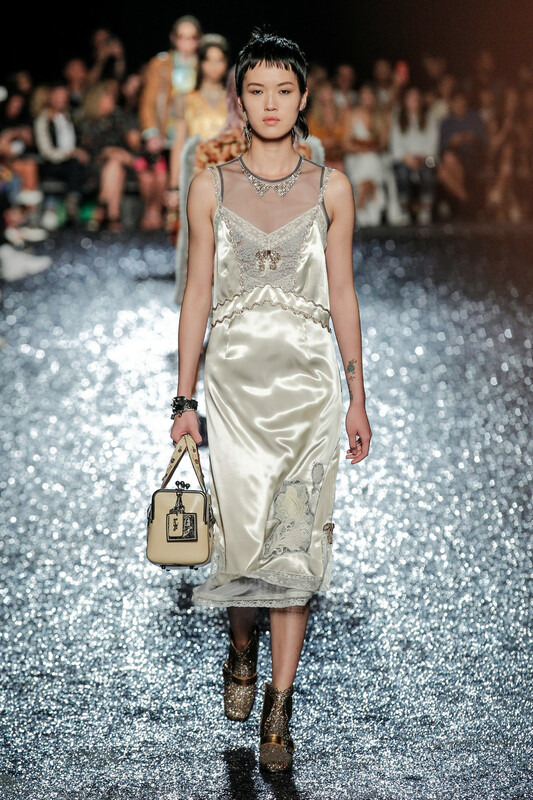 One, a long, backless drink of water in white crepe, rang the bell of a long-ago Gucci dress with a cutout abdomen. 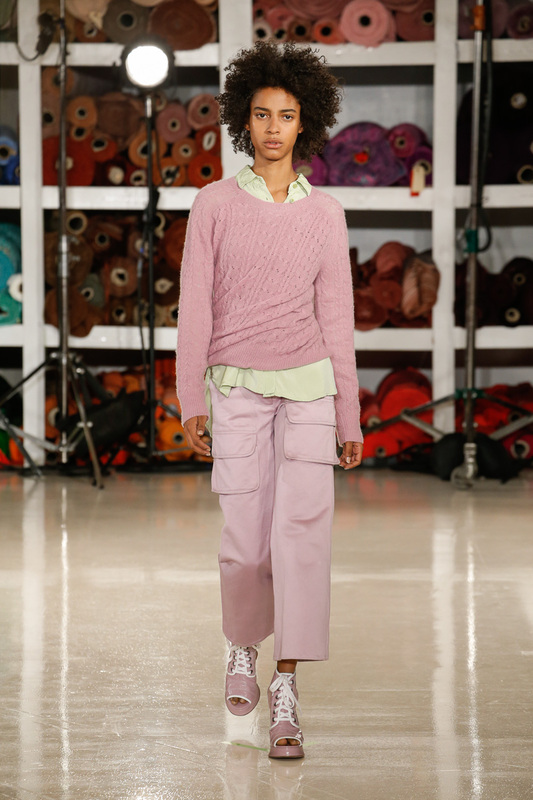 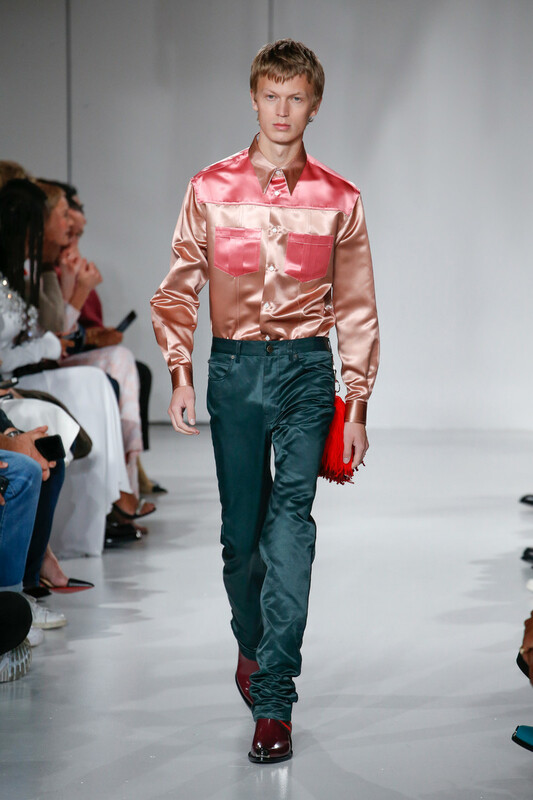 An infusion of wit came in an only Tom take on the twinset: slouchy chain mail shoulder bag and matching briefs worn with a louche pale pink top. 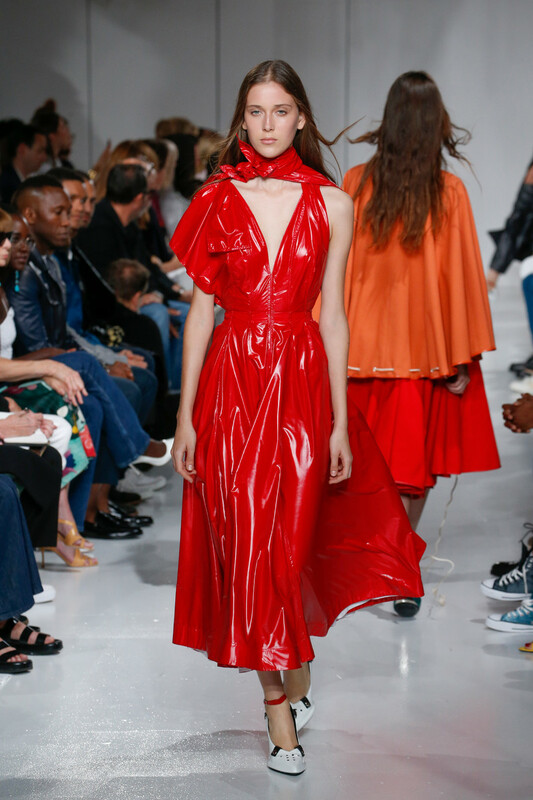 As for the eveningwear, strong shoulders and sequined sleeves transported classic draping from ethereal to aggressive, as glam as it gets. 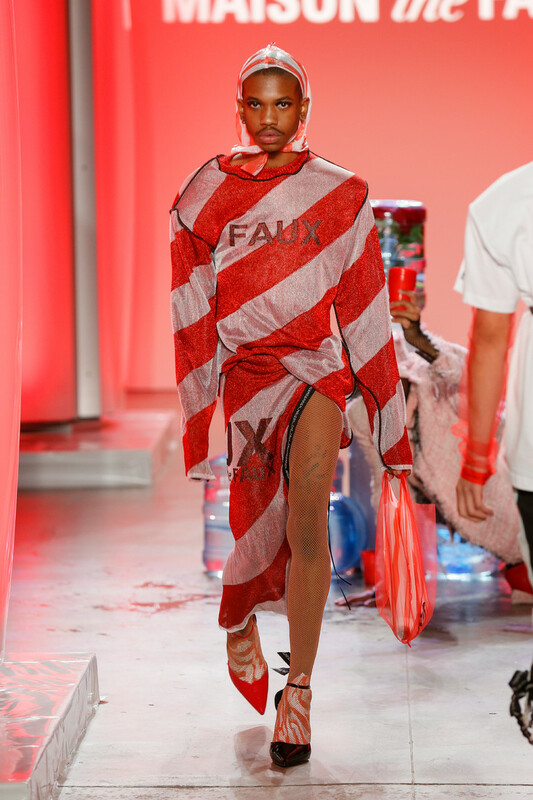 The takeaway was of familiar audacity. 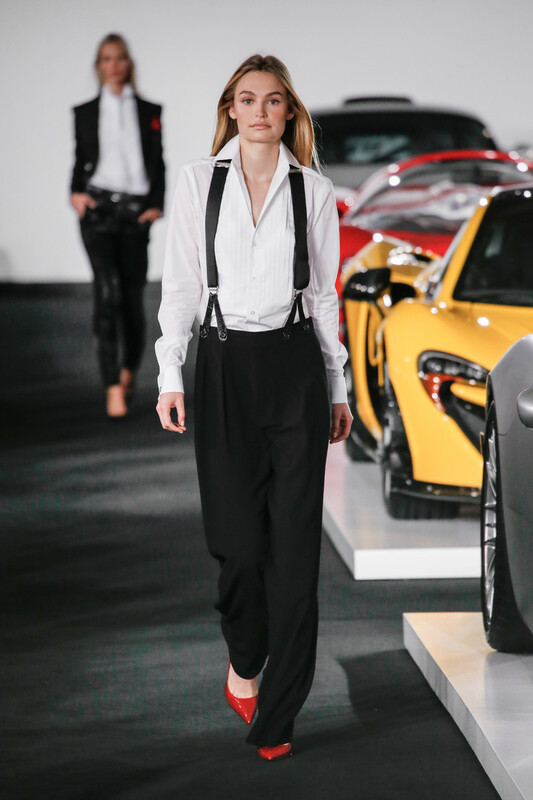 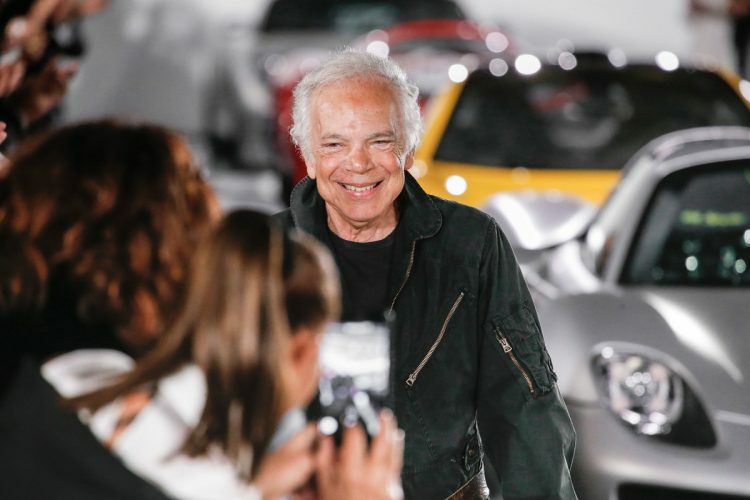 Ford believes genuinely in the transformative power of clothes. 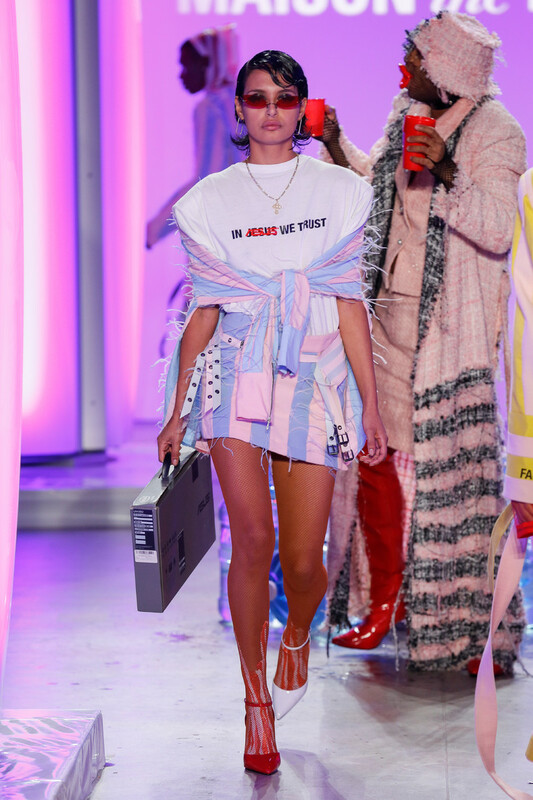 It didn’t come easily. 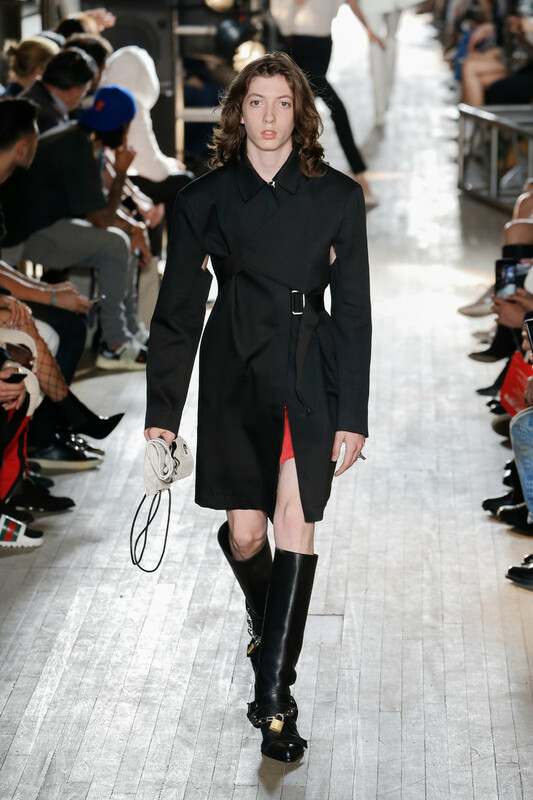 To replicate the original getups, Ford wanted old-school tube socks, to the knee, but his staff came up empty — today’s versions hit midcalf. 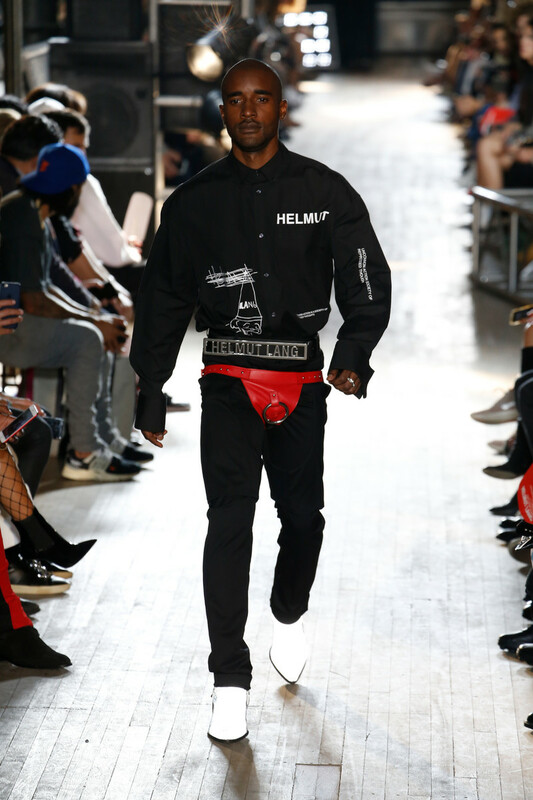 Someone then thought to cut the sock foot into a thong, thus extending the overall length. 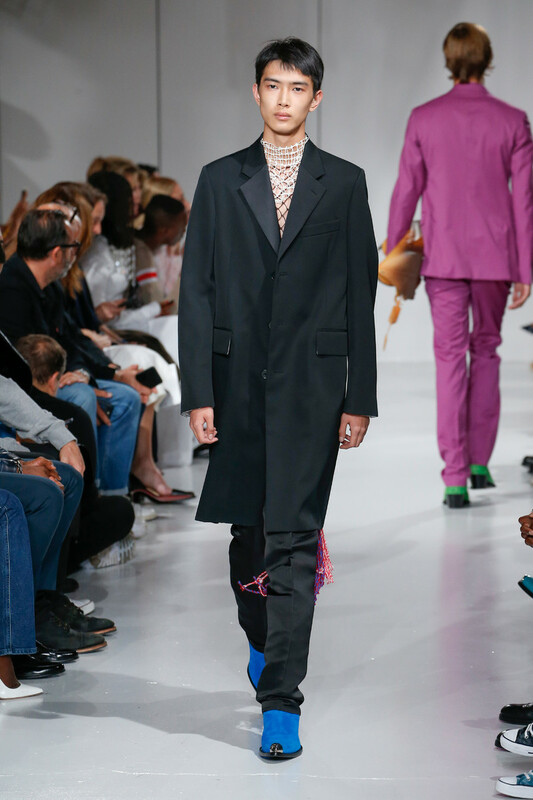 Tailored tube socks. 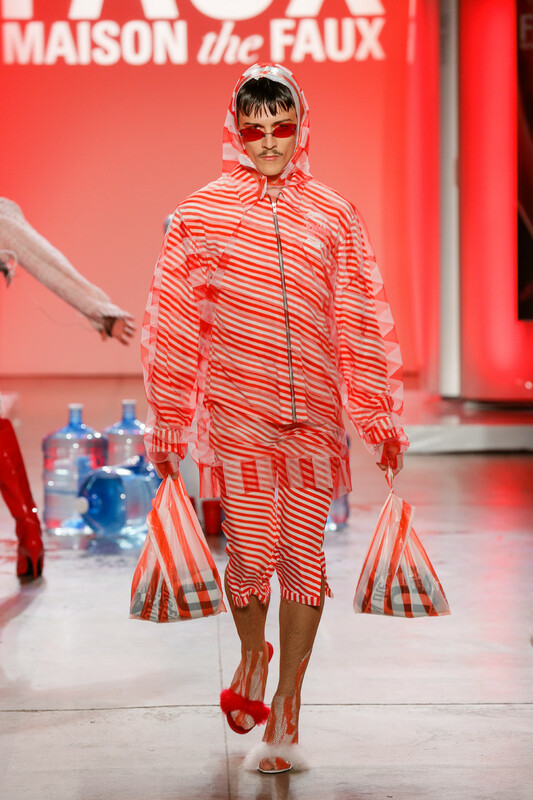 Aspiration realized takes many forms. 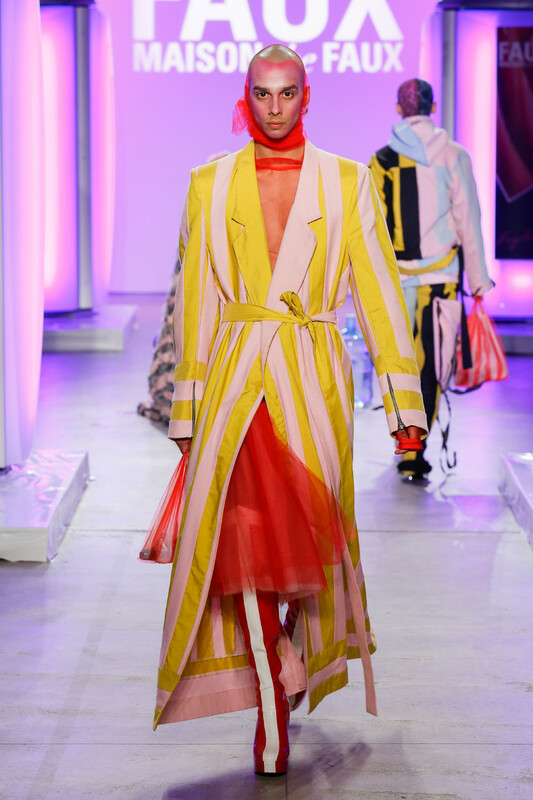 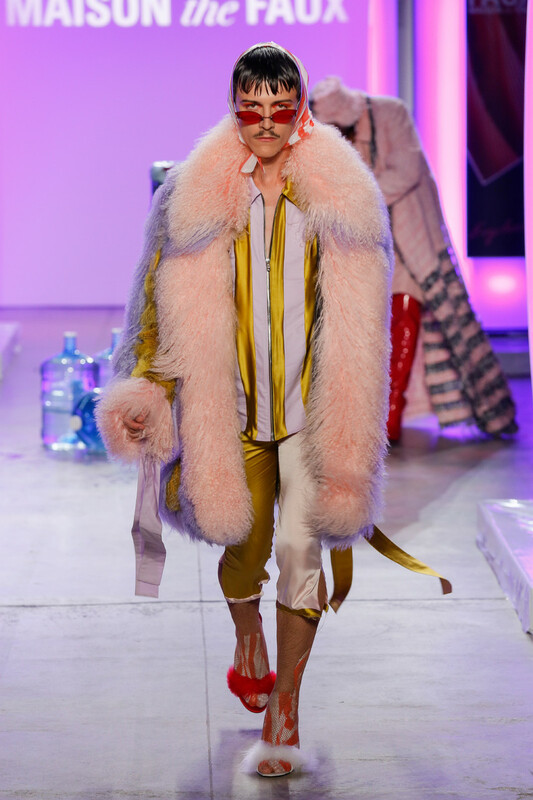 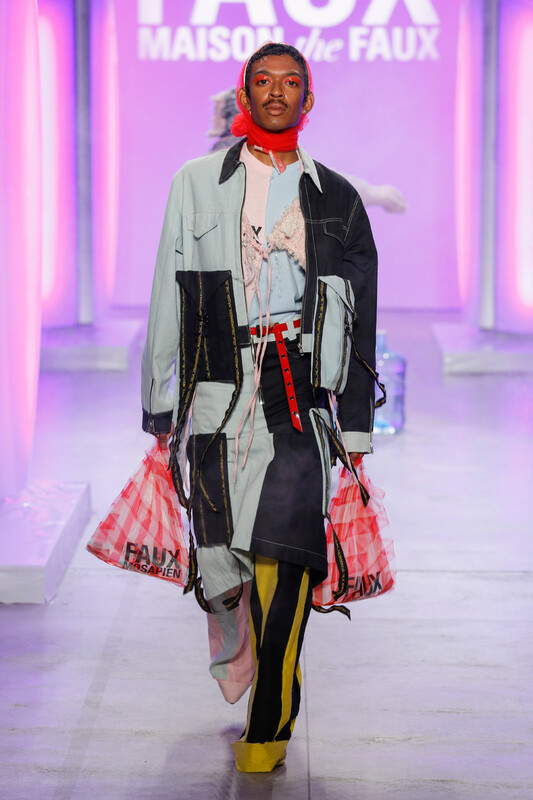 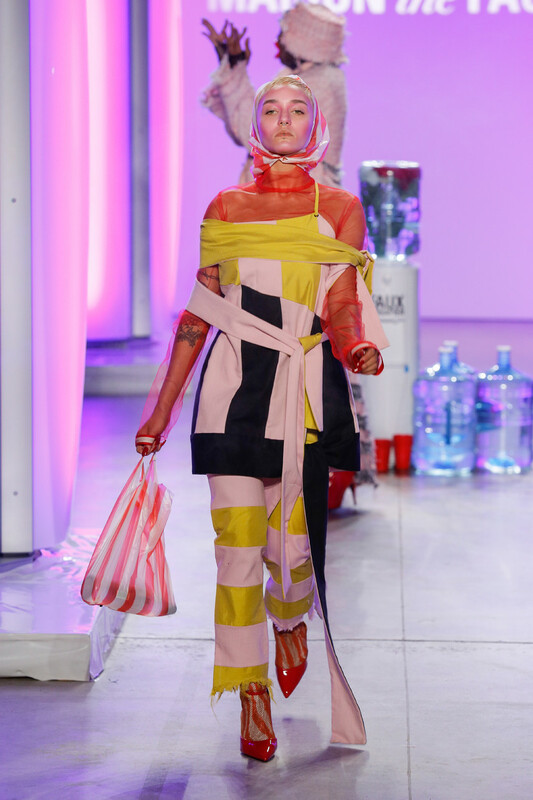 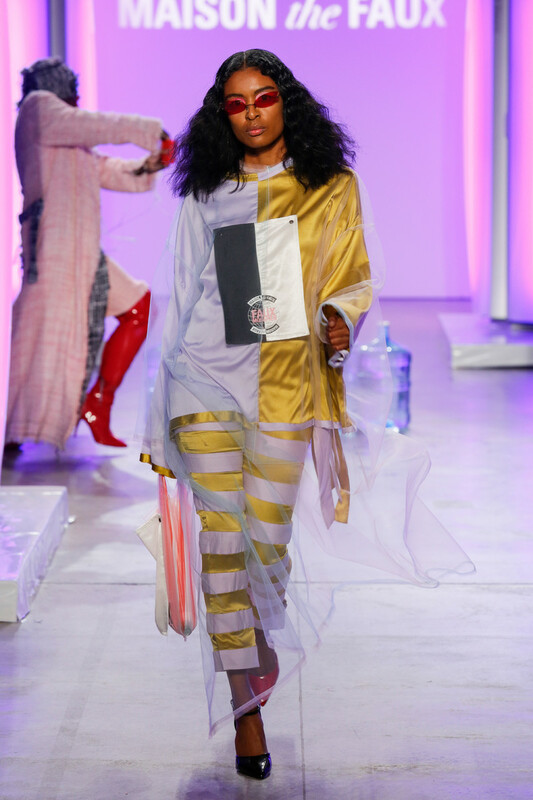 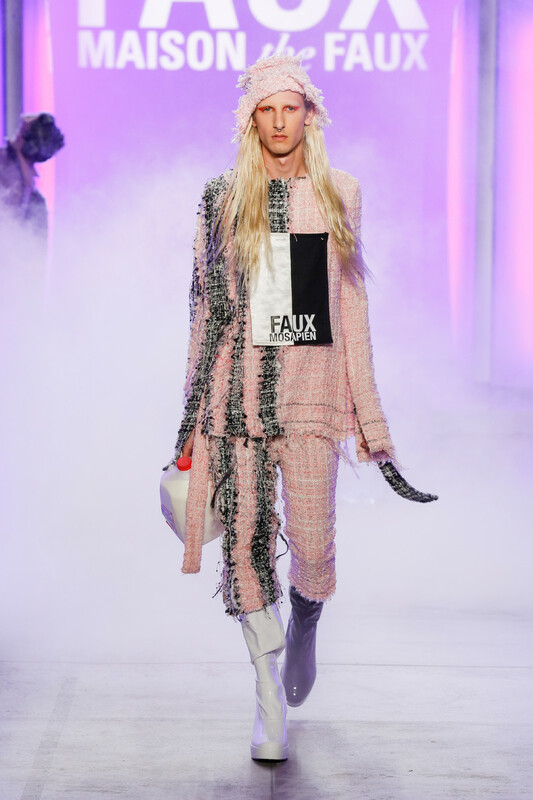 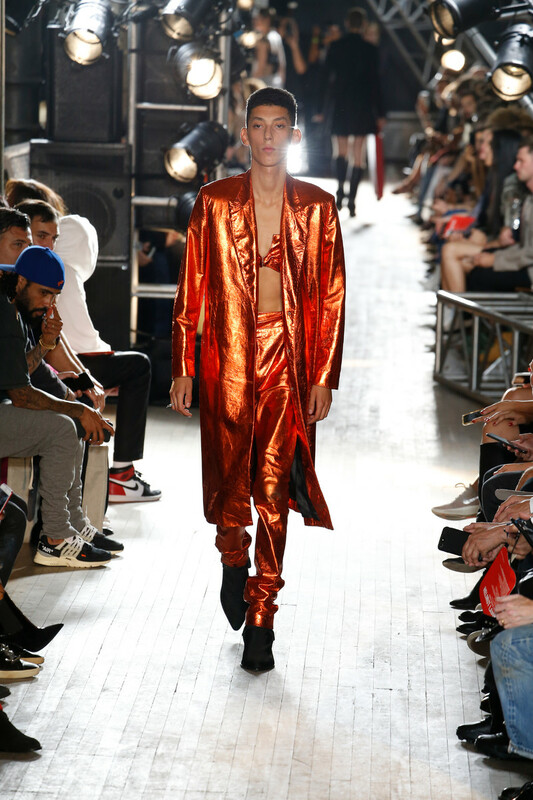 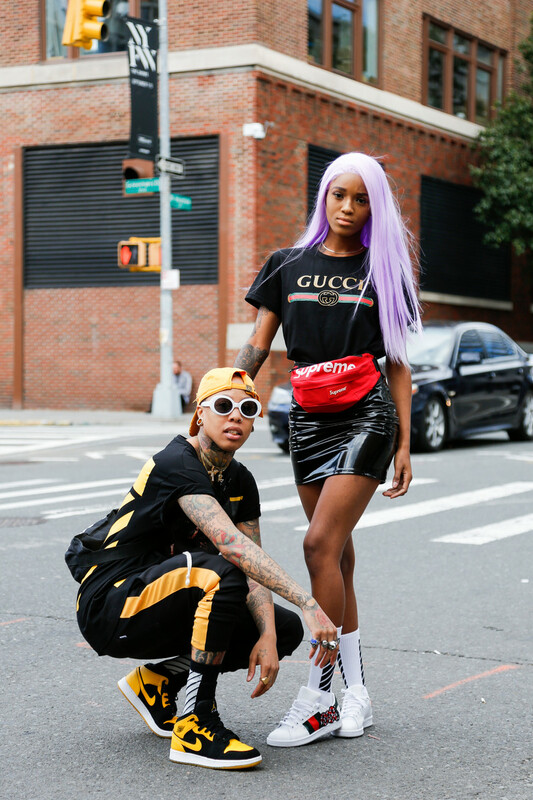 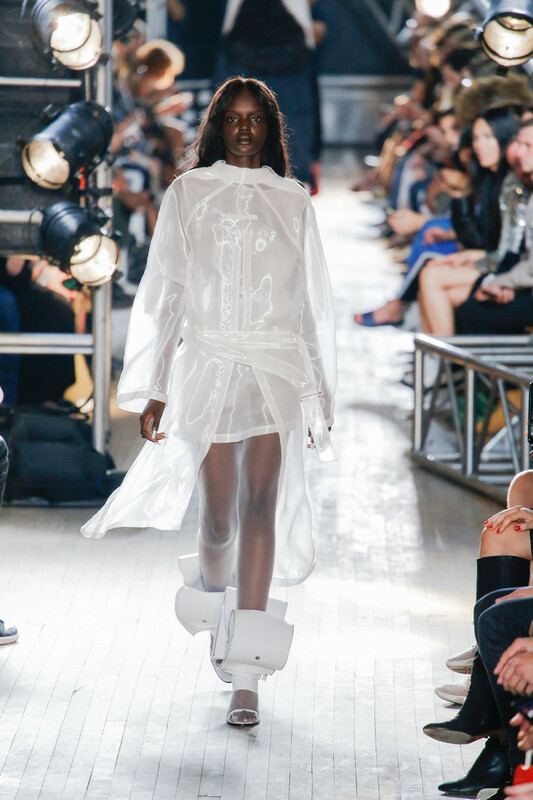 MAISON the FAUX surprised NYFW with their FAUXmosapien filled world. 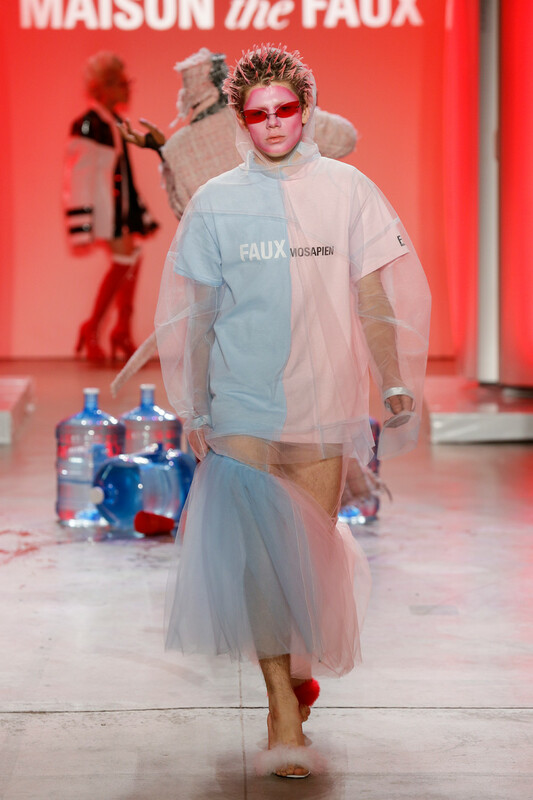 During their show all of the models joined into a FAUX ritual. 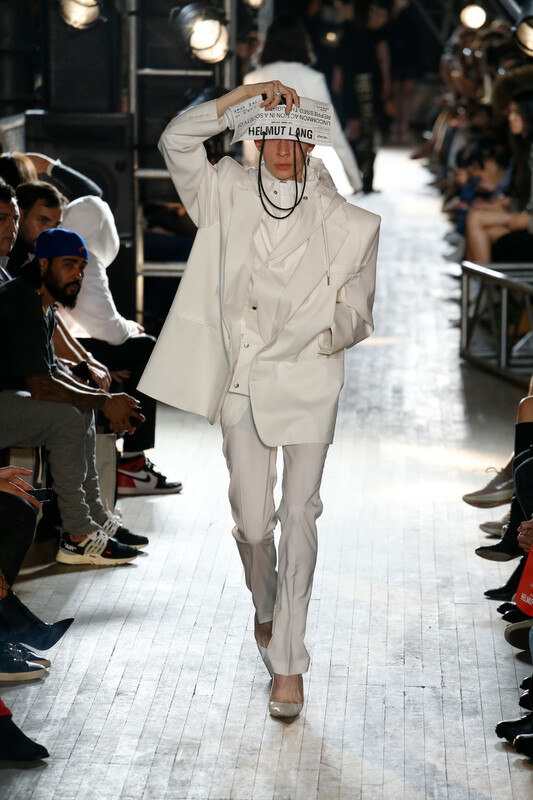 A ritual in which they surrendered themselves to the false promise of a new and better world. 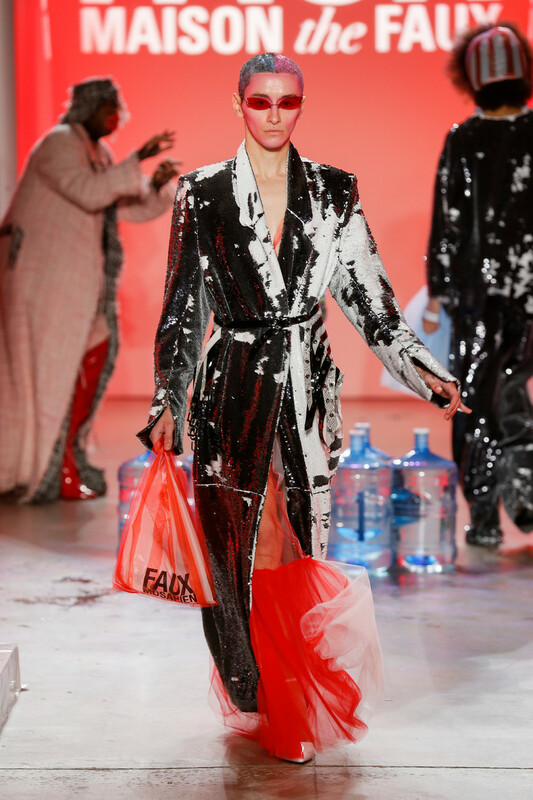 During this ritual, models were baptised from a water dispenser, christening them as “FAUXmosapiens”, before entering vertical, incubator-like tanning beds. 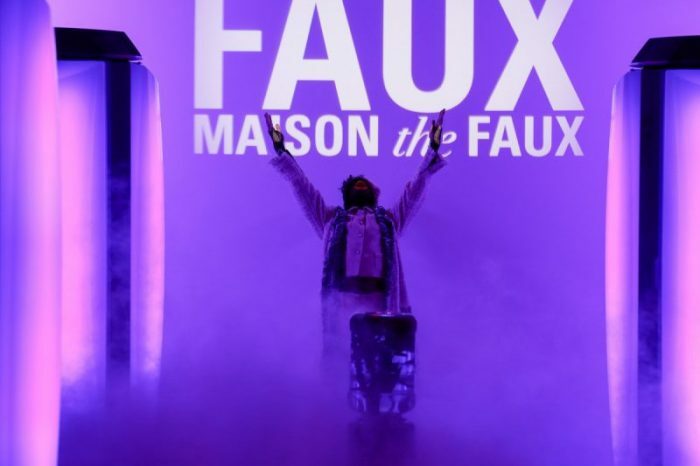 In a world that (still) struggles to see us all as individual human beings, MAISON the FAUX offers an alternate world; the FAUXmosapien world. 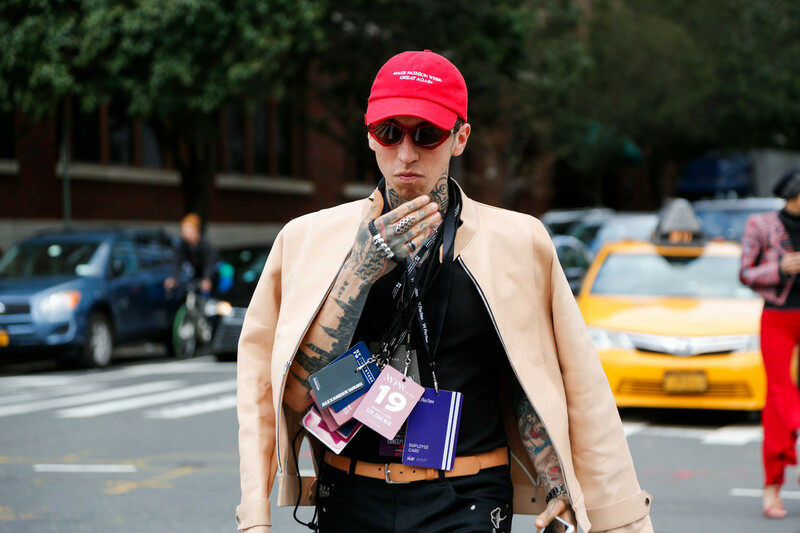 An evolved world in which everyone can be themselves and let go of beauty ideals and trends.………. 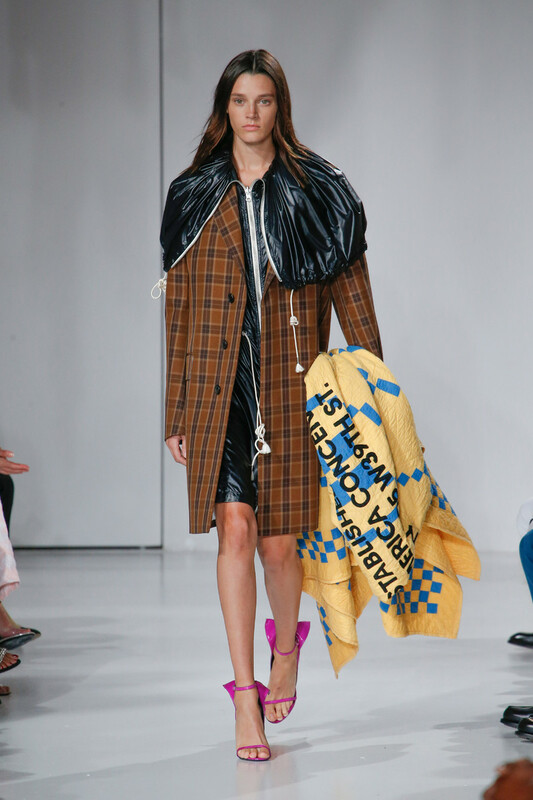 Do we sound convincing? 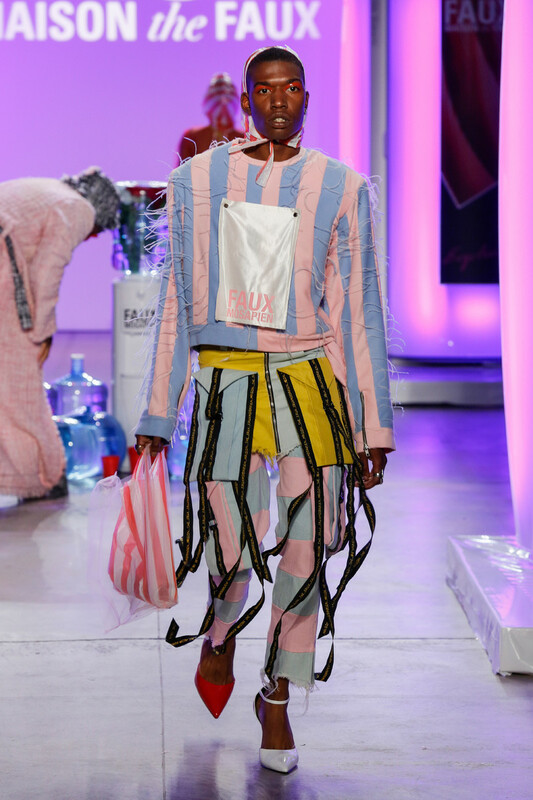 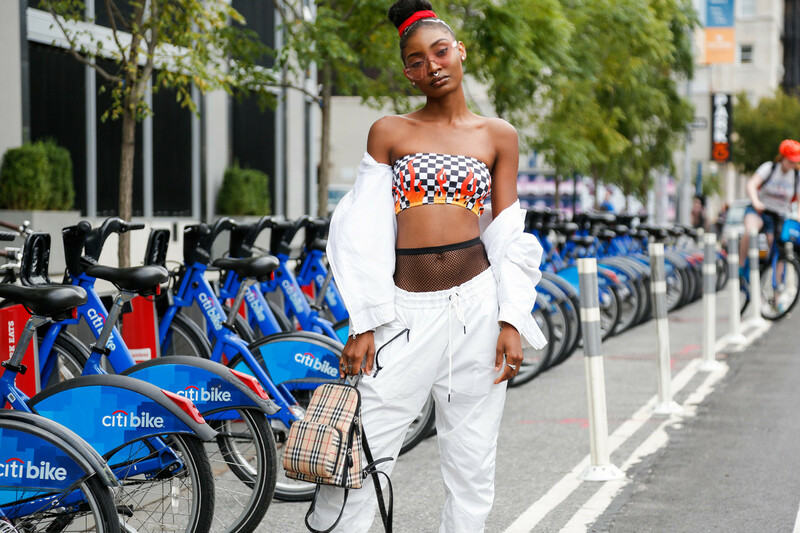 The SS18 humanwear collection was all about joining, mixing, combining strict borders and patterns into an eclectic diverse image. 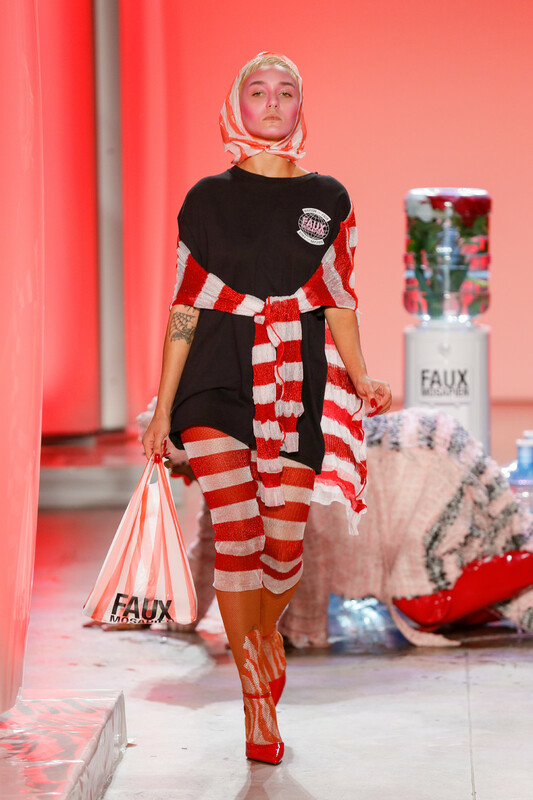 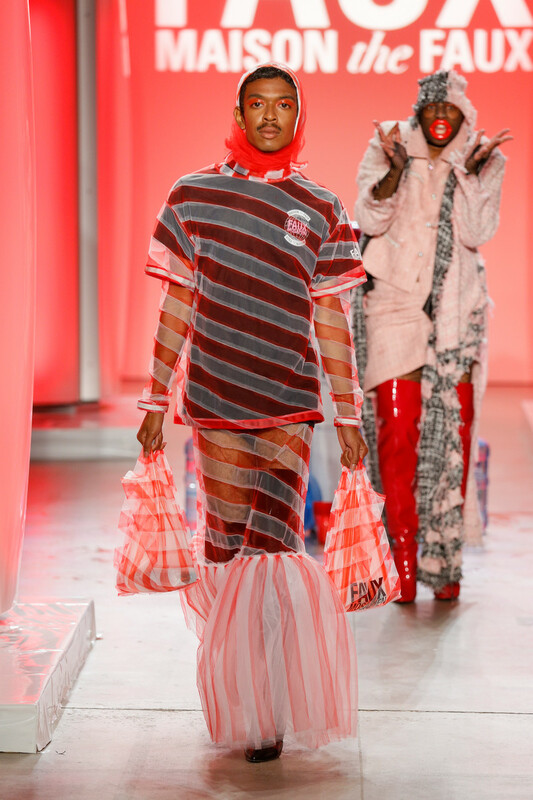 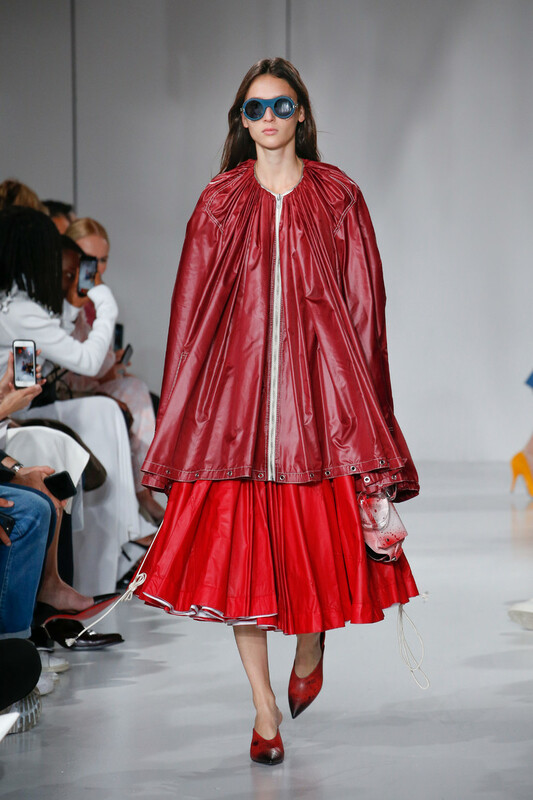 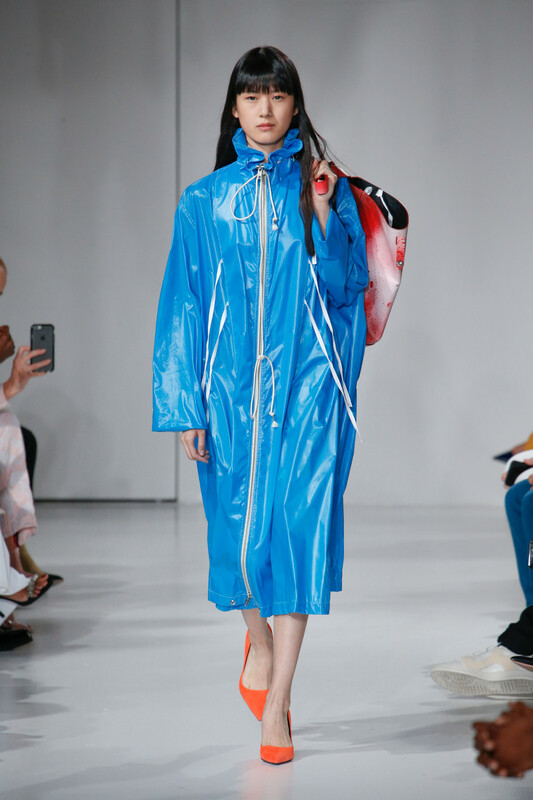 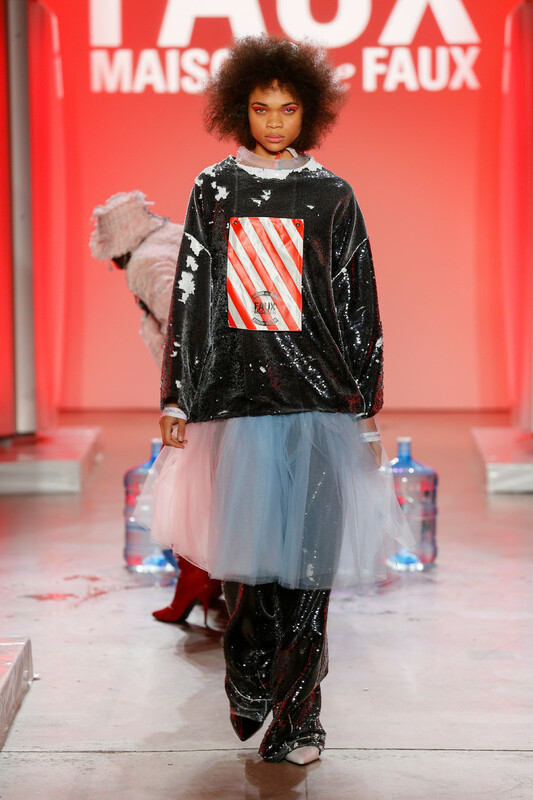 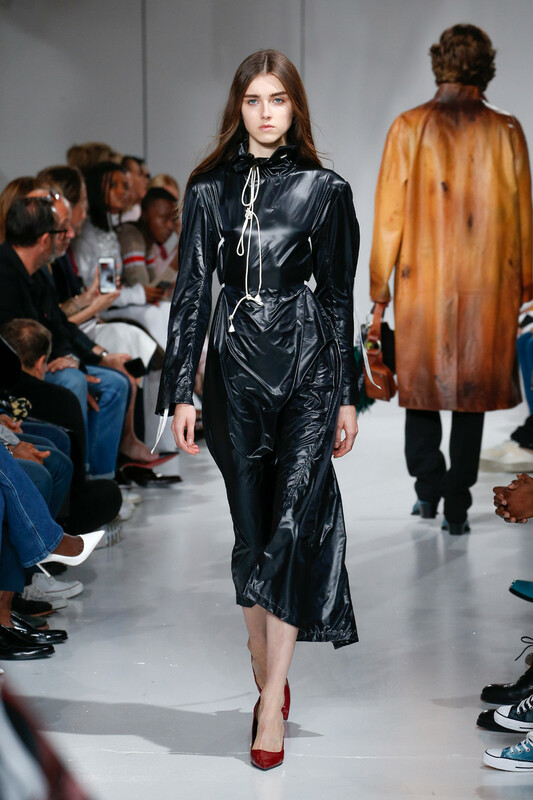 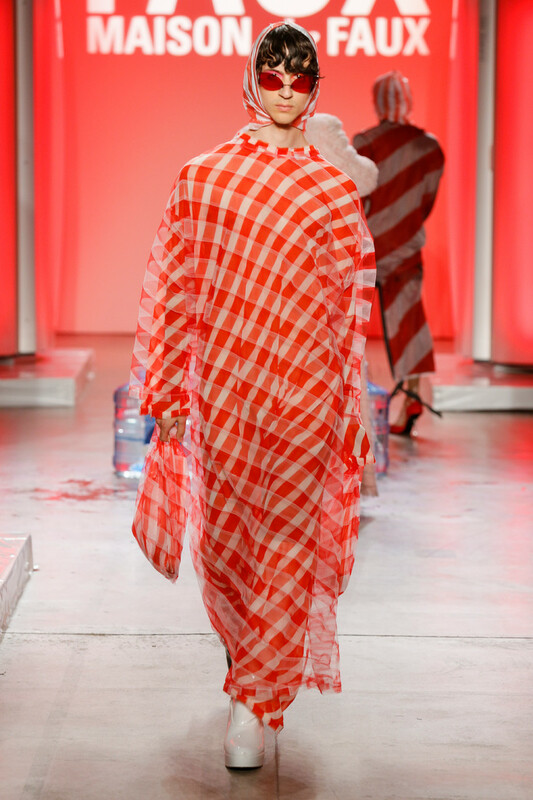 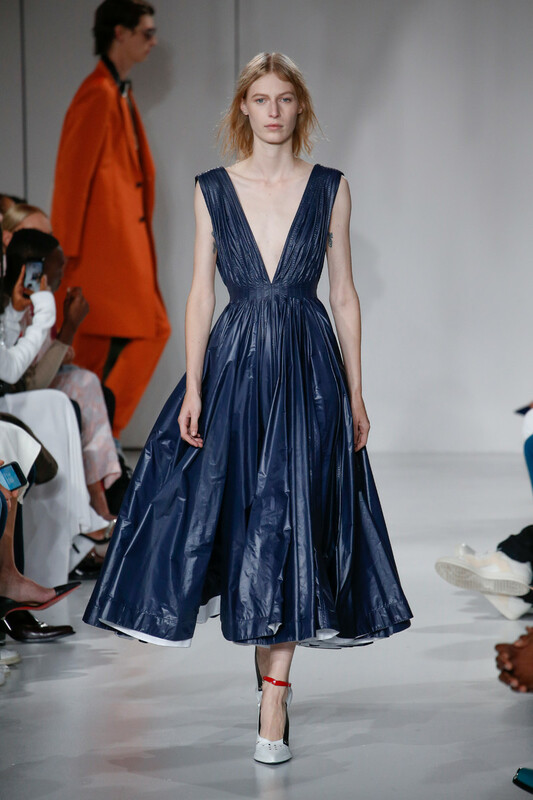 Mermaid dresses in striped tule, multicolored statement coats, sunsets and globes, copy/paste denim and leather silhouettes, red plastic disposable bags and stripes, stripes, stripes and stripes. 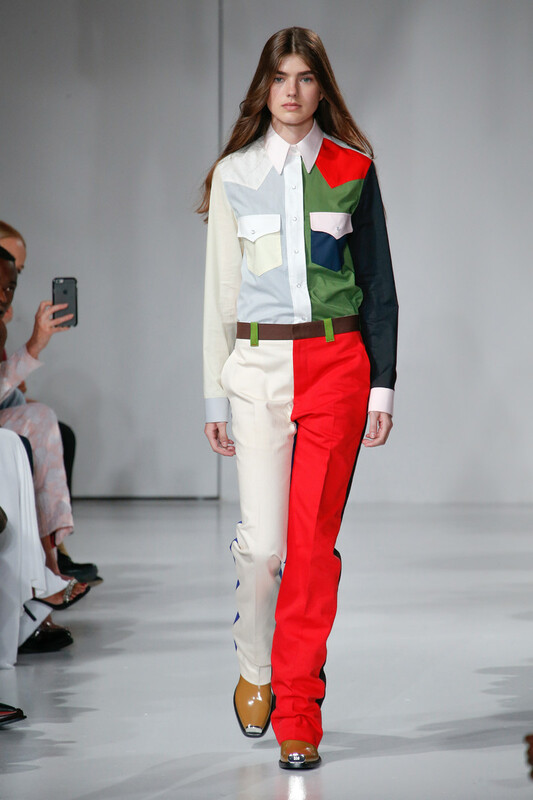 The colour pallet was defined by graphic contrasts and pastels.